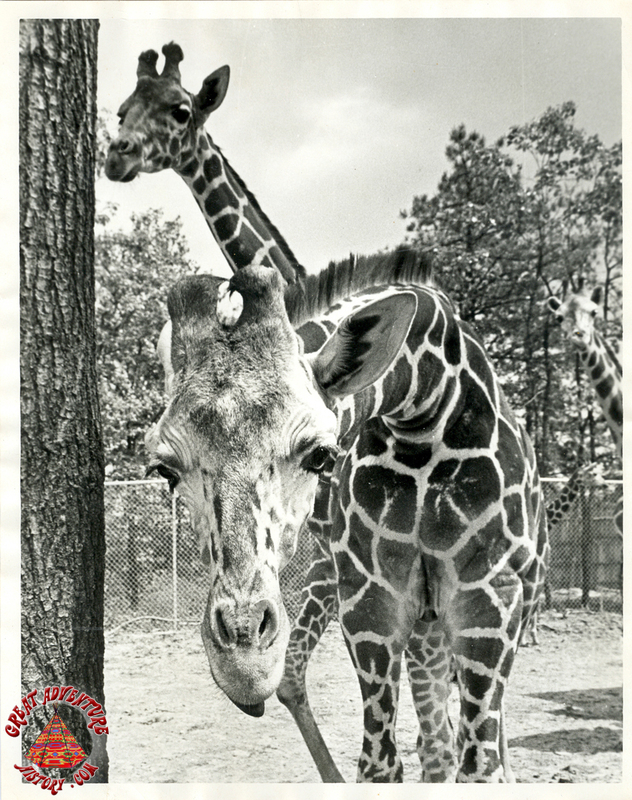 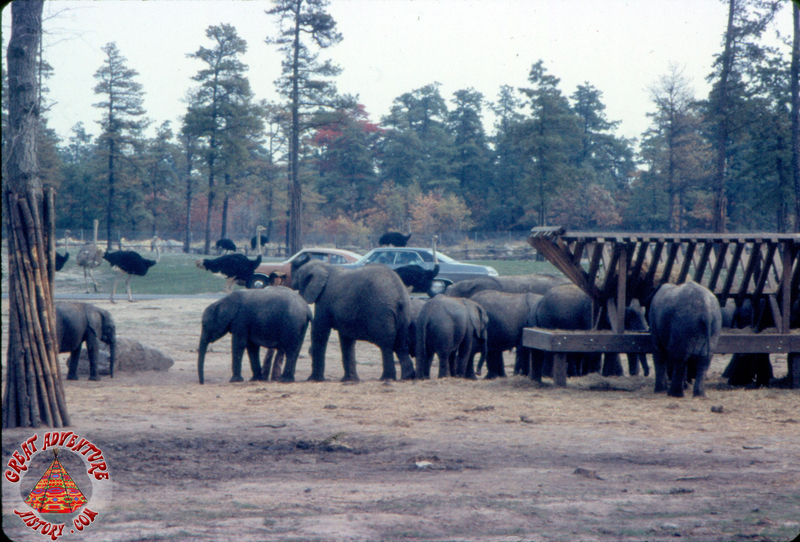 As the 1970's dawned, the concept of zoos began to fade in popularity around the country as people began to feel that the confines of cages were cruel and inhumane. 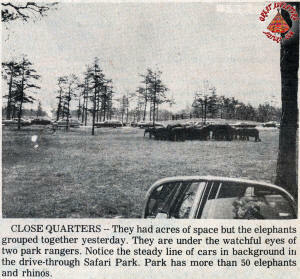 In response, safari parks began to crop up, allowing the animals to roam freely while the people were confined to vehicles. 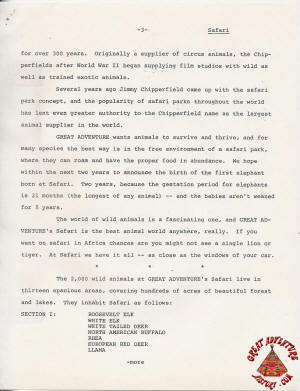 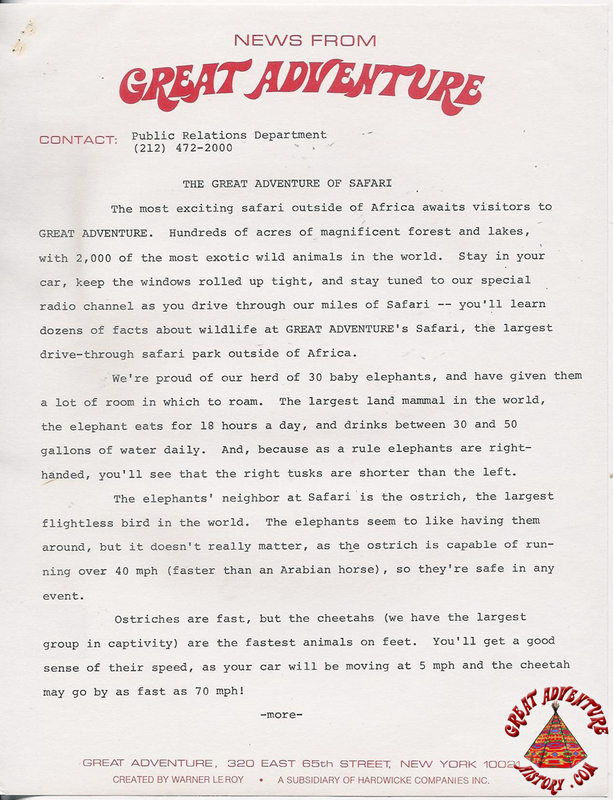 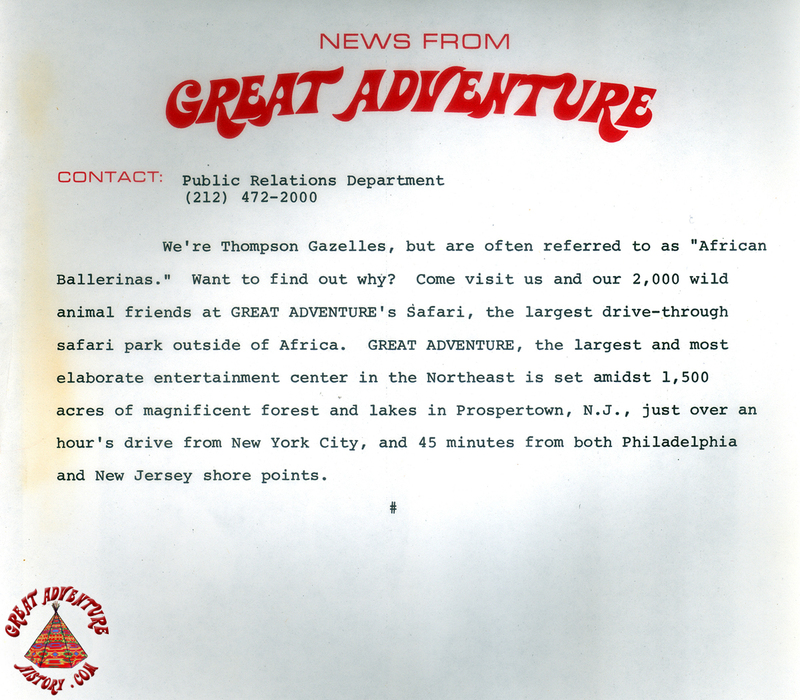 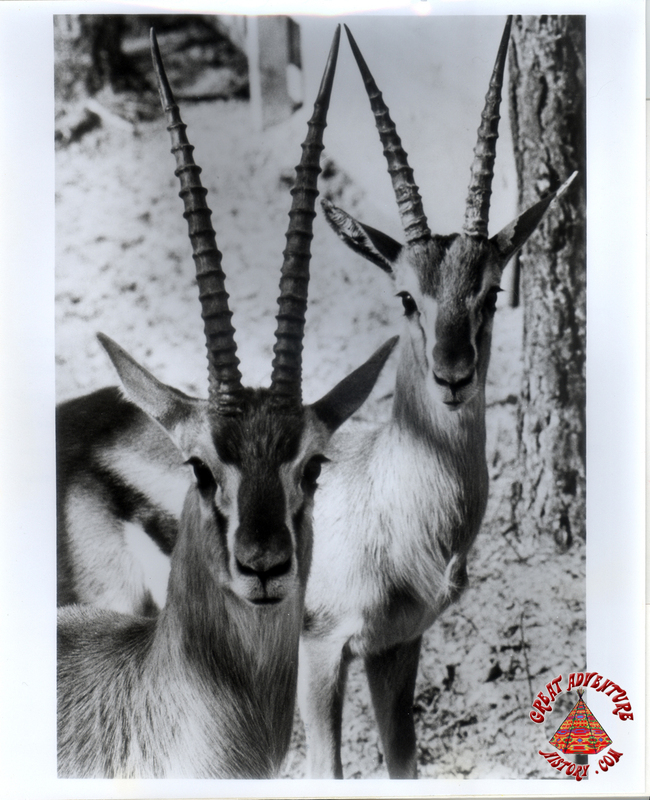 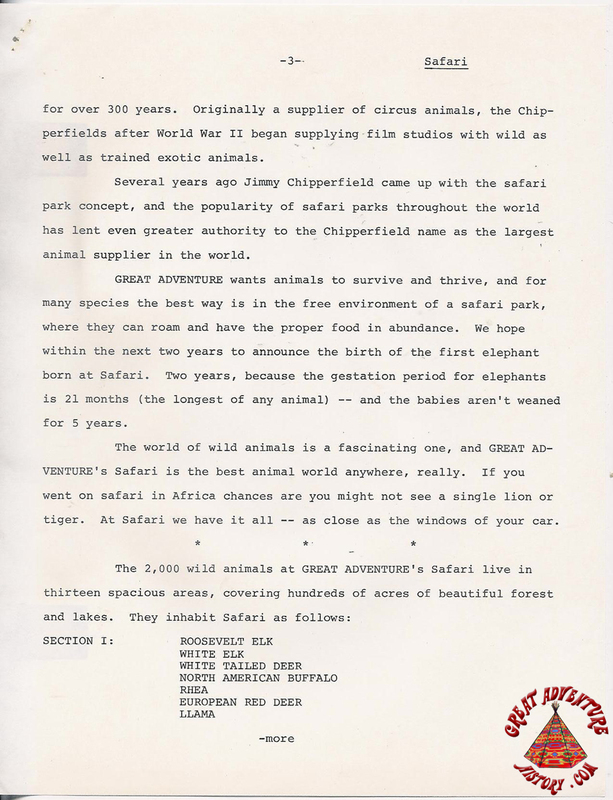 Great Adventure looked to be the biggest and the best in everything they did, and the Safari was built and billed as the "Largest Drive-Through Safari Outside of Africa" with hundreds of free roaming animals in a naturalistic environment. 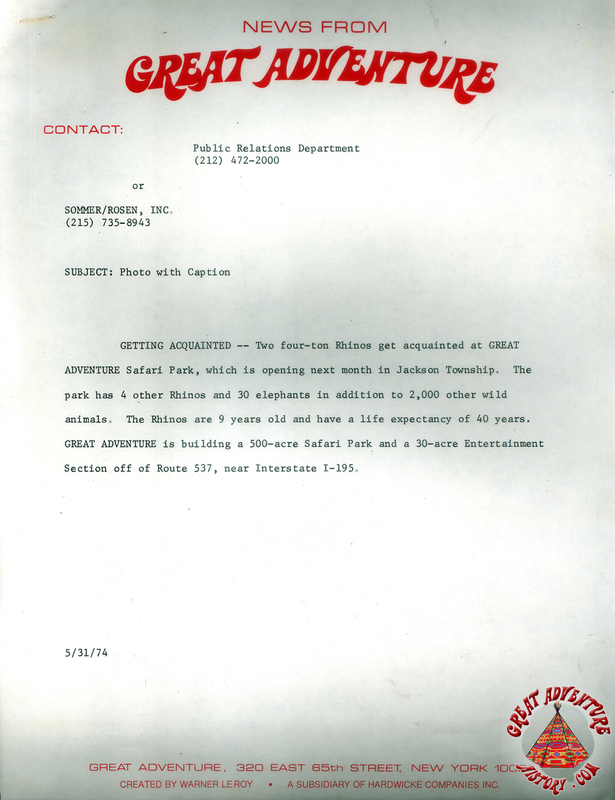 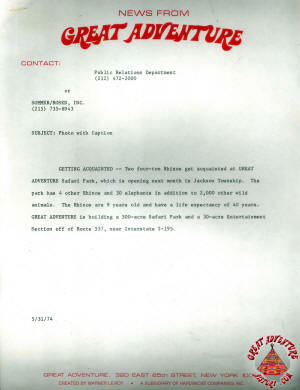 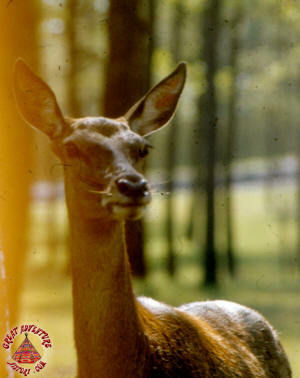 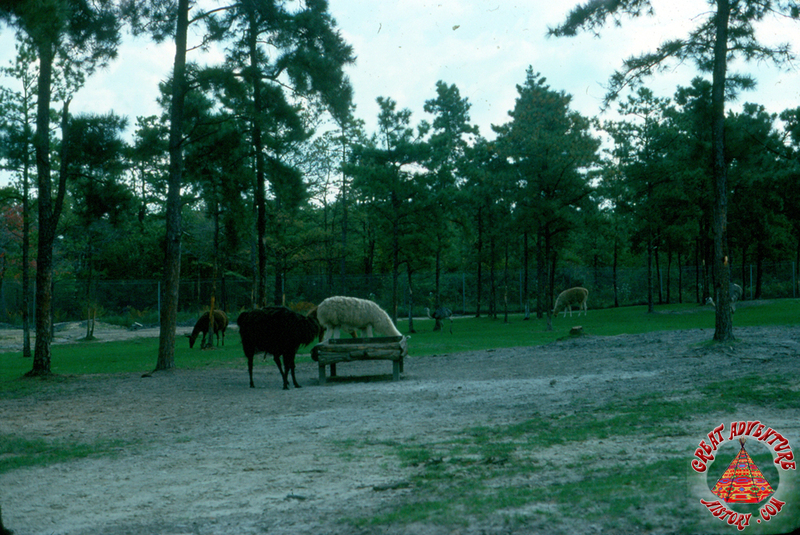 All contents of this Spotlight are from the Safari Park's first season in 1974. 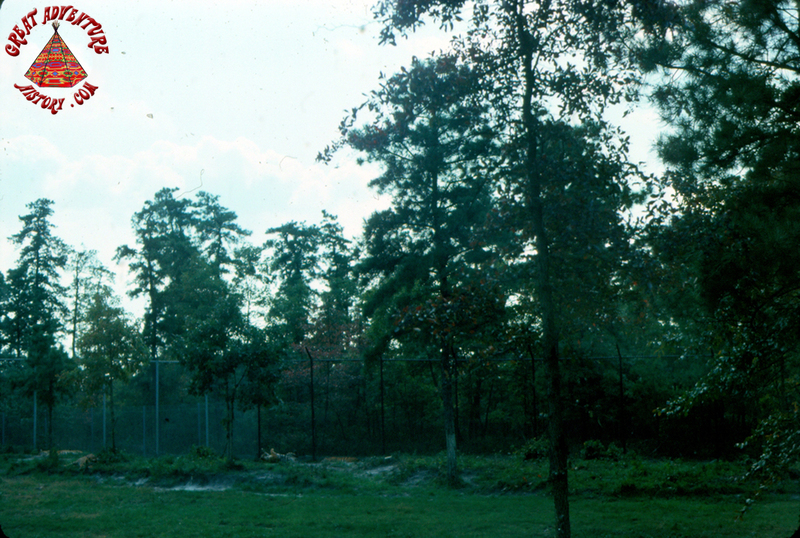 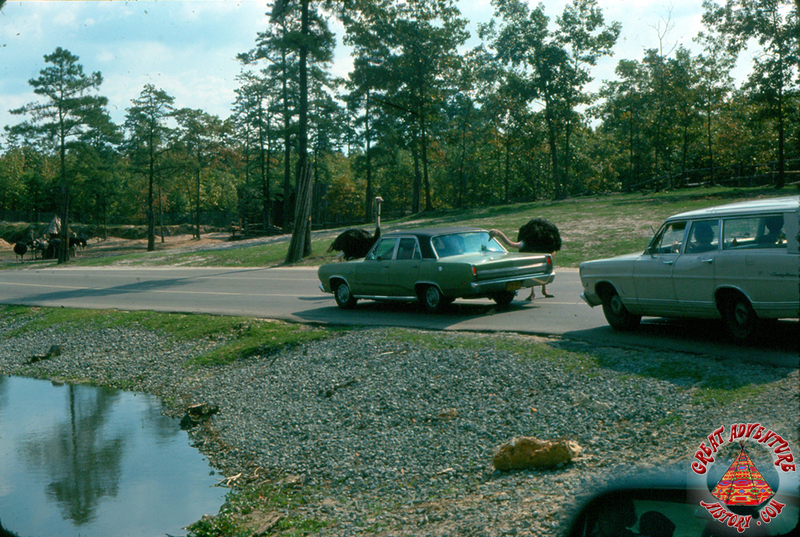 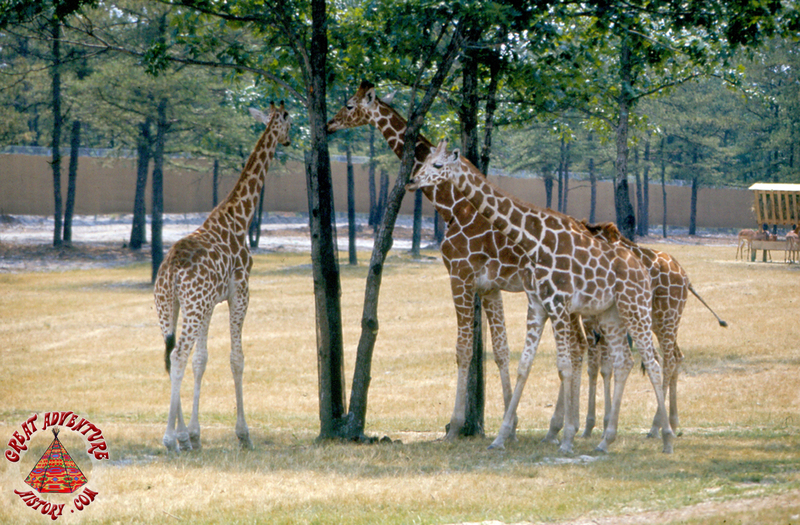 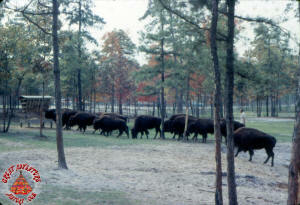 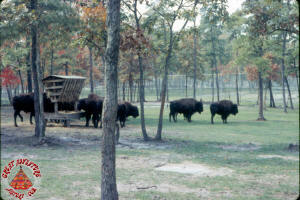 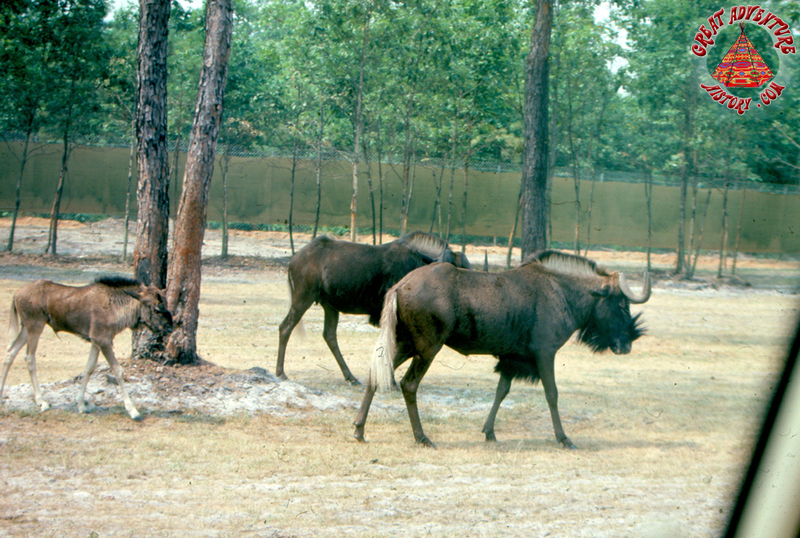 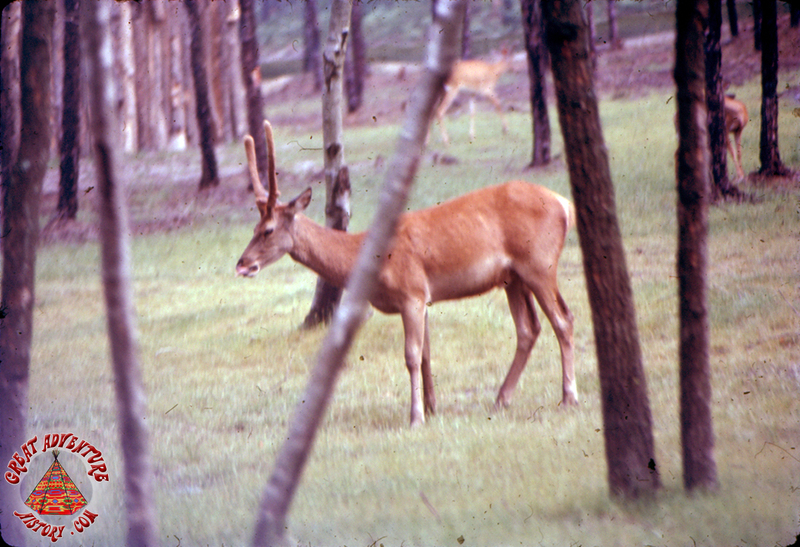 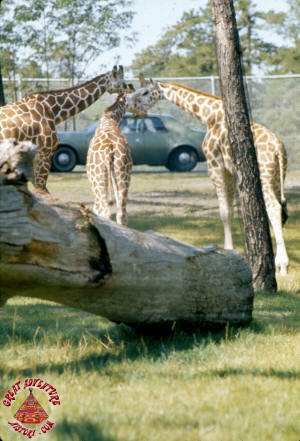 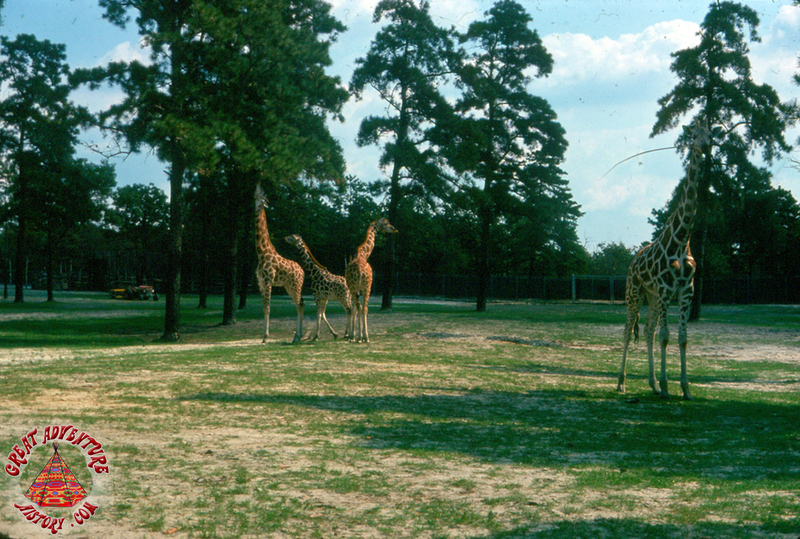 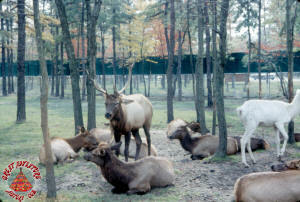 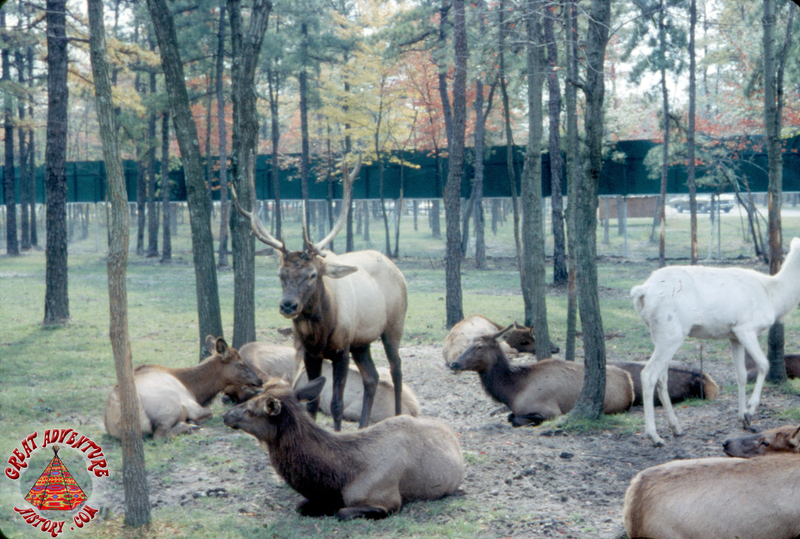 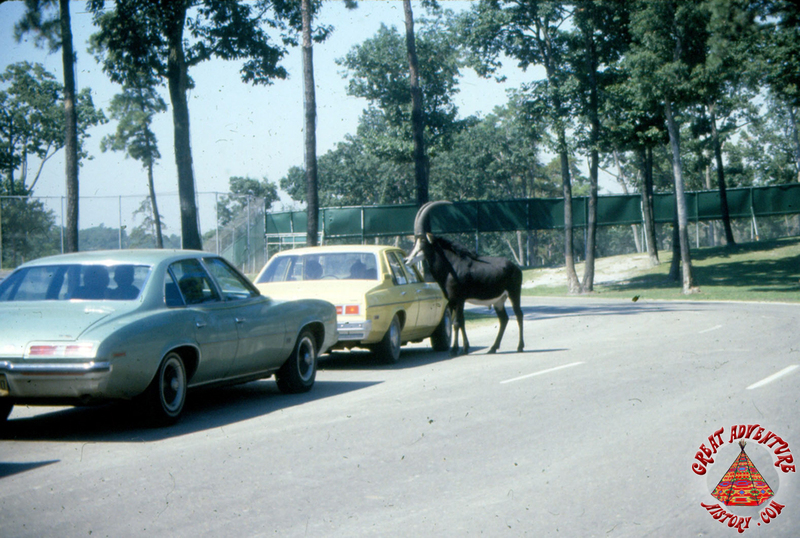 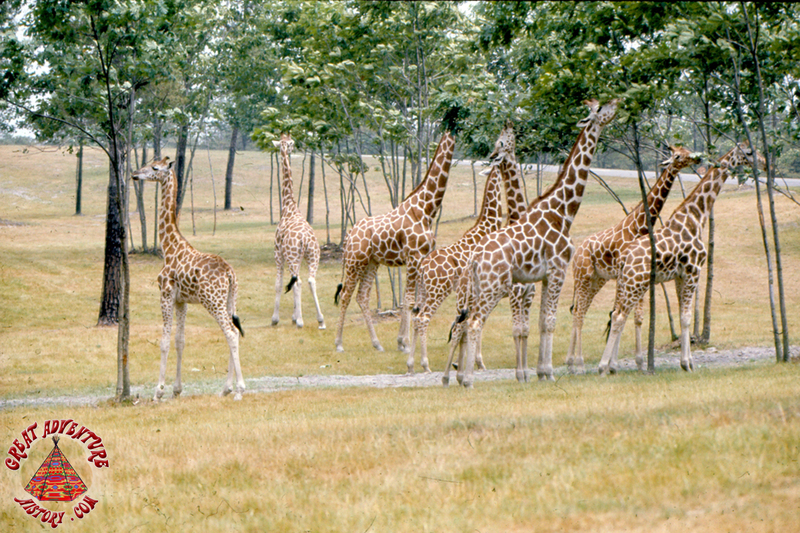 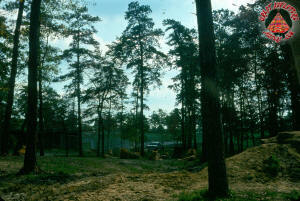 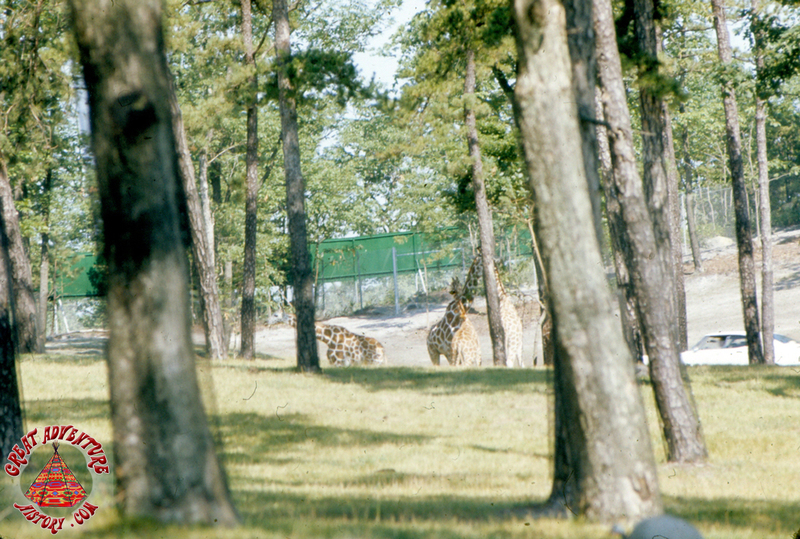 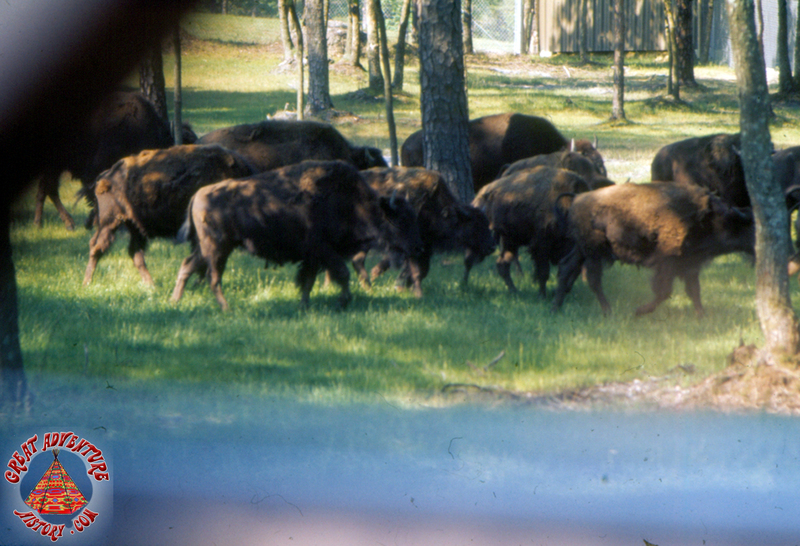 Covering several hundred acres of lush forest and lakes, the Safari was designed so that guests could transverse the park via a three lane roadway. 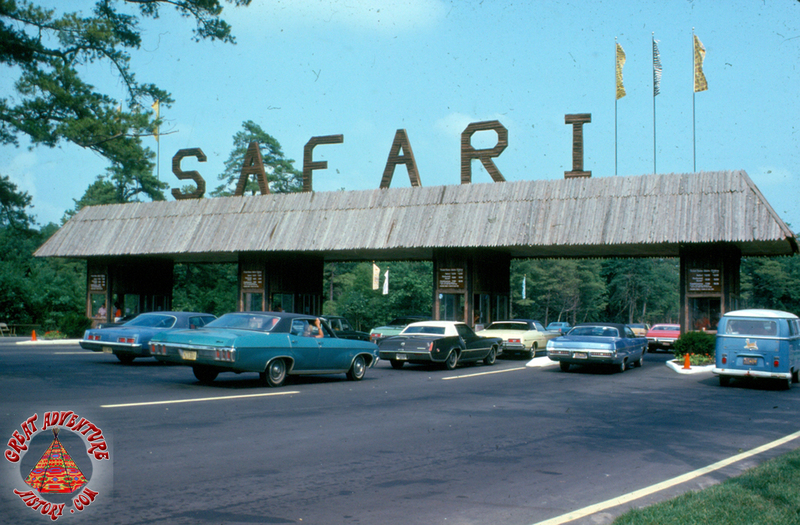 Cars entered the Safari through the rustic looking toll plaza. 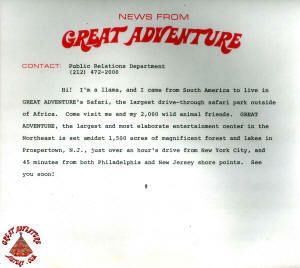 Here guests paid to enter and were given the rules and a guide pamphlet. One common problem encountered in the Safari, especially on hot summer days, was car radiators overheating in the stop and go traffic as people crawled through to watch the animals. 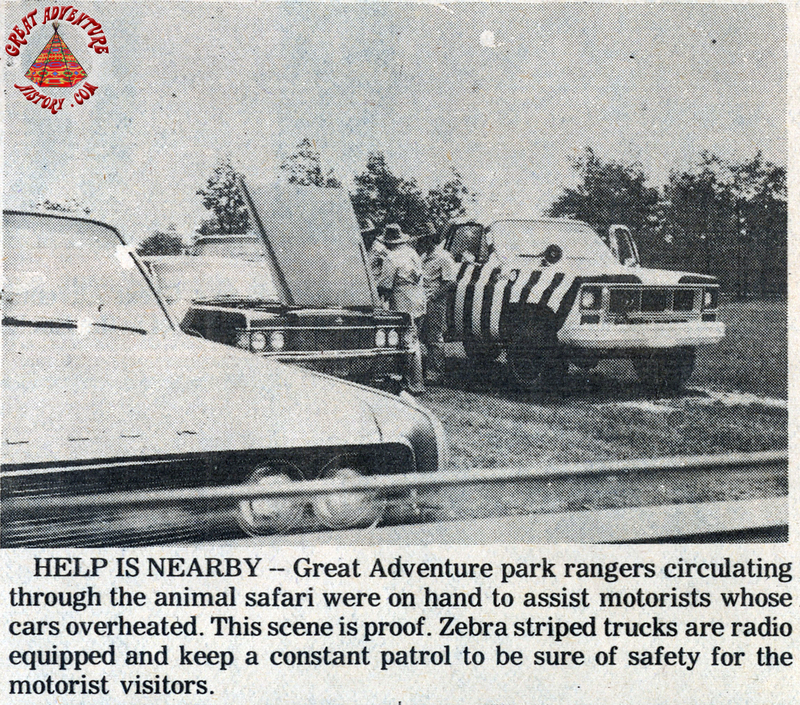 The Safari wardens spent almost as much time helping stranded motorists as they did tending their animals. 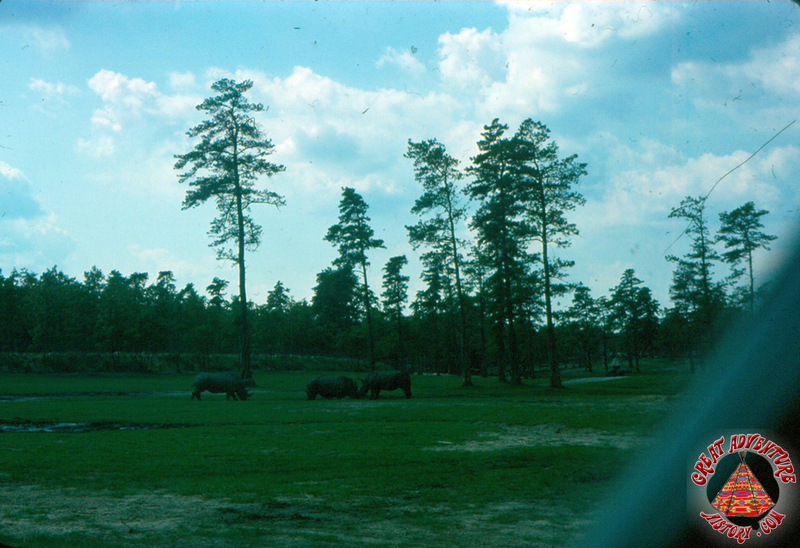 Although initial plans were for all of the park's animals to cohabitate the 450 acres without any fences separating the species similar to how they live in nature, it was soon learned that dividing fences were going to be a requirement if all the species were going to survive. The park was soon divided into 13 sections. 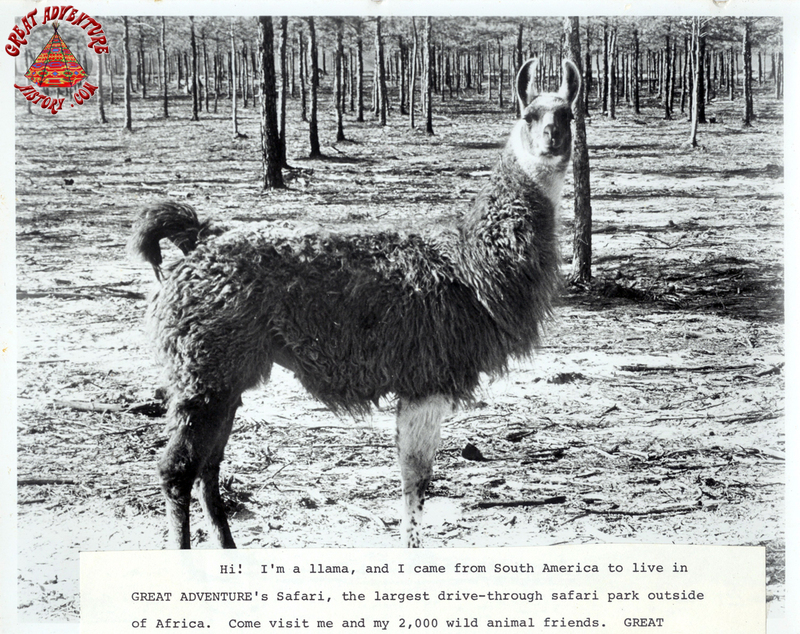 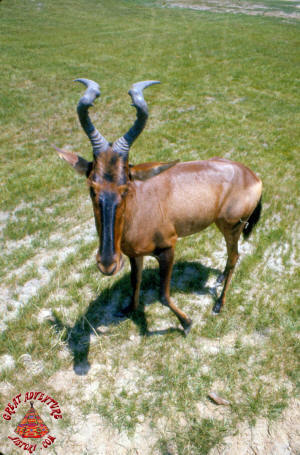 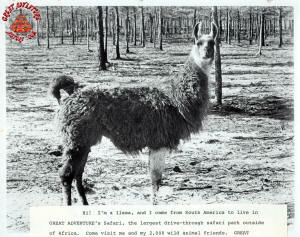 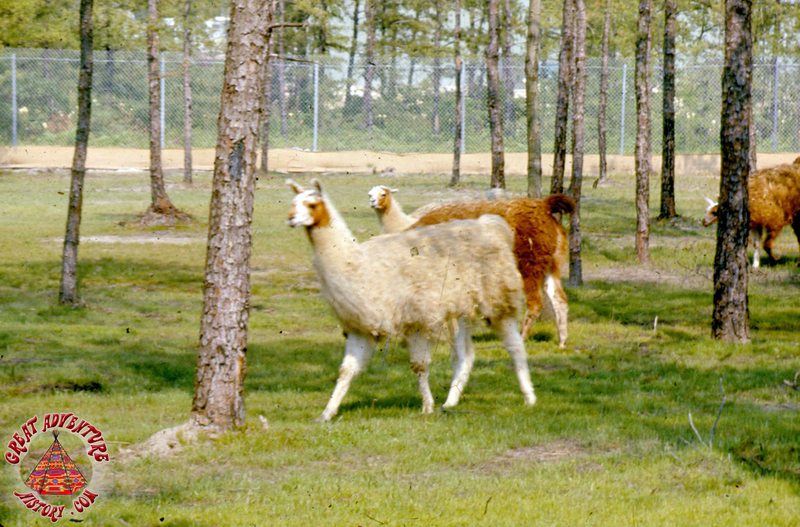 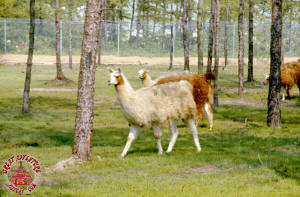 The first area of animals encountered featured animals of the American plains like elk and buffalo along with South American animals like llamas and rheas. 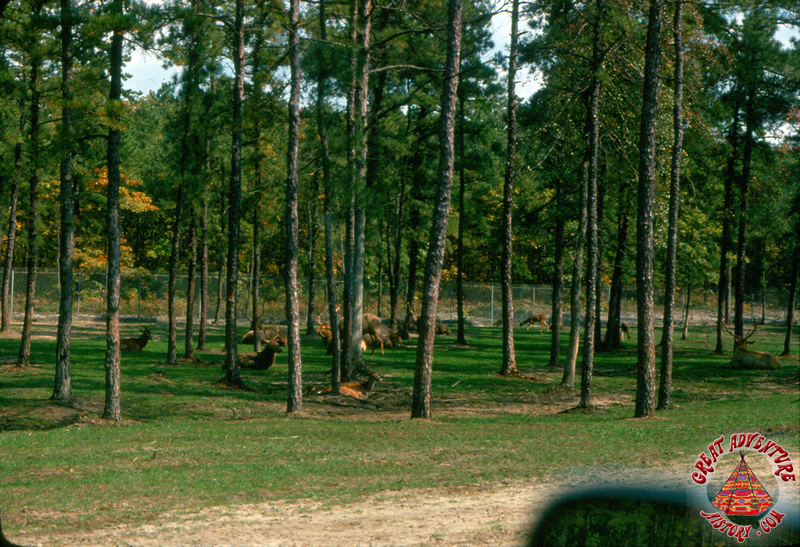 The area was left heavily wooded initially, but the trees would fall victim to the animals, storms, as well as vehicles over time. 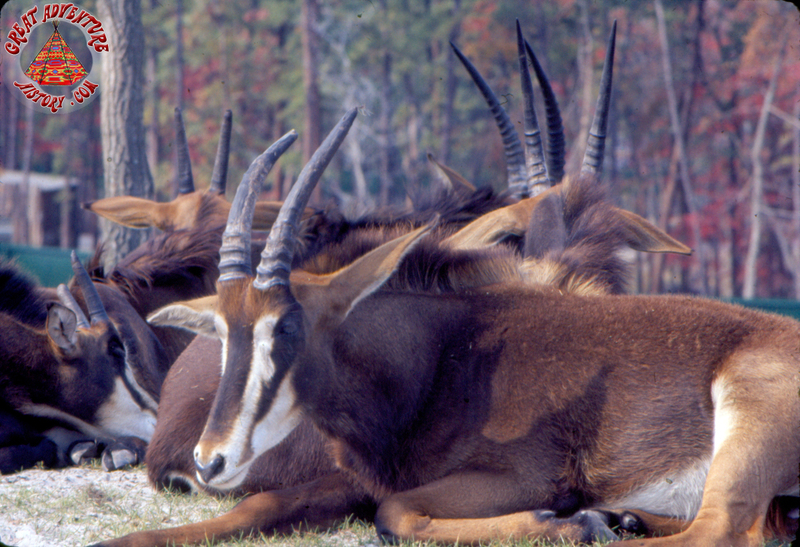 One of the biggest challenges of the Safari's grasslands was keeping them covered with grass as the herds of grazing animals often cleared the soil of all vegetation. 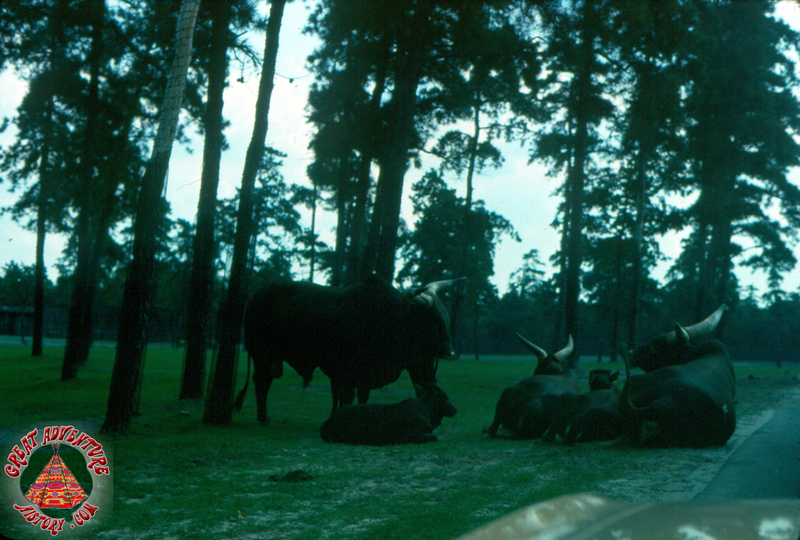 The sandy soil was poor for growing grass to start with, and the herds tended to clear it all despite being given hay and feed throughout the day. 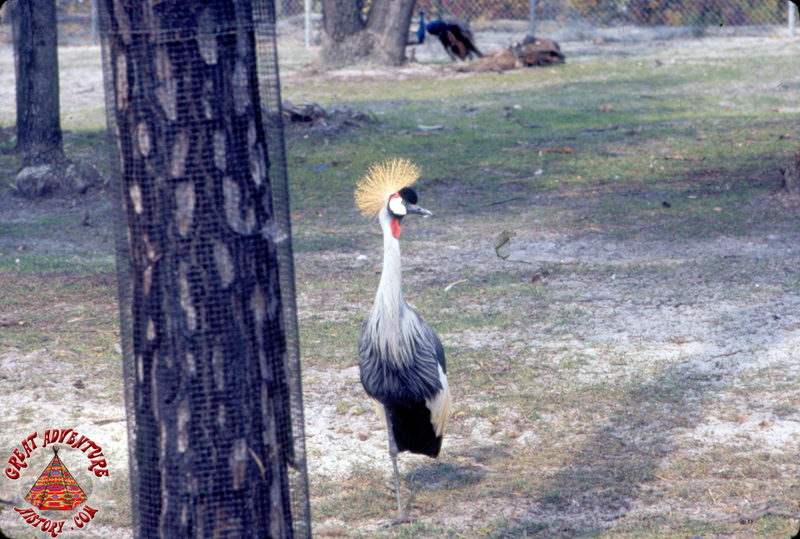 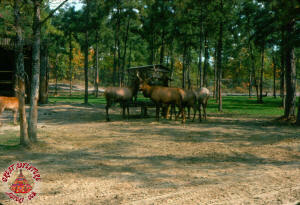 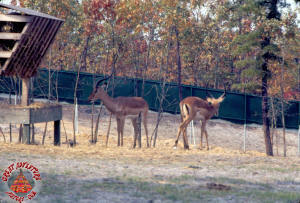 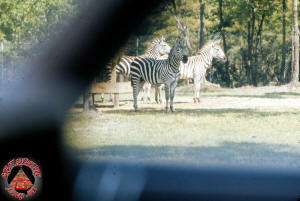 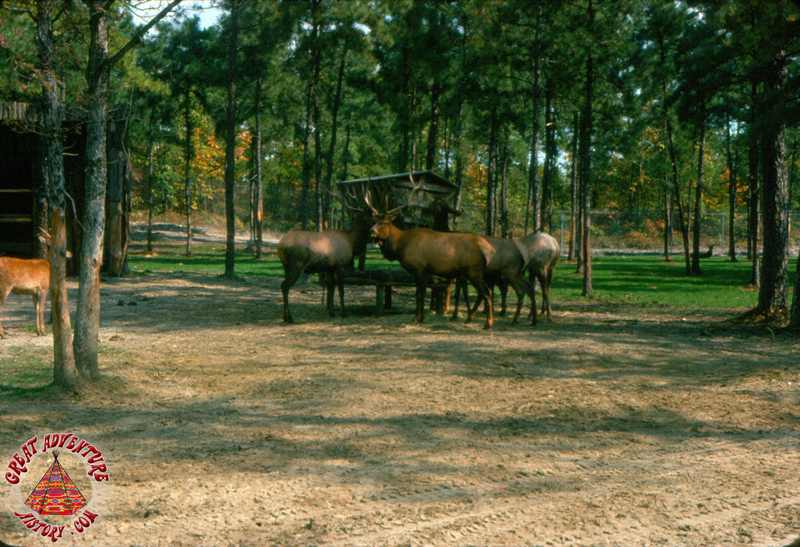 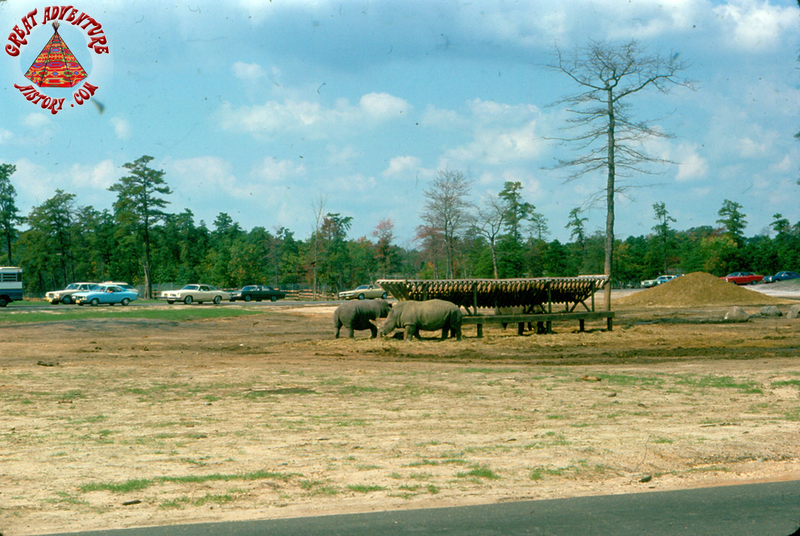 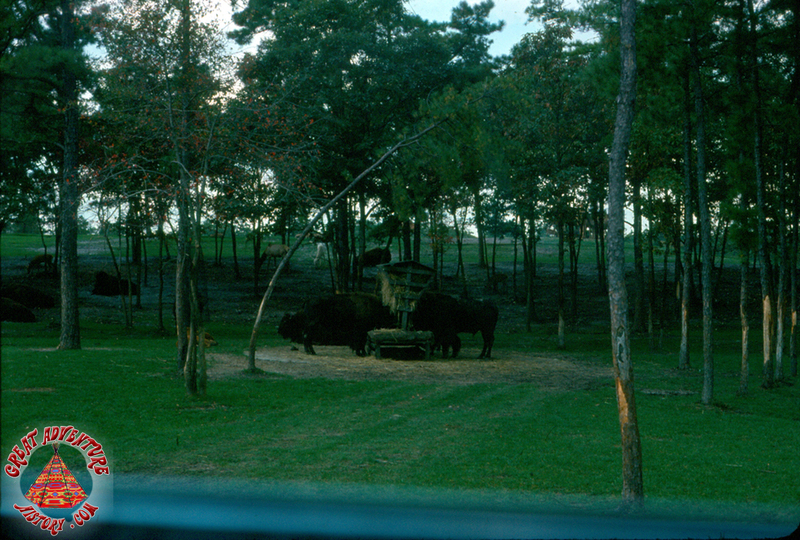 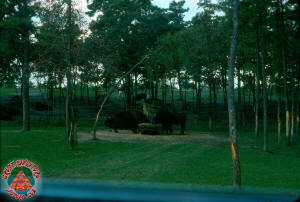 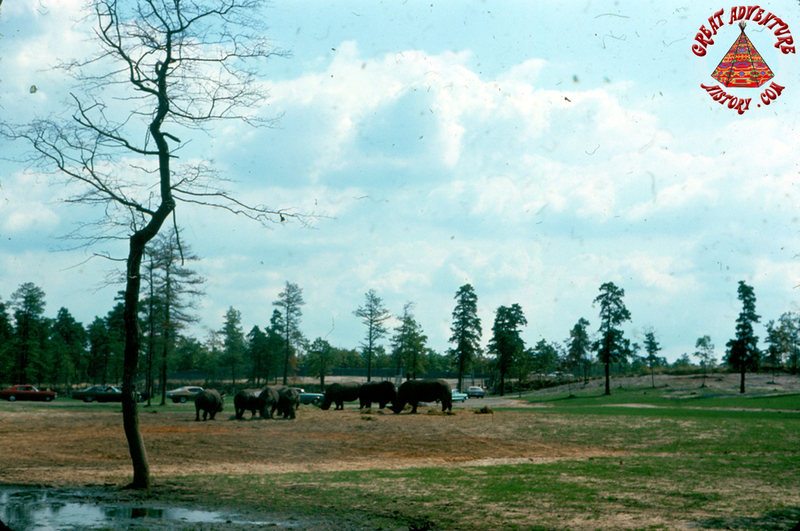 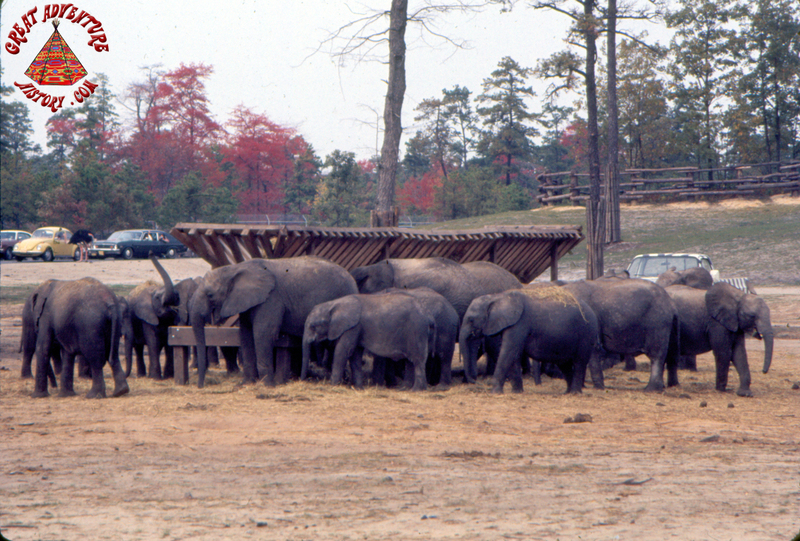 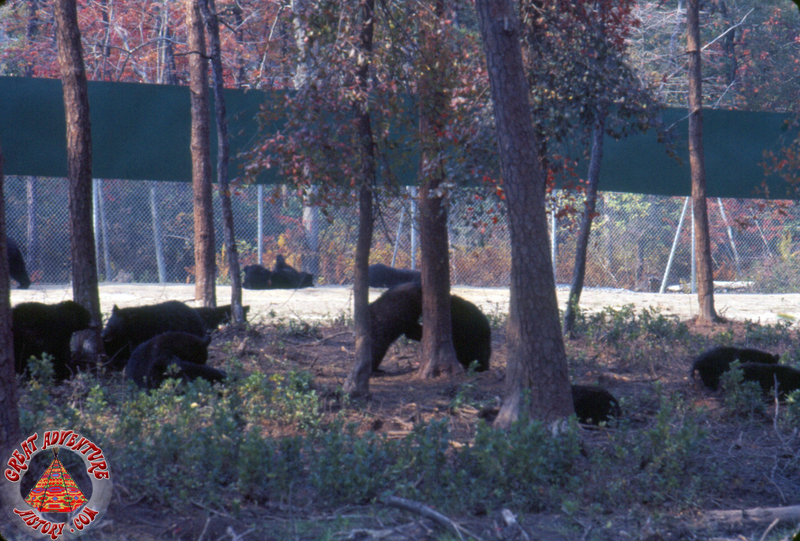 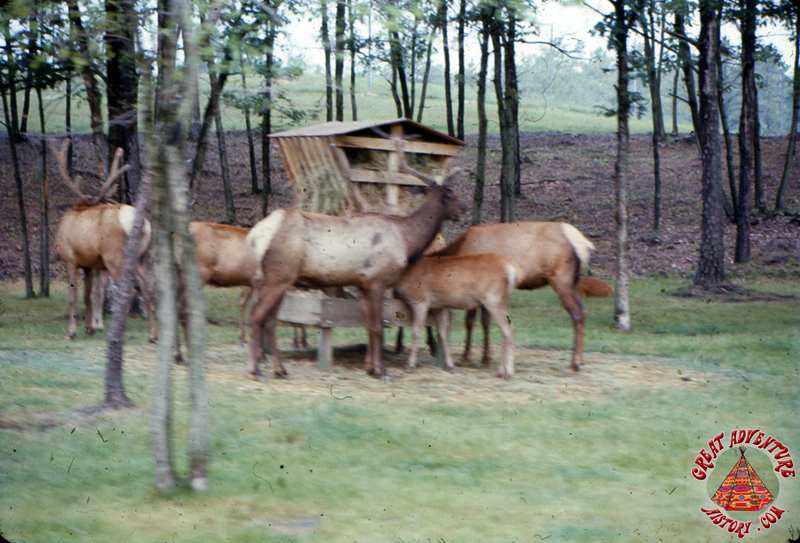 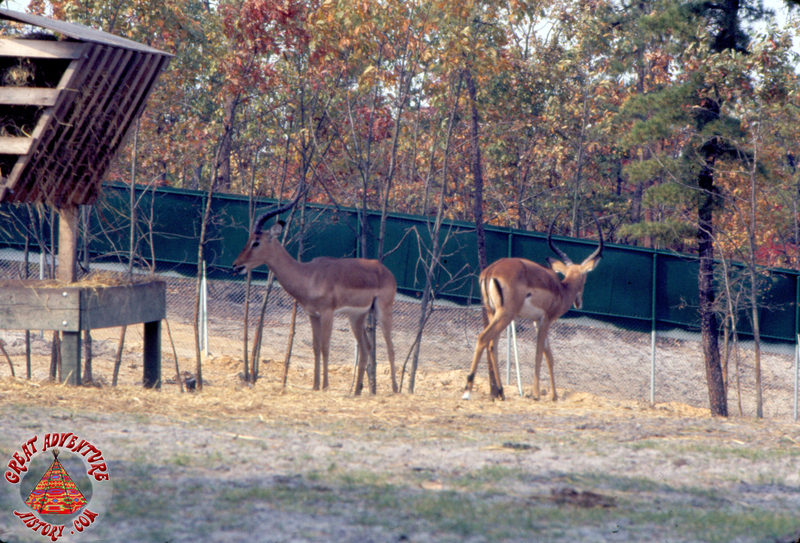 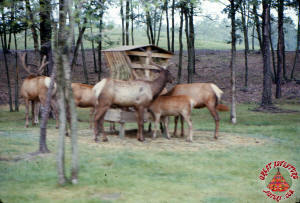 Larger feeders were strategically positioned throughout the Safari to provide the animals with shaded serving areas while offering great views of the feeding animals to guests passing by in their cars. 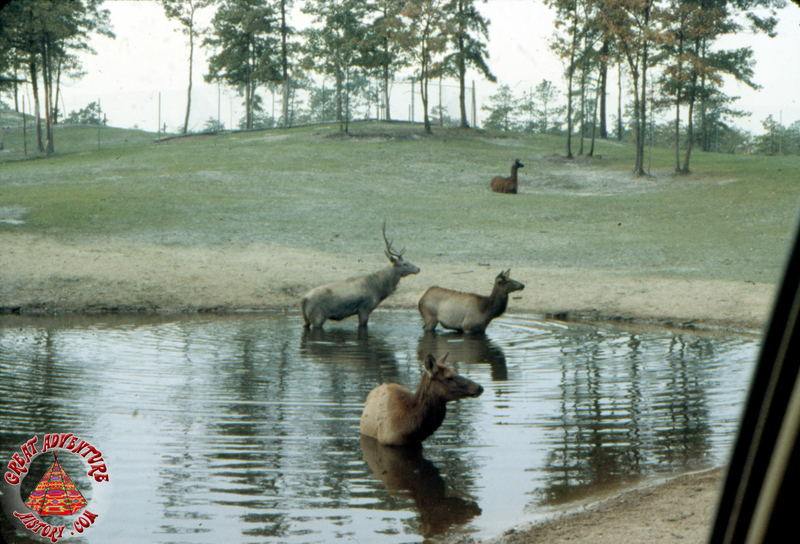 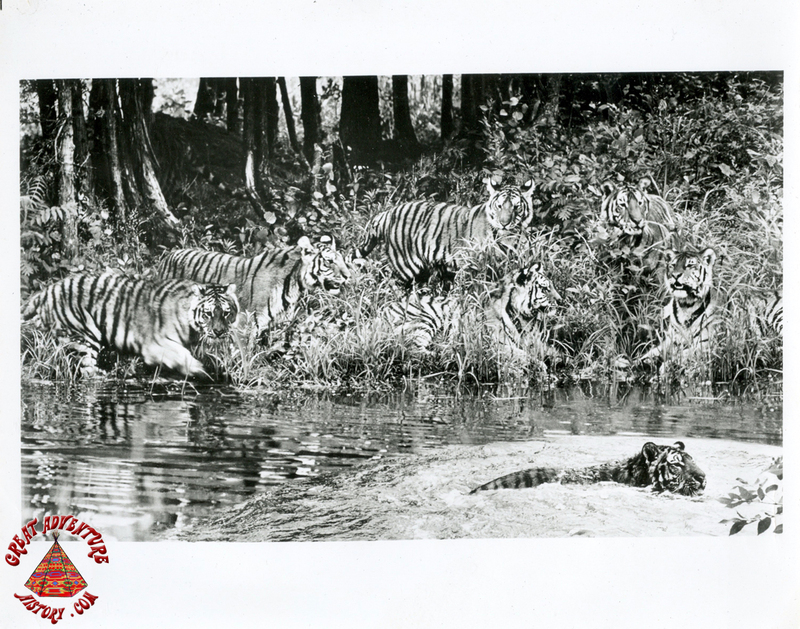 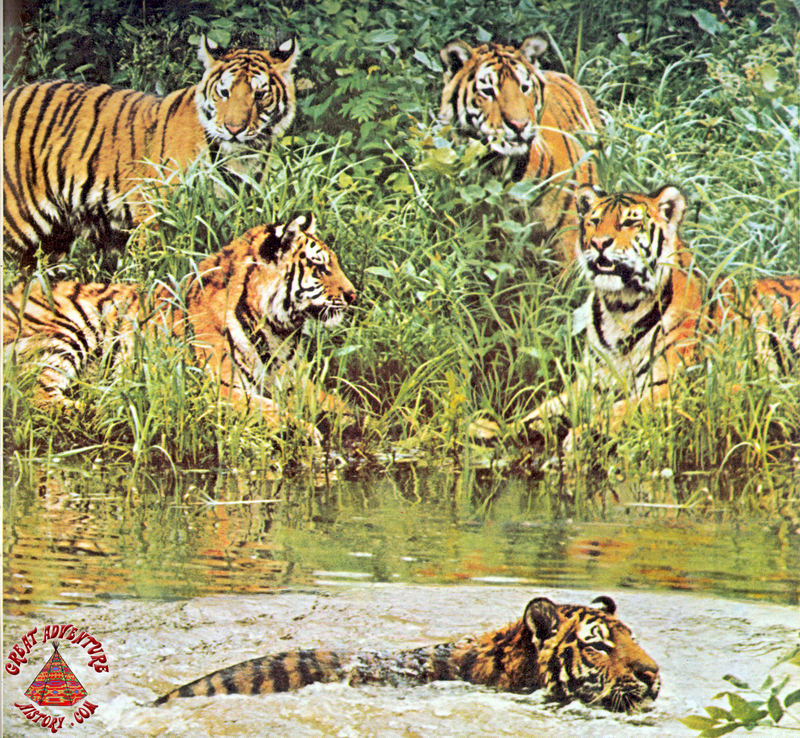 To enhance the natural beauty of the Safari, the designers made use of existing streams and ponds while also creating several additional watering holes for the comfort of the animals. 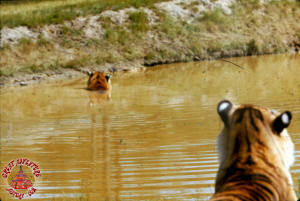 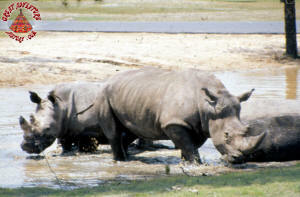 Over a dozen of these refreshing pools dotted the Safari's landscape. 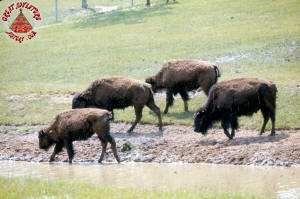 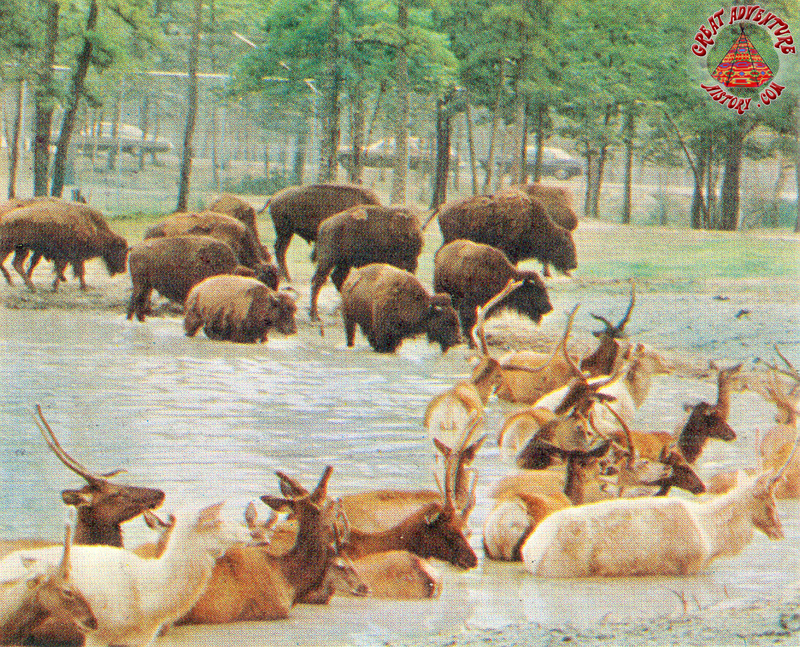 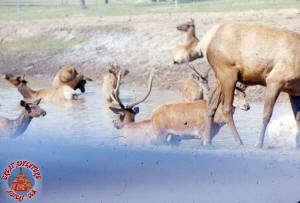 On the hottest days the water holes were often packed with the herds of deer, elk and bison as they looked to escape the heat. 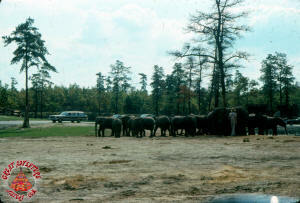 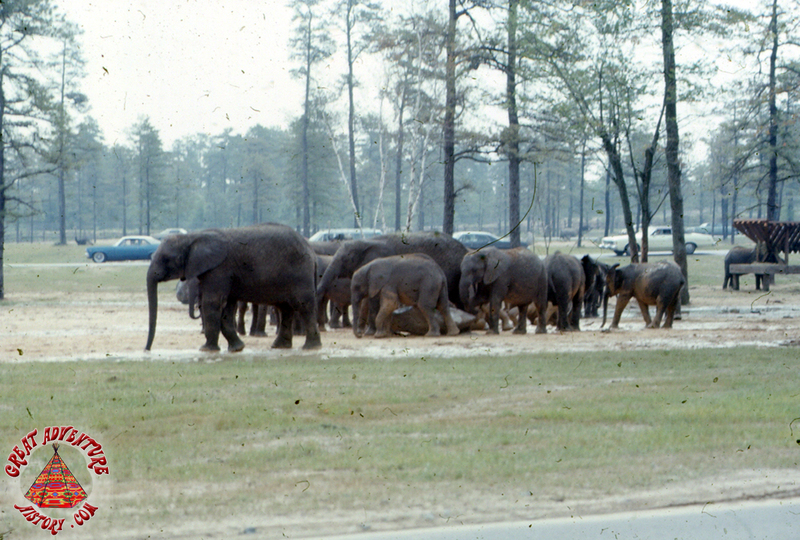 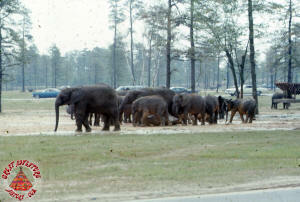 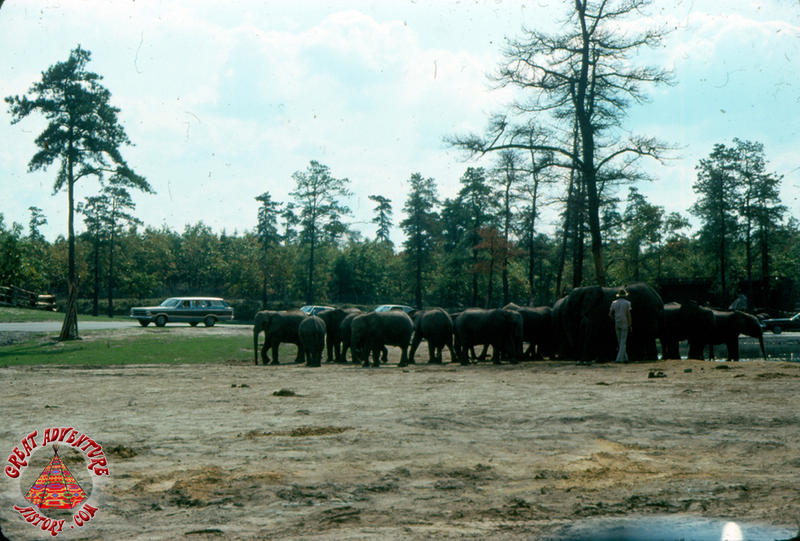 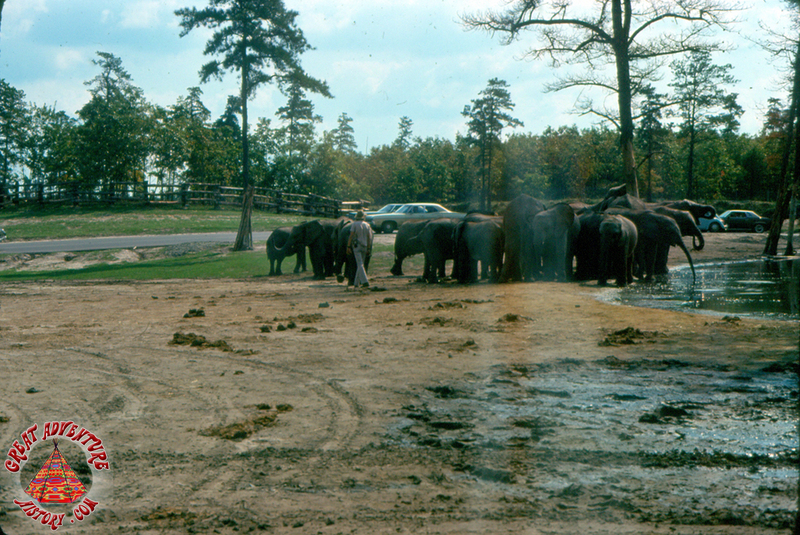 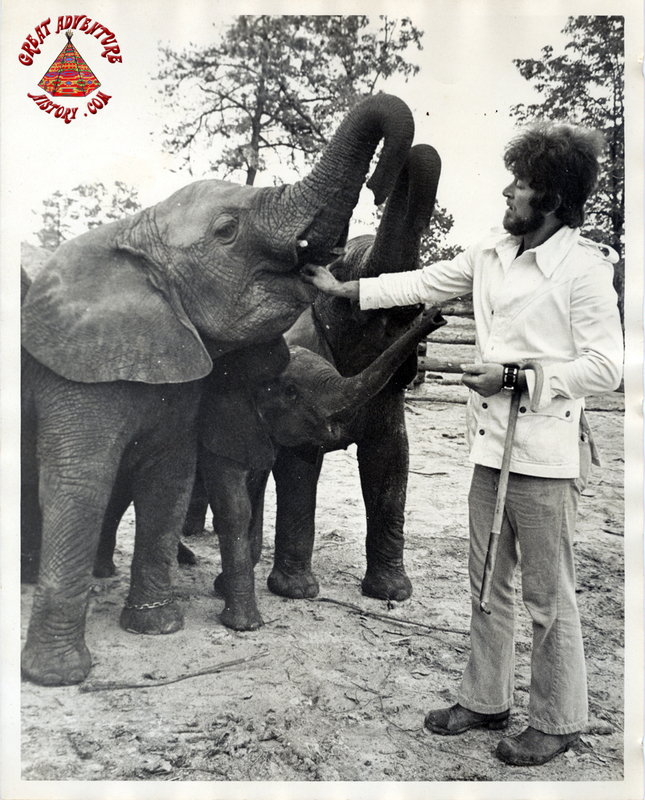 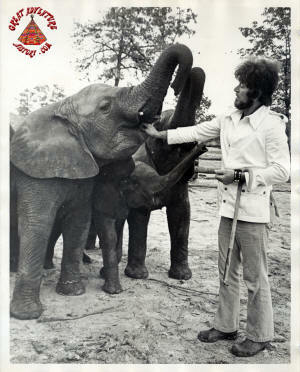 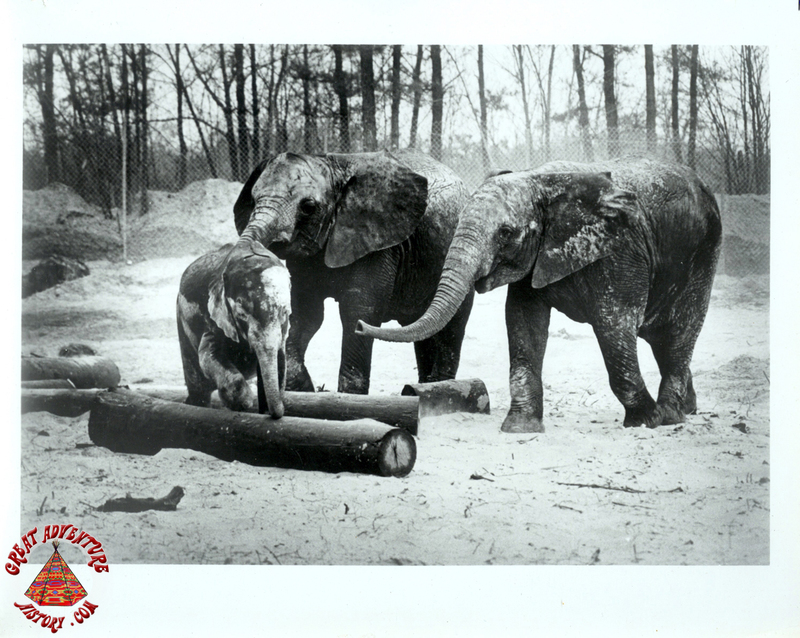 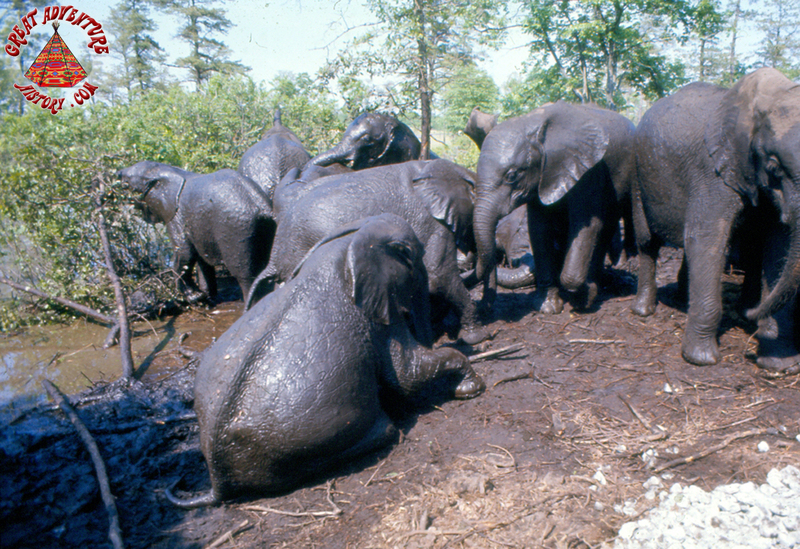 Often the waterlogged animals would exit the ponds and make their way onto the roadway where they would shake off the excess water and give the autos an unexpected car wash.
One of the most popular animal areas was the elephants. 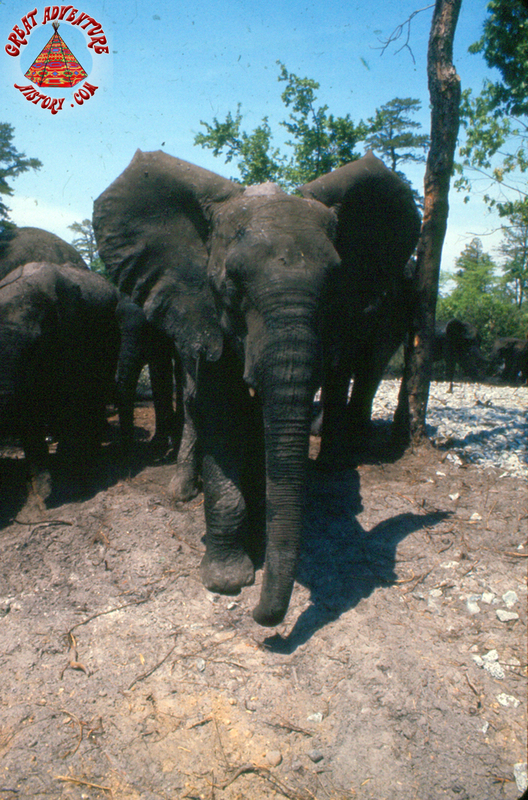 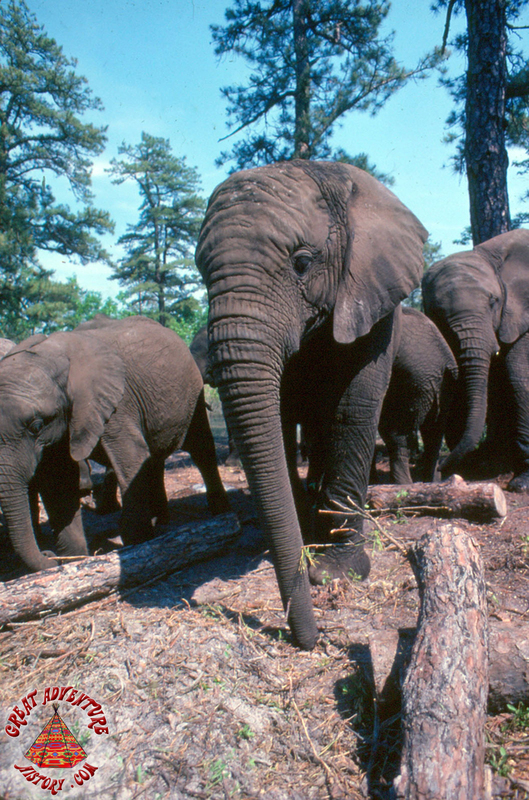 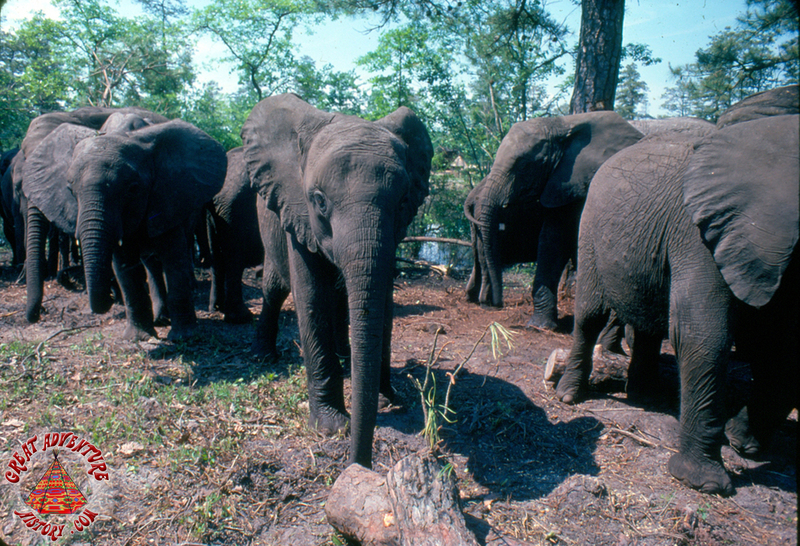 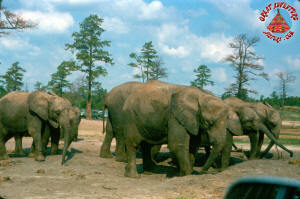 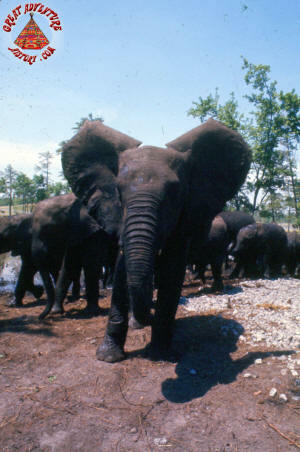 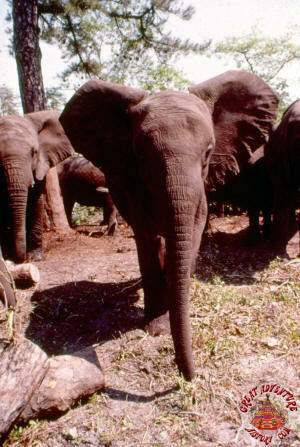 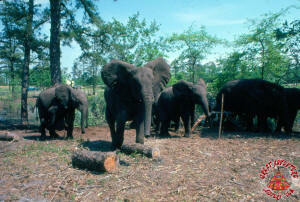 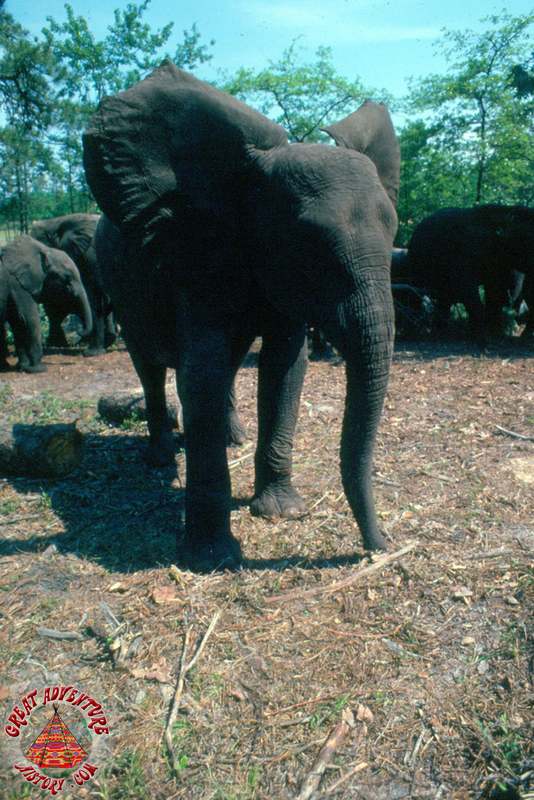 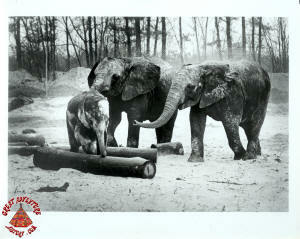 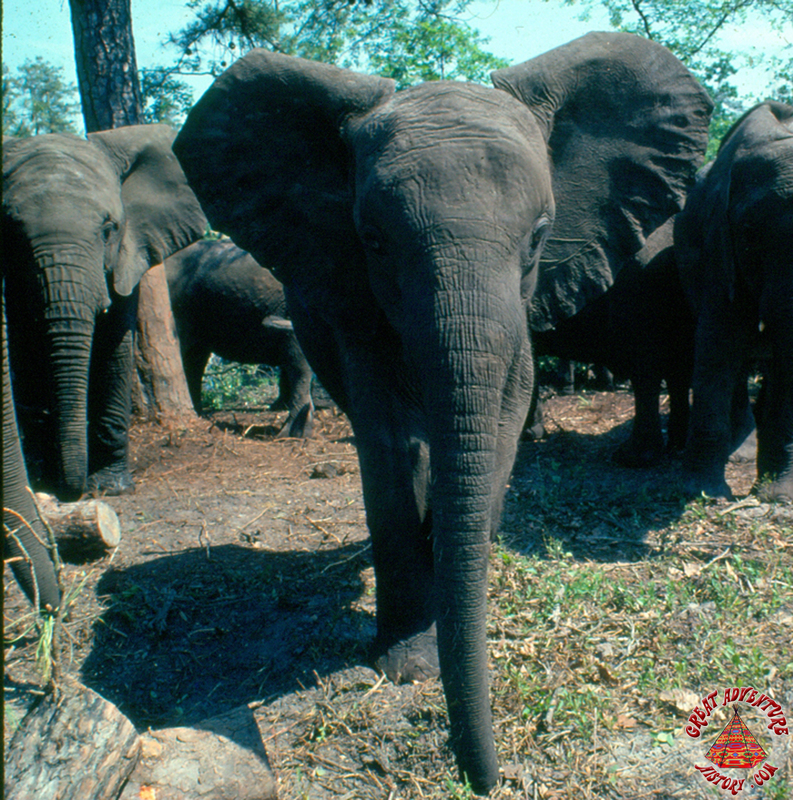 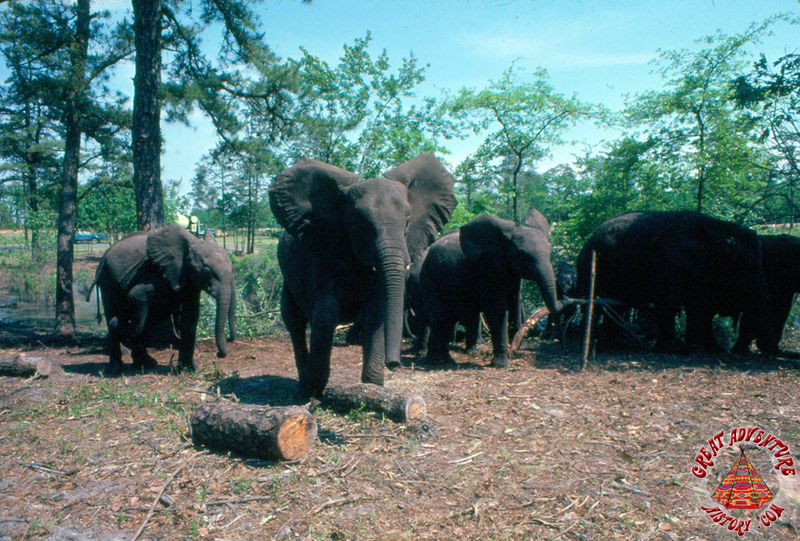 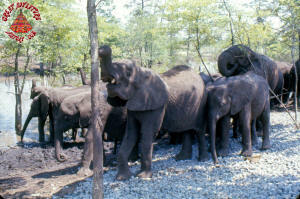 The twenty nine African elephants primarily had been brought as a herd from Uganda. 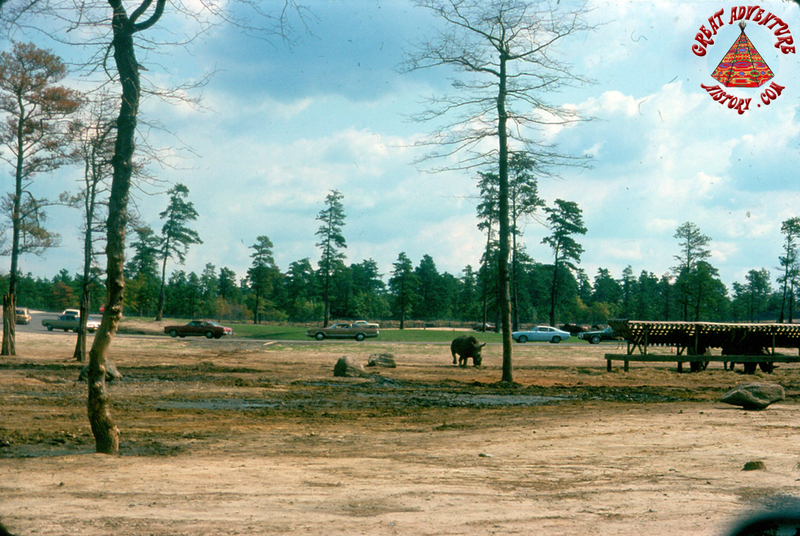 Like the plains, the elephant area originally featured many trees, but those quickly fell victim to the giant animals which would snap many of the tree trunks like toothpicks. 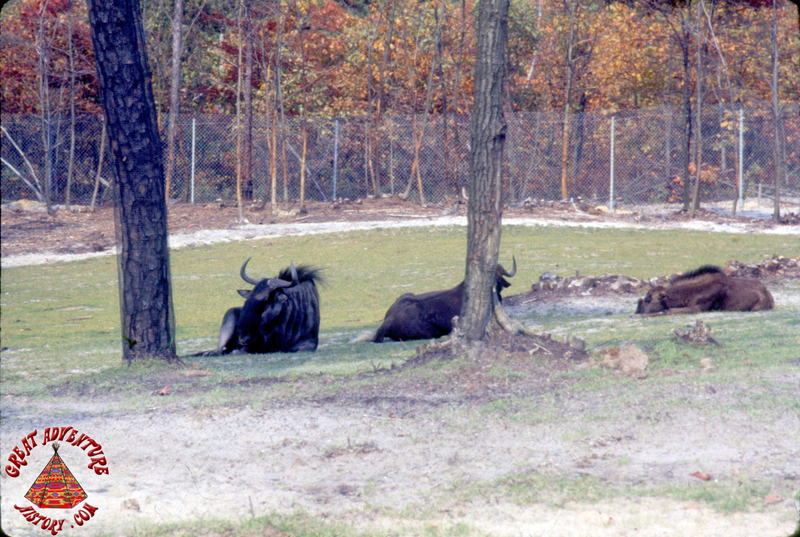 Even though the elephants shared this area of the Safari with the rhinos and the ostriches, all these animals usually managed to keep to themselves in their respective herds. 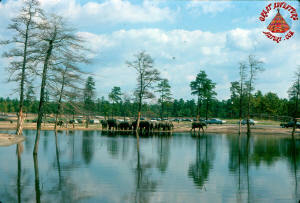 The herd of elephants quickly adapted to their new home, enjoying the lake and the hills of their section. 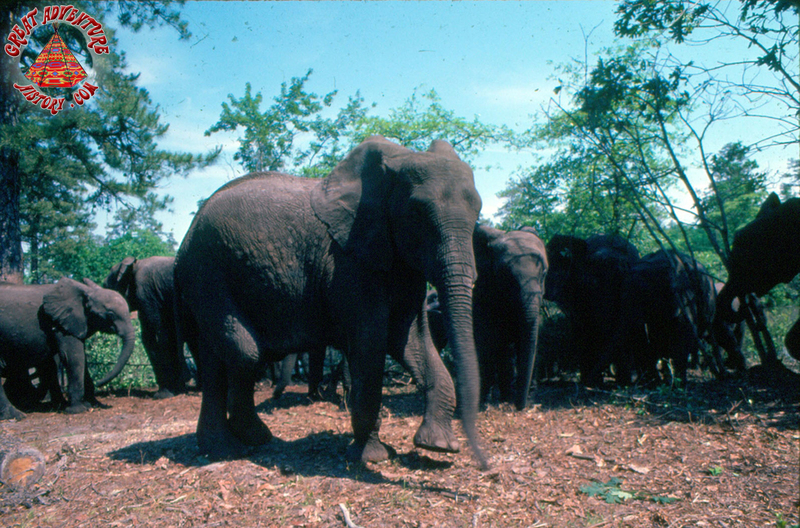 The elephants initially had free range of their territory. 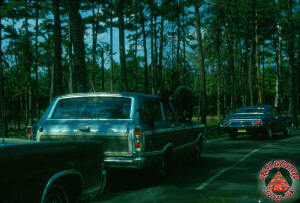 The wardens were responsible for keeping them out of the roadway and away from the cars. A huge feeding station and pond was positioned in the middle of the area's central savannah to encourage the elephants to stay away from guests. 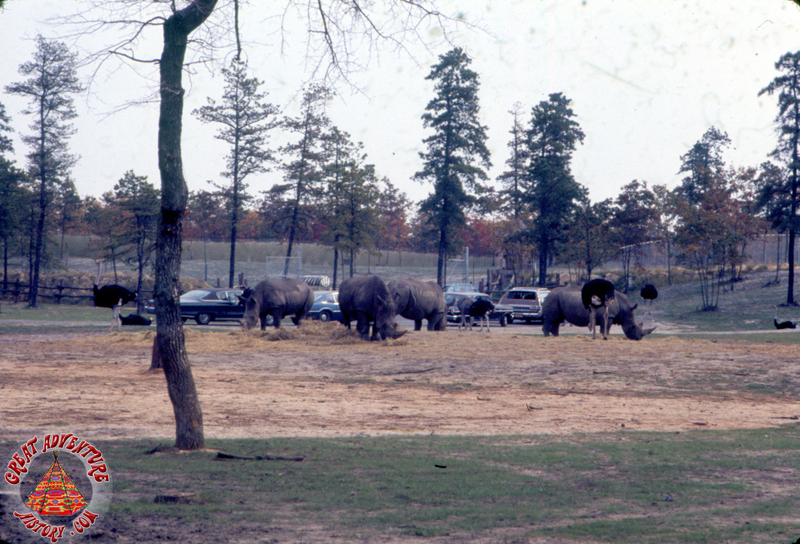 For the safety of the guests, wardens, and the elephants themselves, they would eventually be corralled into a huge pen in the center of the Elephant and Rhino section. 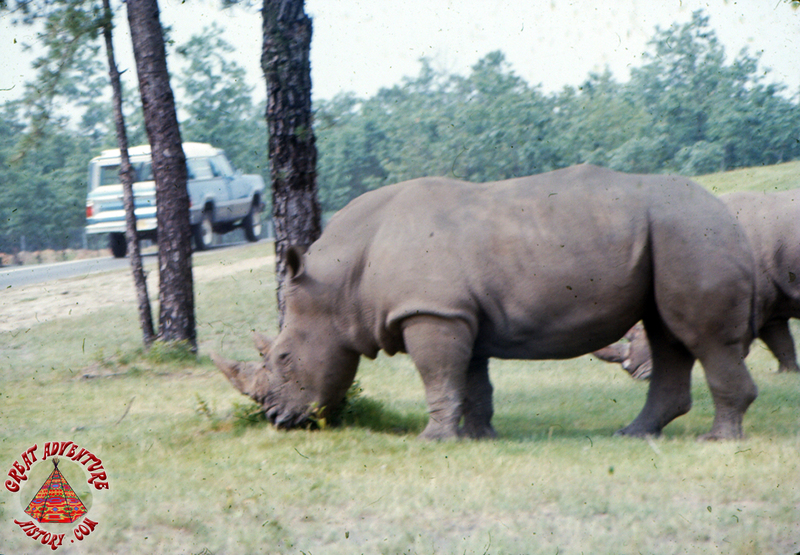 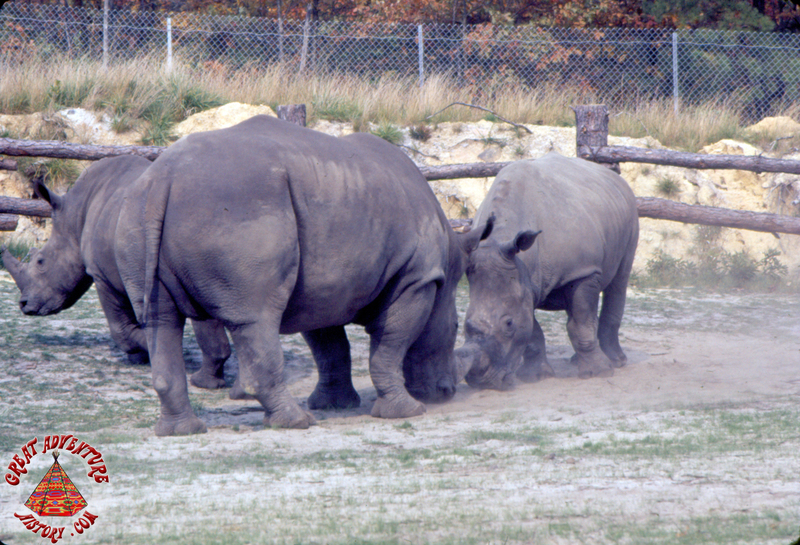 The white rhinos shared the African area of the Safari with the elephants, and together they pretty much killed the grass and trees between their grazing and just walking on the grass. 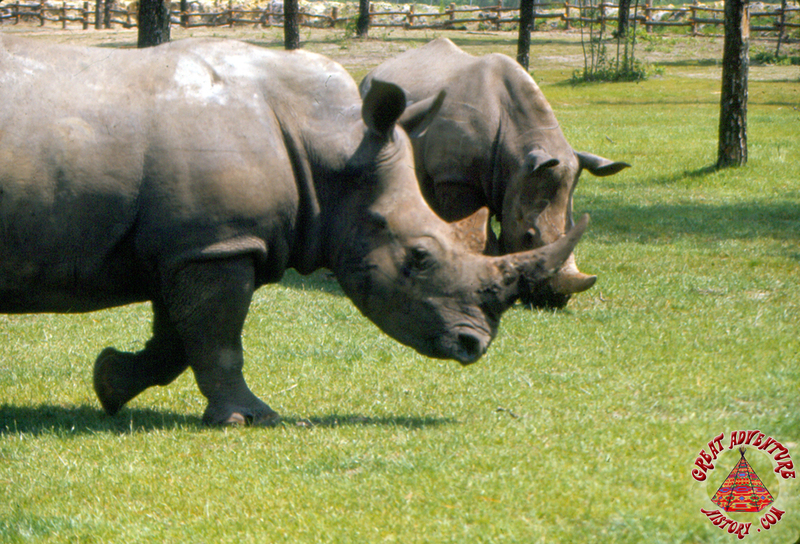 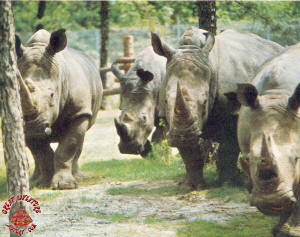 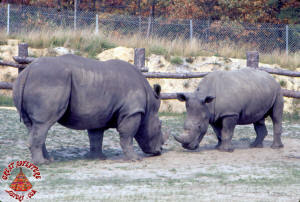 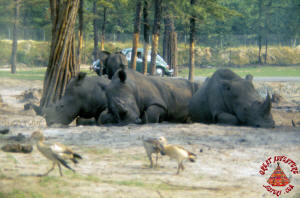 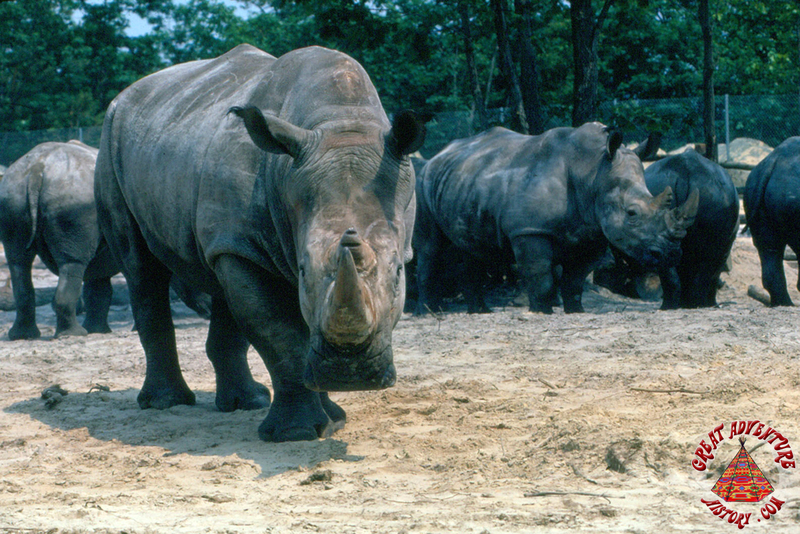 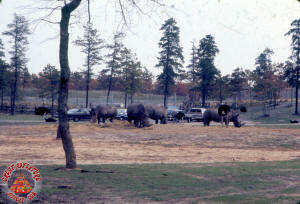 The rhinos were found in and closer to the roadway more often than the elephants. 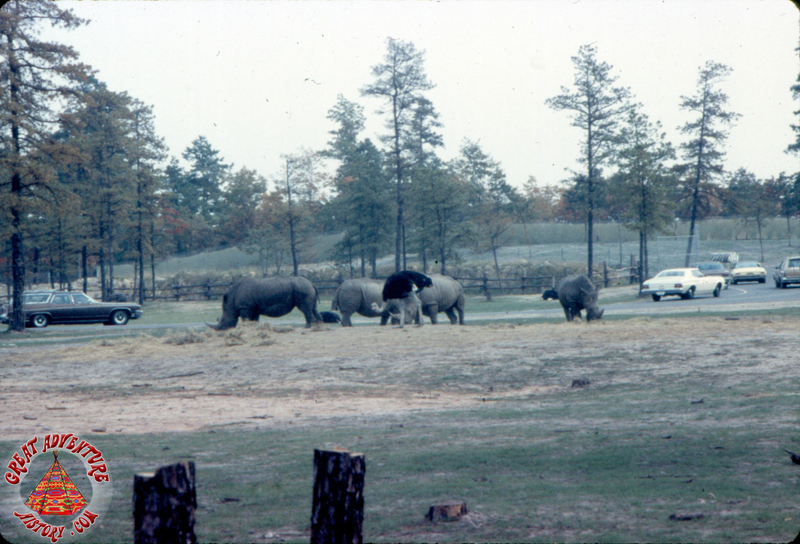 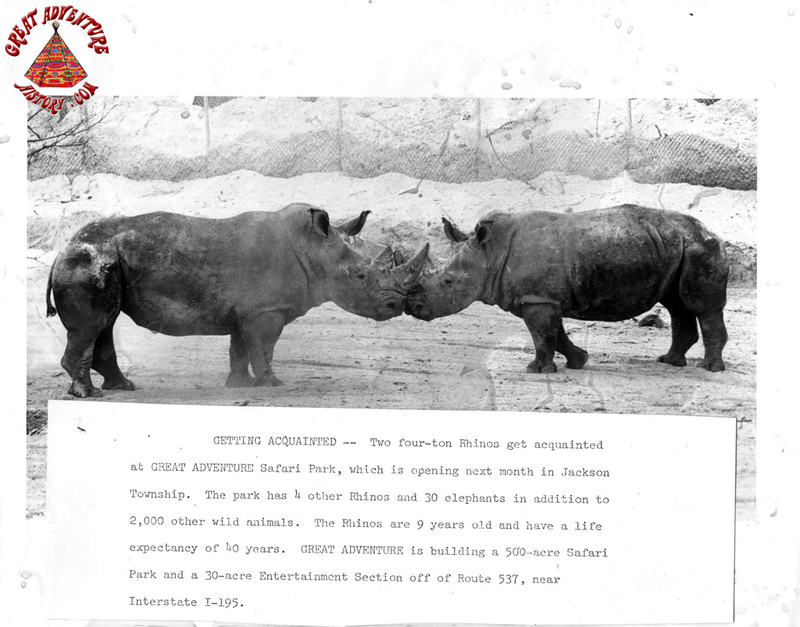 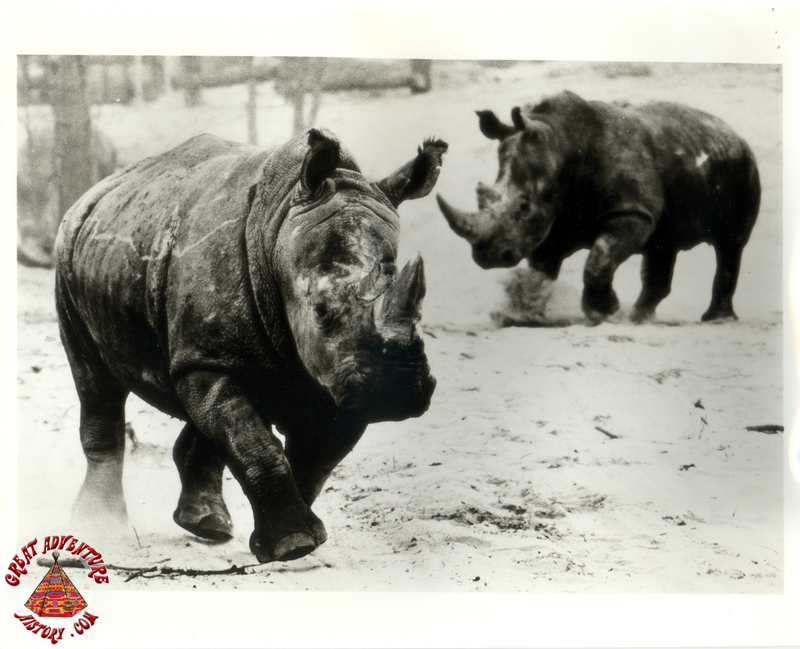 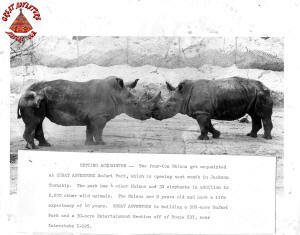 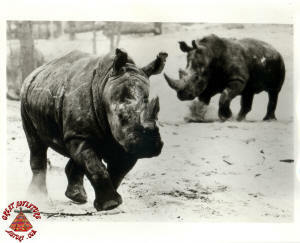 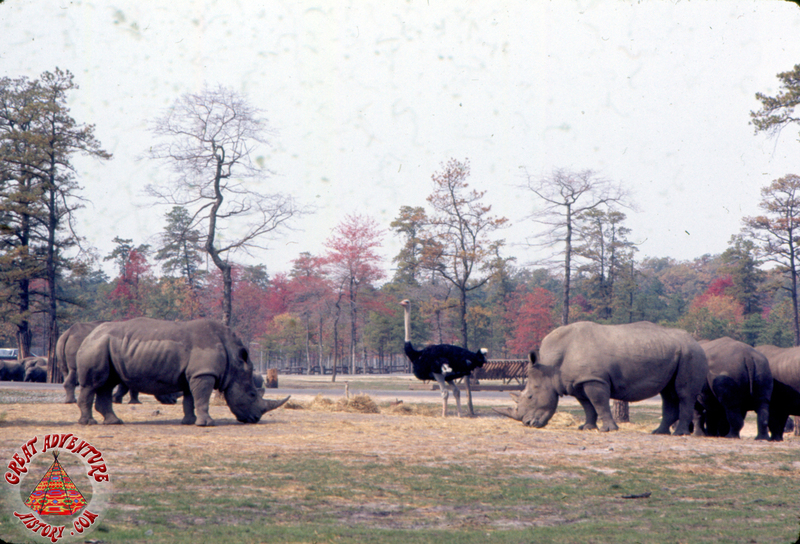 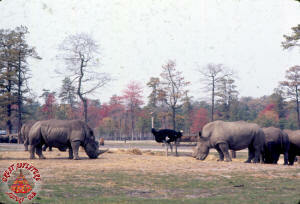 It was frequently possible to see a rhino playing chicken with one of the many white and black striped Safari trucks when they felt challenged or simply playful. 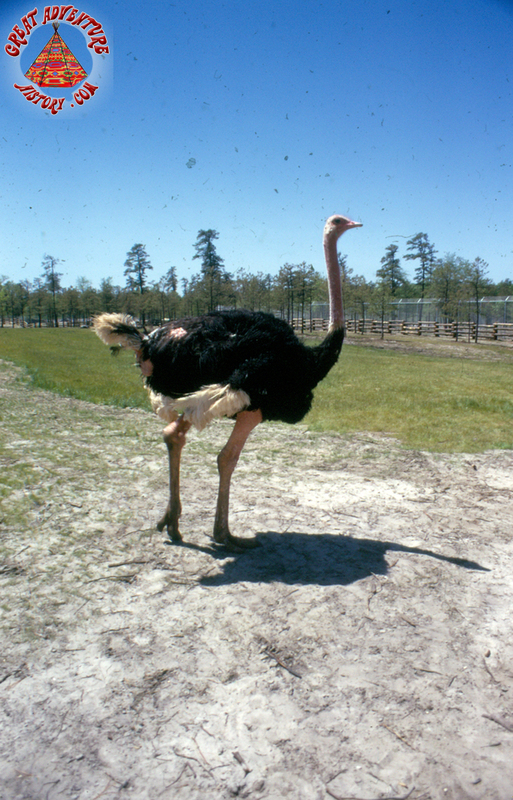 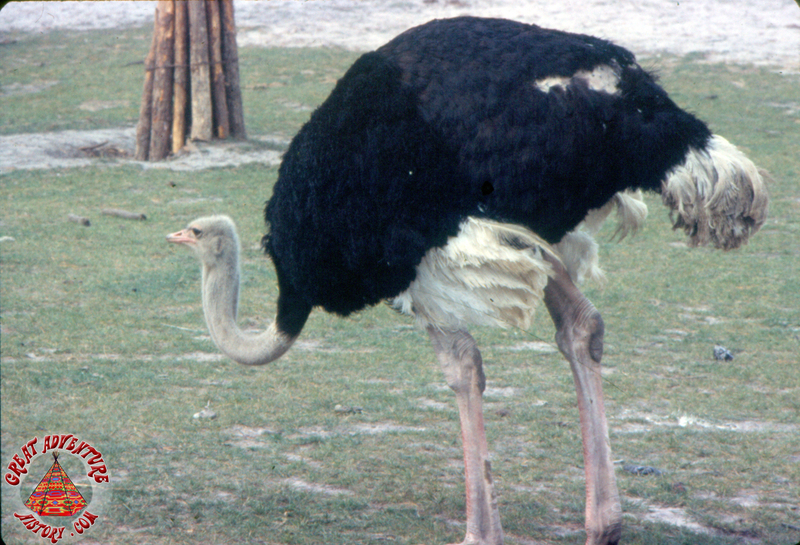 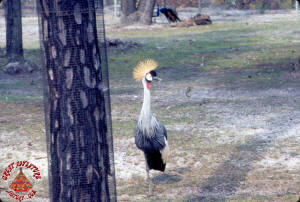 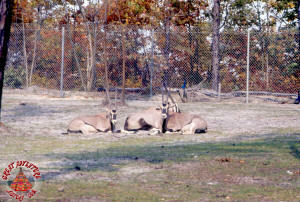 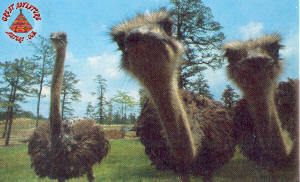 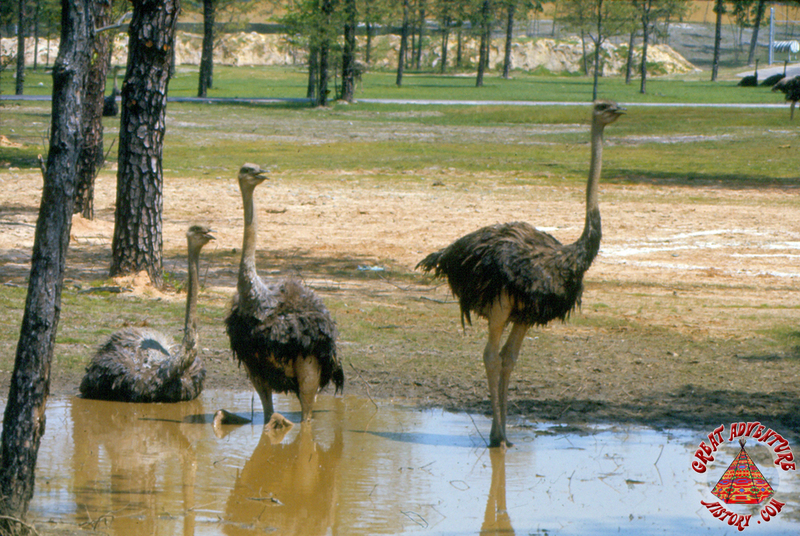 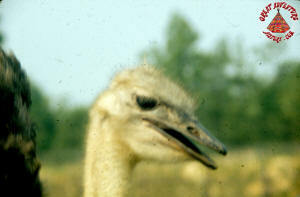 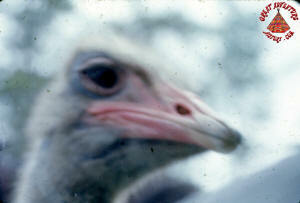 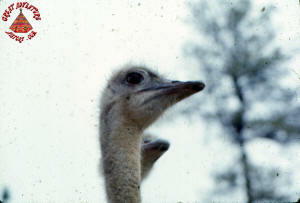 Ostriches also shared the African section with the elephants and rhinos. 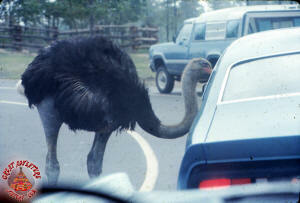 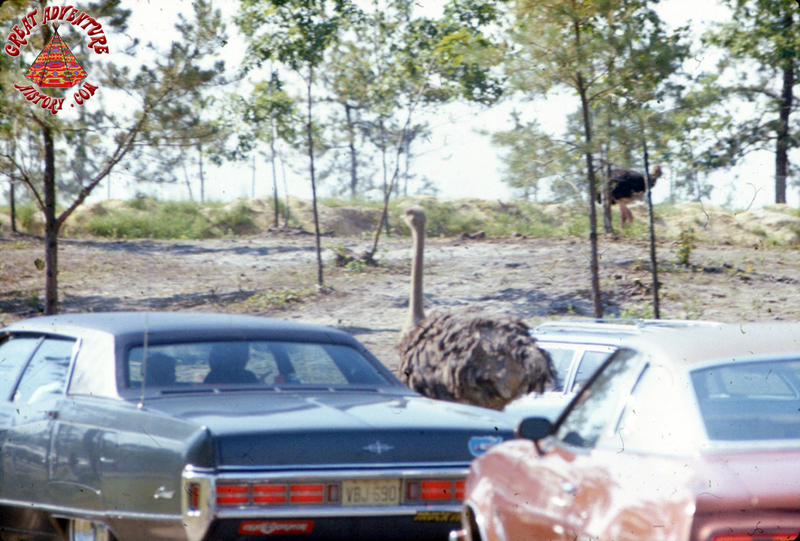 While the other, bigger animals tended to steer clear of the passing cars, the ostriches showed no fear and would often walk right up to the vehicles. 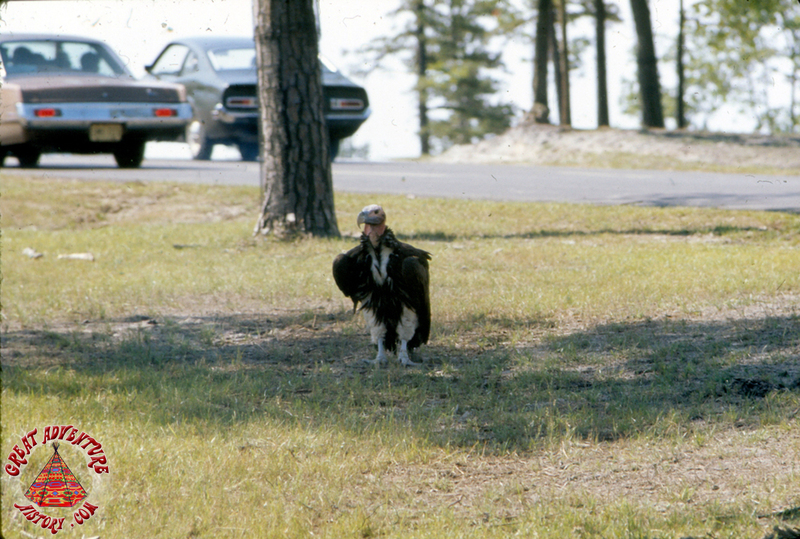 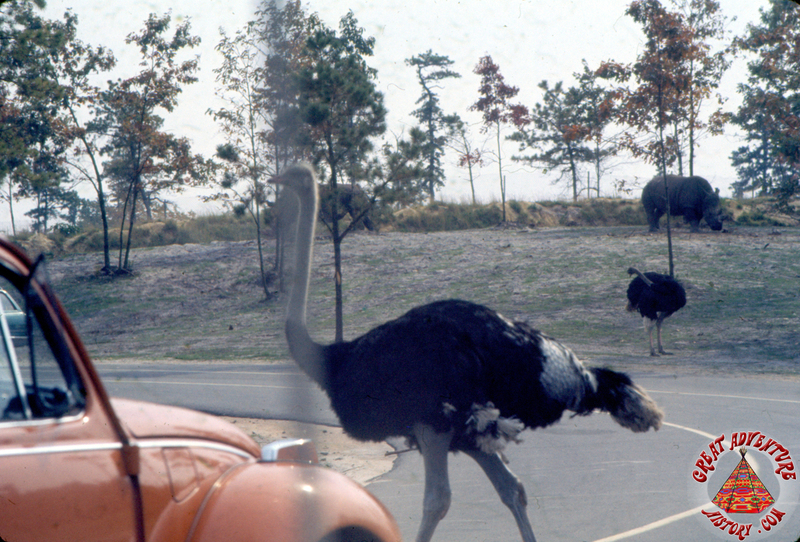 The giant birds often would walk up to car windows and look for handouts from the passing cars which would tie up traffic as they blocked one or more of the three lanes. 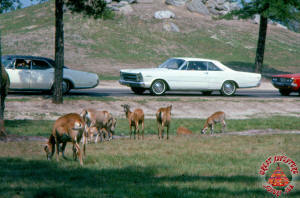 Hubcaps were a standard feature of most model cars in the 1970's. 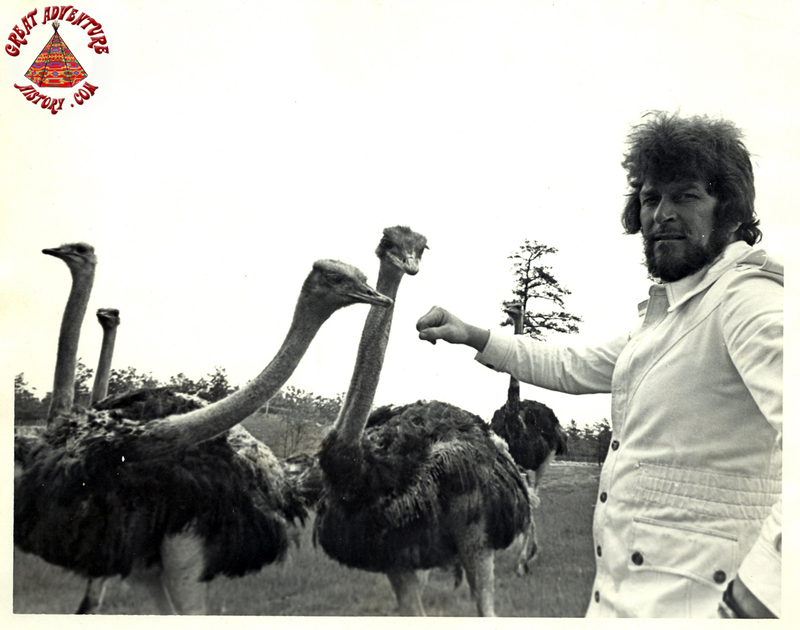 These reflective metal discs were like rolling mirrors for the ostriches and it was common to watch an ostrich admiring itself in a neighboring car's tire. 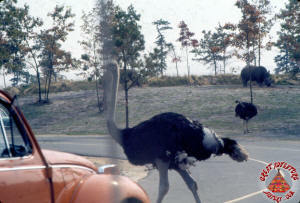 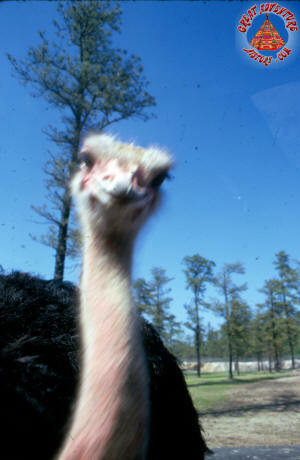 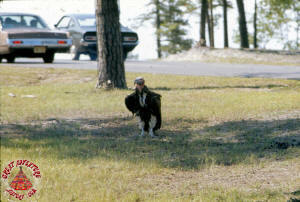 Amazed at what it was seeing the ostrich would sometimes attack and peck at the hubcap thinking it was another ostrich. 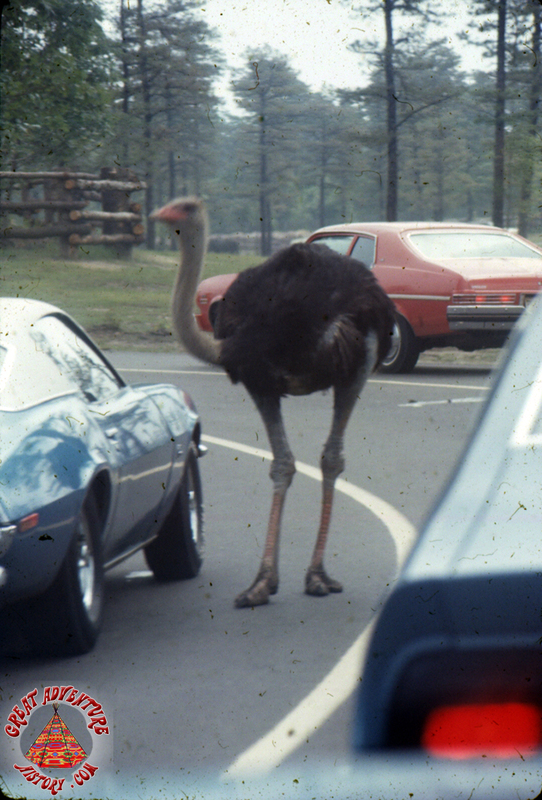 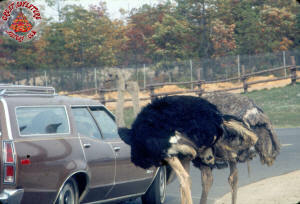 Other times, the ostrich would just stare and actually tilt its neck as the tires would start to roll as the cars began to creep away. 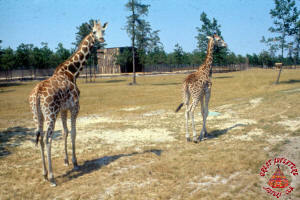 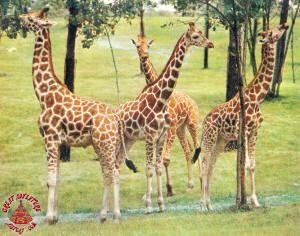 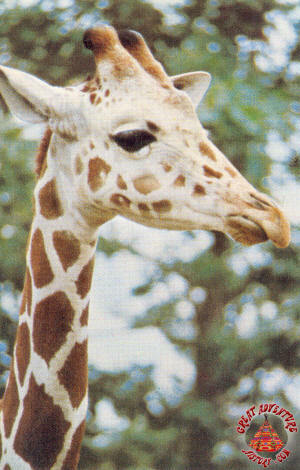 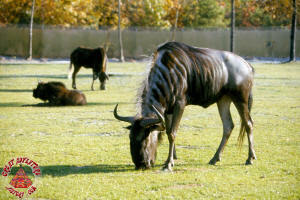 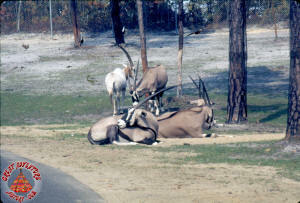 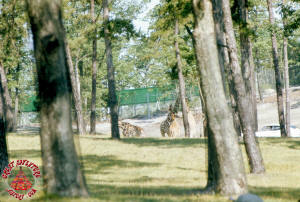 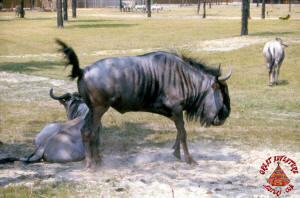 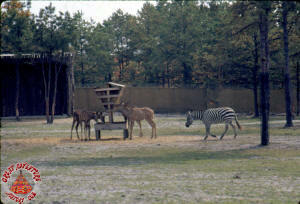 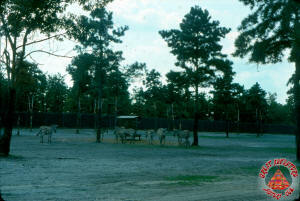 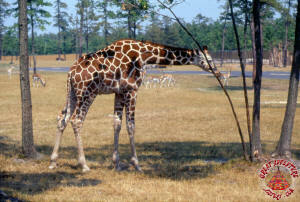 The African plains section held the giraffes, zebras, wildebeests and other animals of the grasslands. 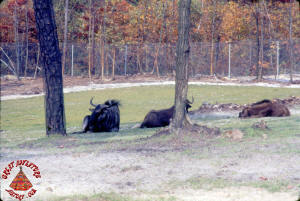 Like the other areas, great care was taken to preserve the trees and grow grass, but the large herds stripped the trees of leaves and ripped up large areas of the newly planted grass. 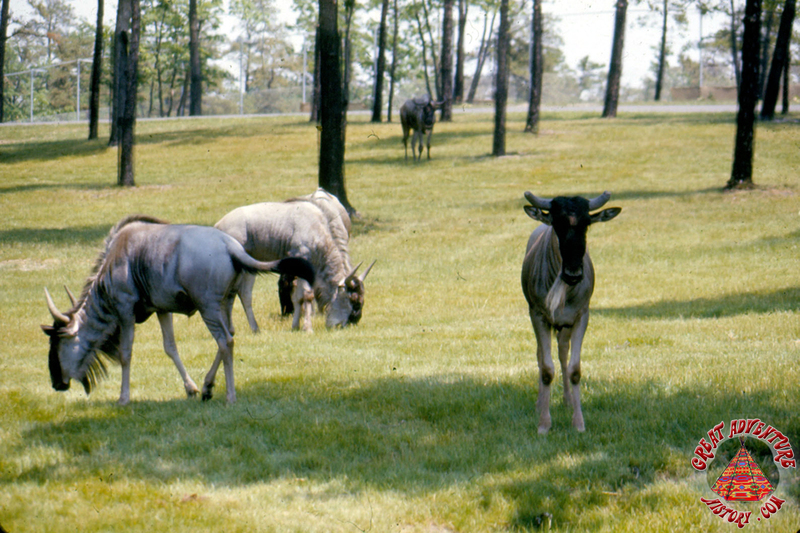 The grazing animals in this area munched on so much of the grass that it often required the herds to be restricted to certain regions so that the grass growth could recover. In the years ahead, this section of the Safari would remain completely closed with the animals relocated to other areas so that the ground cover could truly reestablish itself. 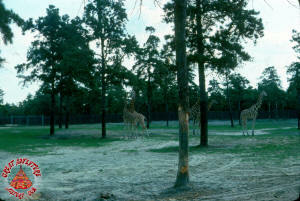 The giraffes were also particularly destructive to the trees. 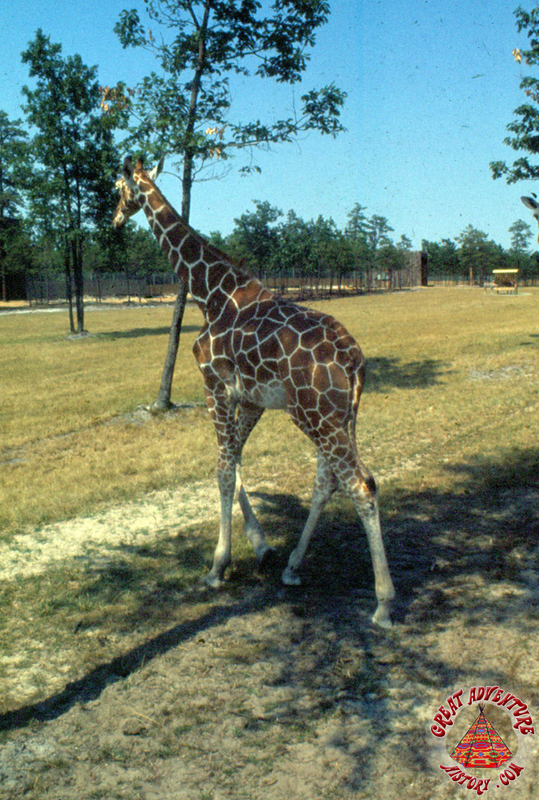 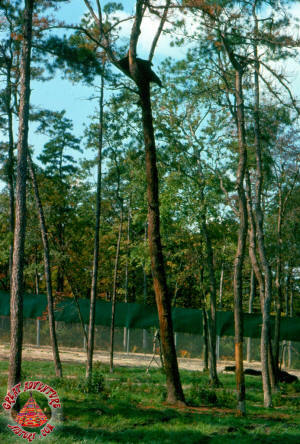 Growing to height of nearly 20 feet, few leafs were safe from a giraffe's lofty reach. 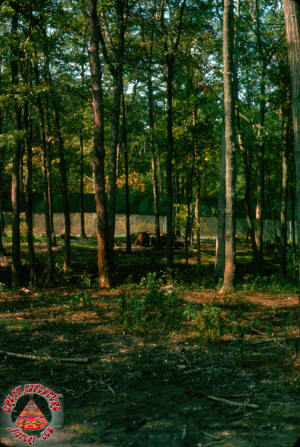 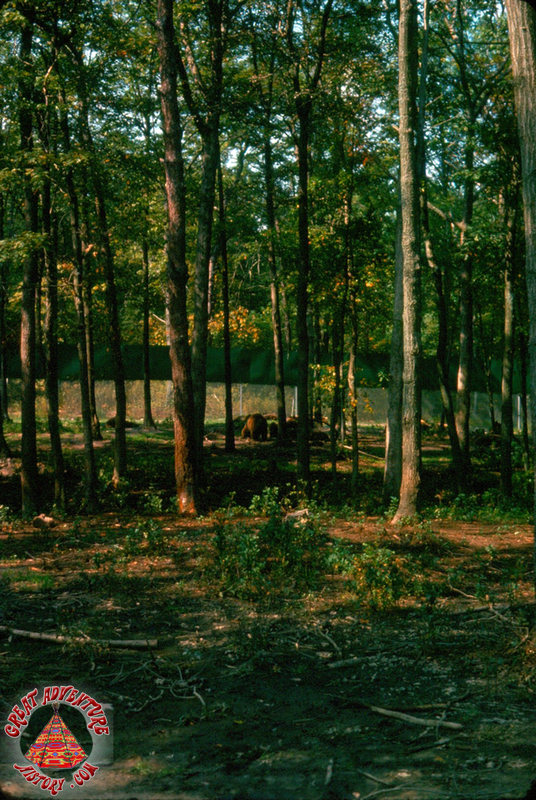 In later years the trees would have fences, wire mesh, and other protections to keep the giant animals from nibbling on their bark and killing them. 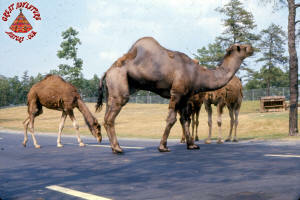 Along with all the African herd animals, the African plains also had dromedary camels. In later years the camels would be moved to other areas as the size of the other herds grew larger and larger. 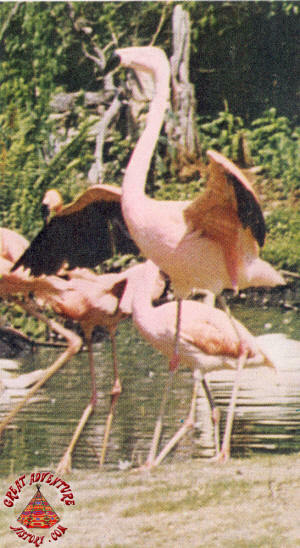 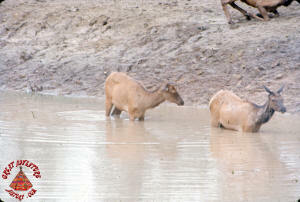 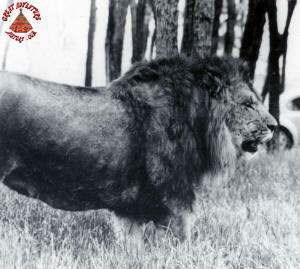 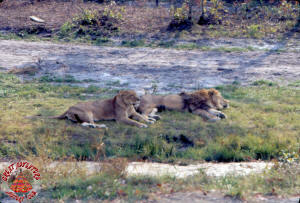 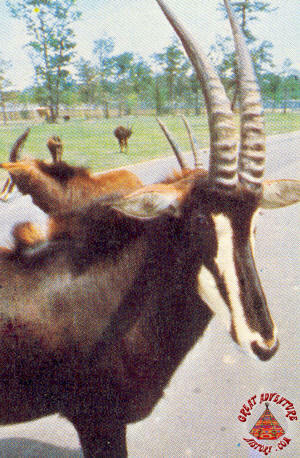 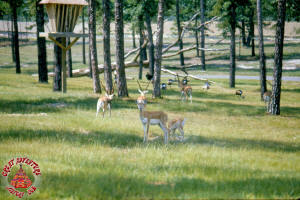 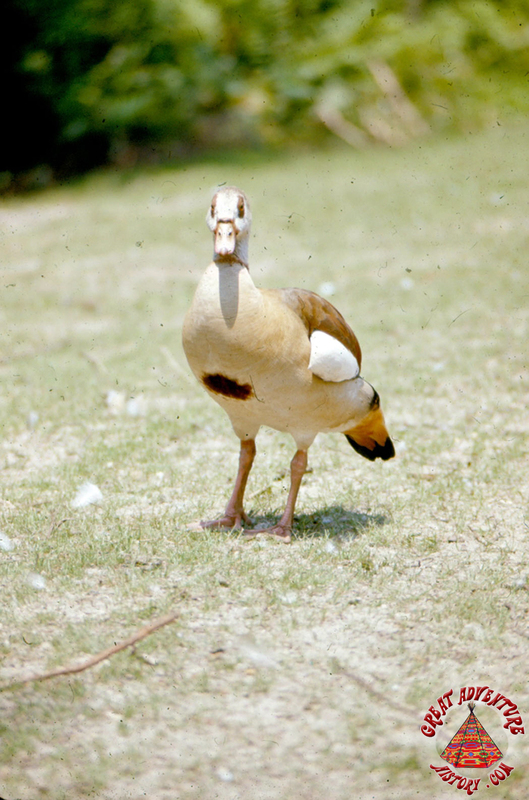 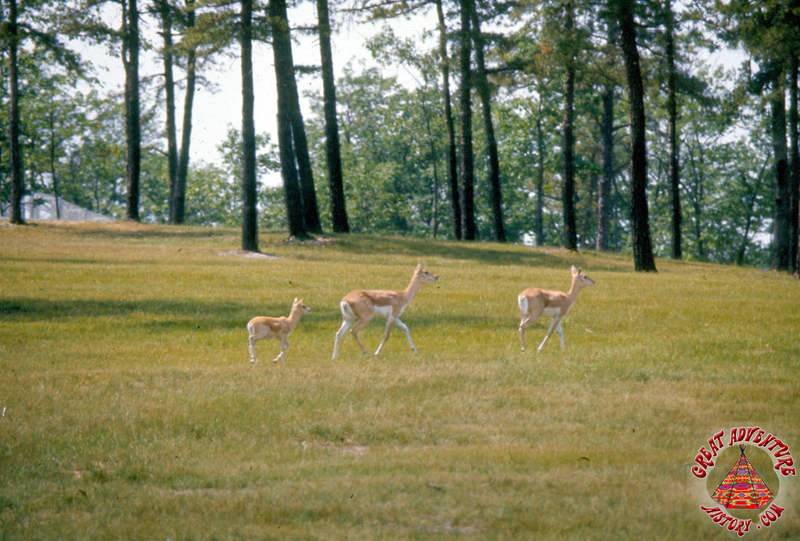 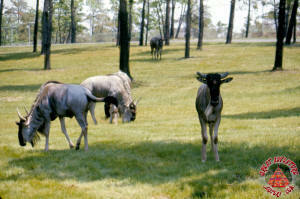 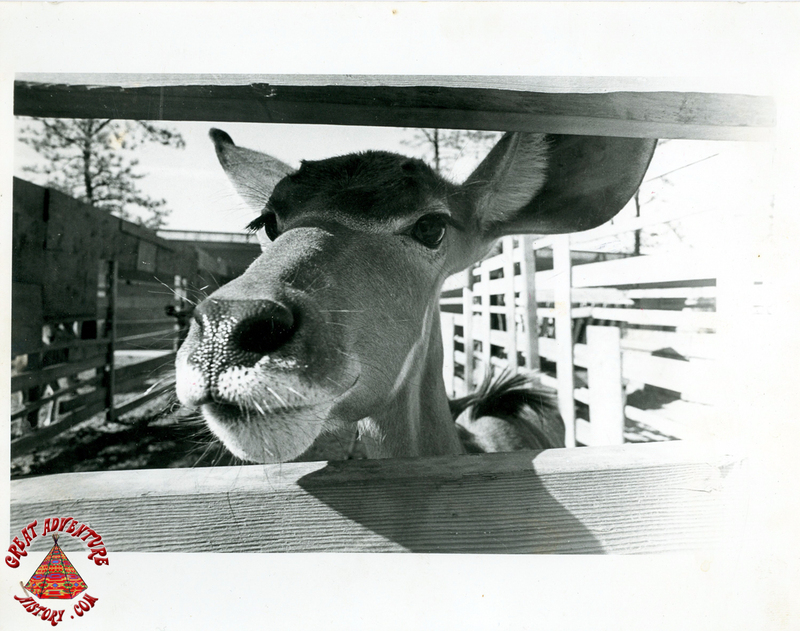 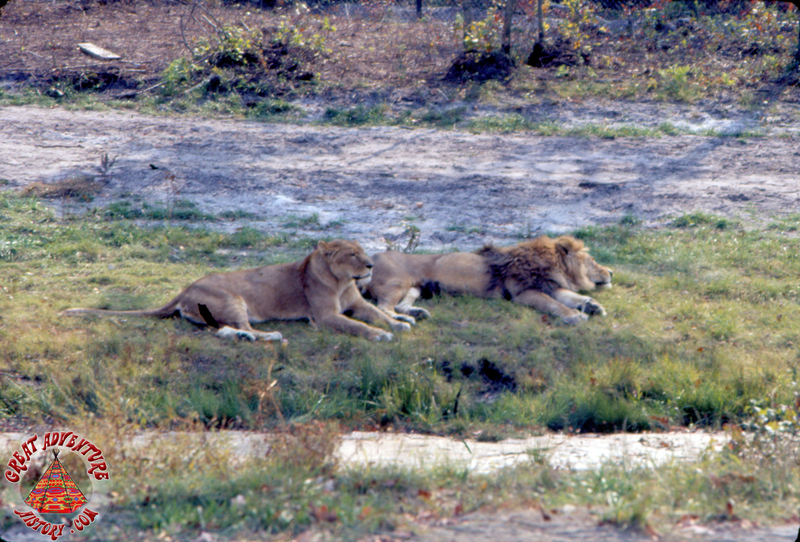 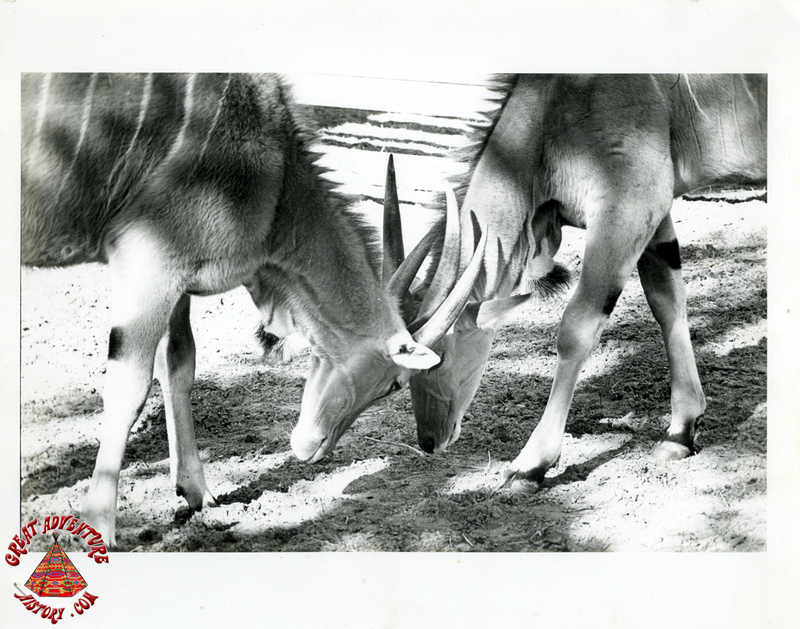 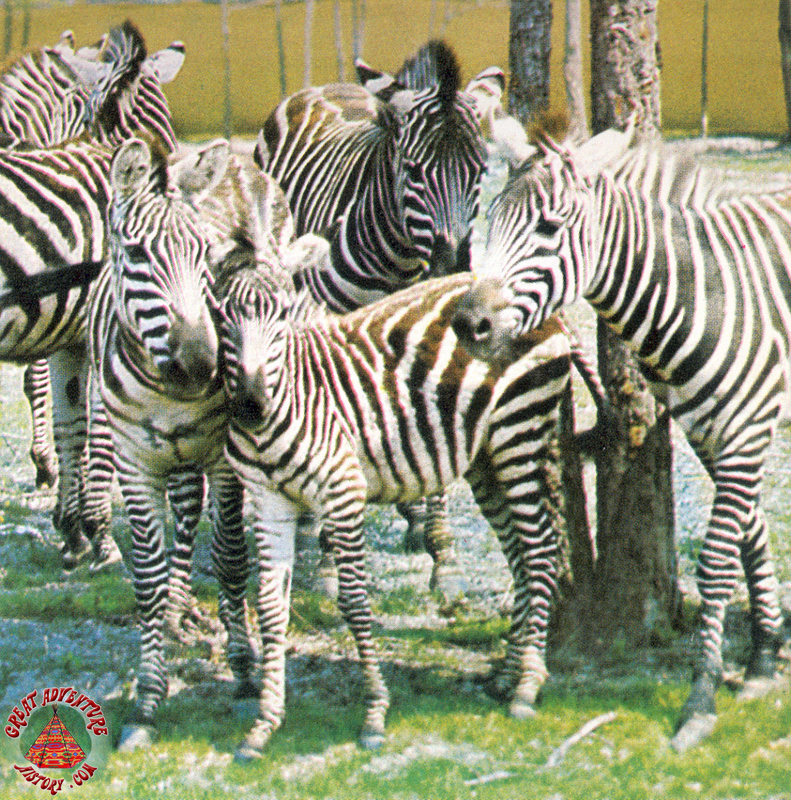 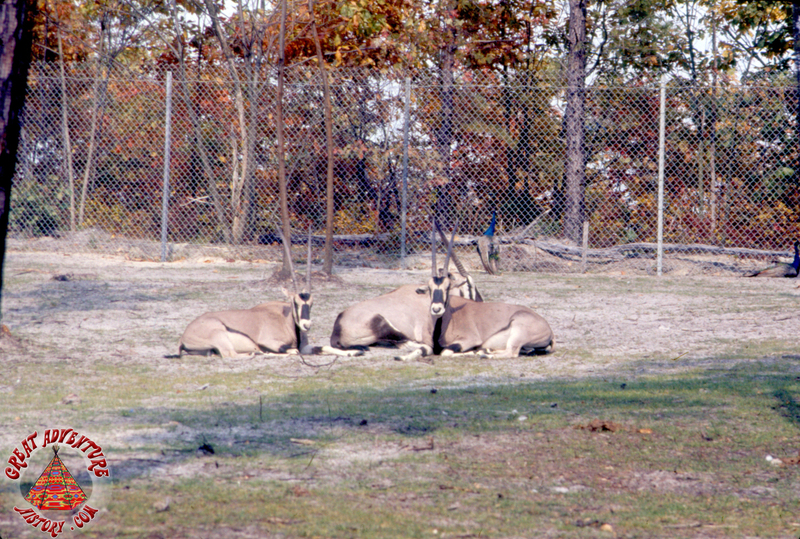 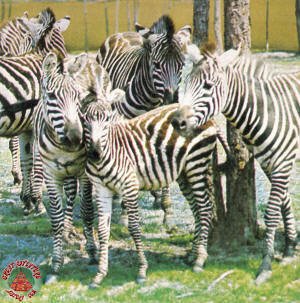 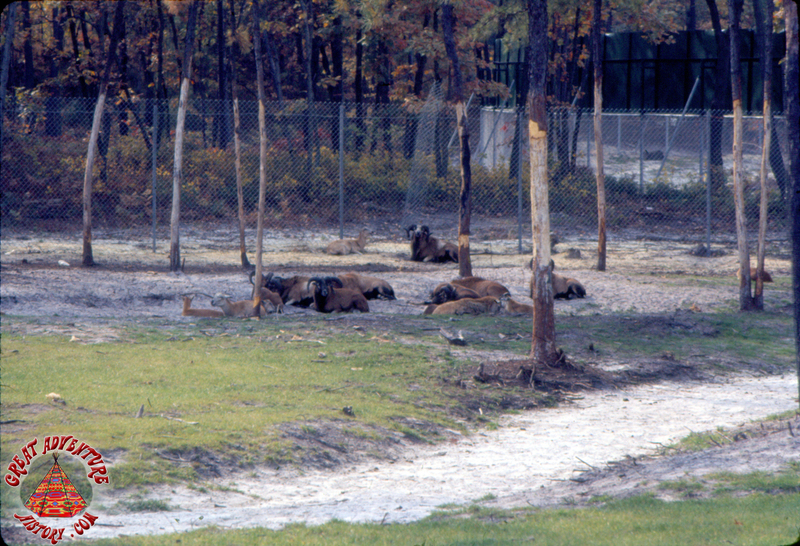 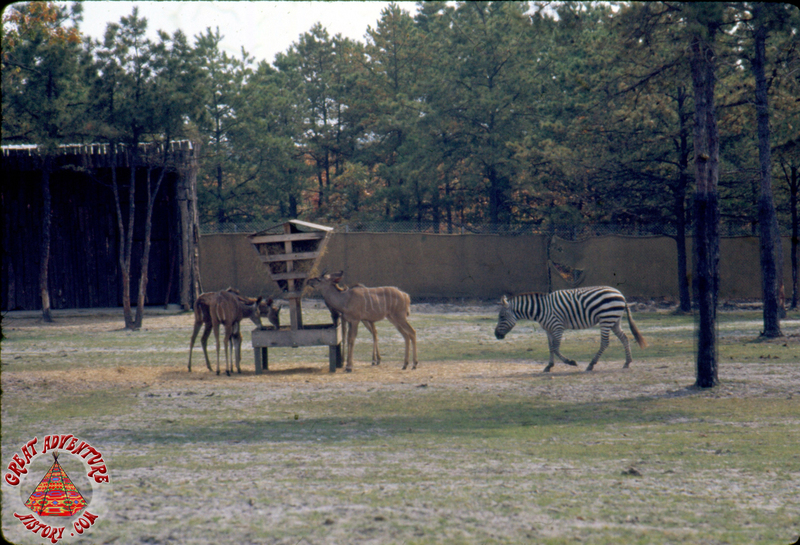 One of the missions of the Safari was to provide a place for "animals to survive and thrive" while providing an "environment of a safari park, where they can roam and have the proper food in abundance". 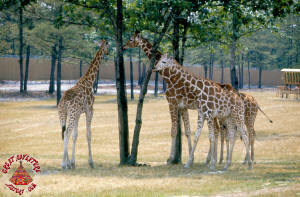 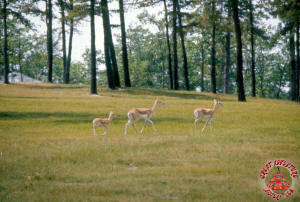 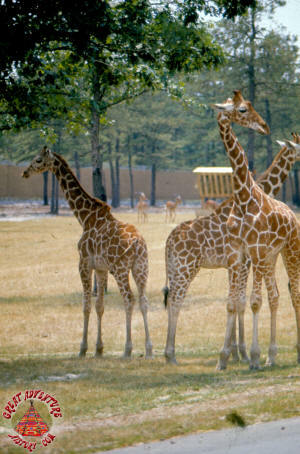 The park surely met its goals as so many newborns were born and the Safari's population quickly skyrocketed. 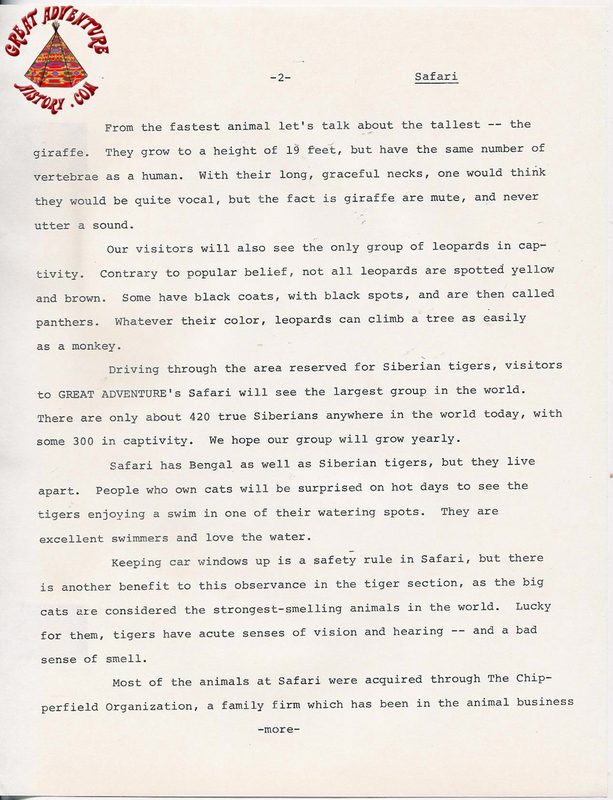 The variety and numbers of animals in the African Plains was breathtaking and really gave the guests passing through the Safari a true sense of what the great herds of the African plains looked like. 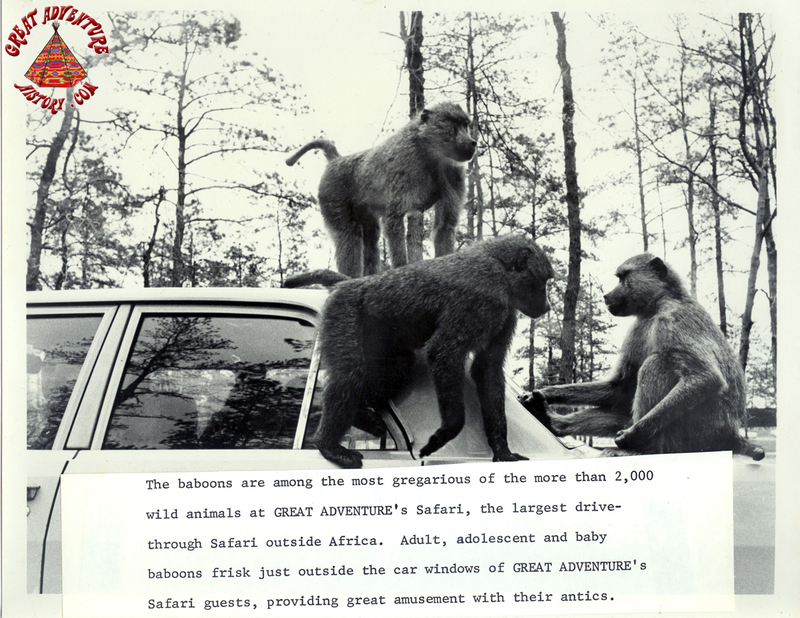 While the Safari was a feast for the eyes, it also provided an educational experience through sound provided by a specially recorded narration delivered to the guests on a designated AM radio station. 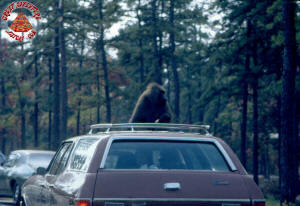 The signal was broadcasted via a wire embedded in the roadway under the center lane of traffic. 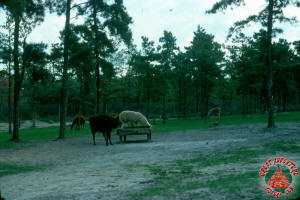 At the halfway point of the Safari the animals went from the grazers to the carnivores with the big cats and bears. 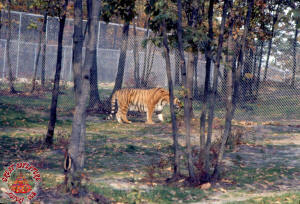 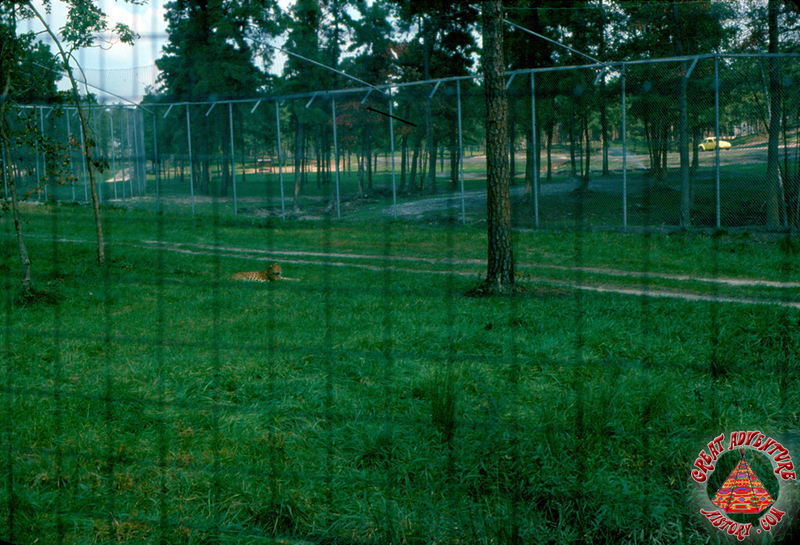 To enter this area cars passed through a set of gates that would allow them in as a group, keeping the dangerous animals inside. The double gates were overseen by a warden in a tower who could watch both ends of the gated area, keeping the grazers out of the carnivore area and the carnivores away from the grazers. 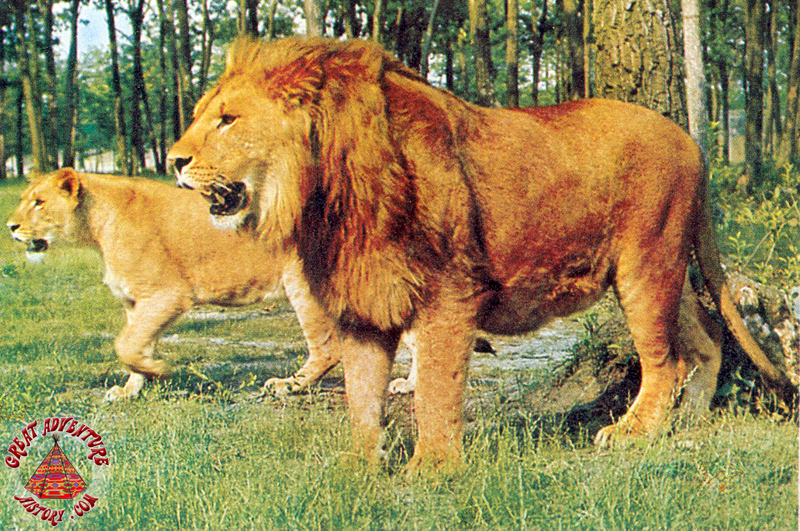 The lions were the first of the carnivorous animals encountered, roaming freely throughout their area. 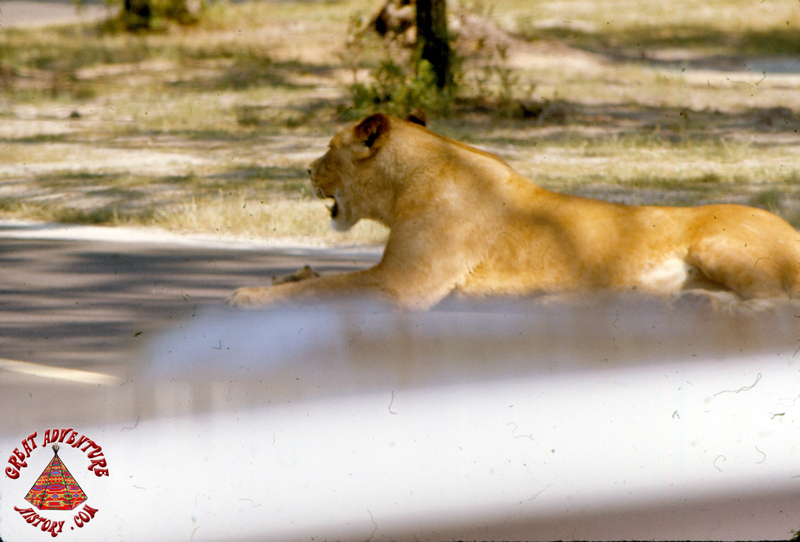 The large pride could be found on both sides of and occasionally on the road as motorists passed by with nothing but their car windows keeping them safe from the big cats. 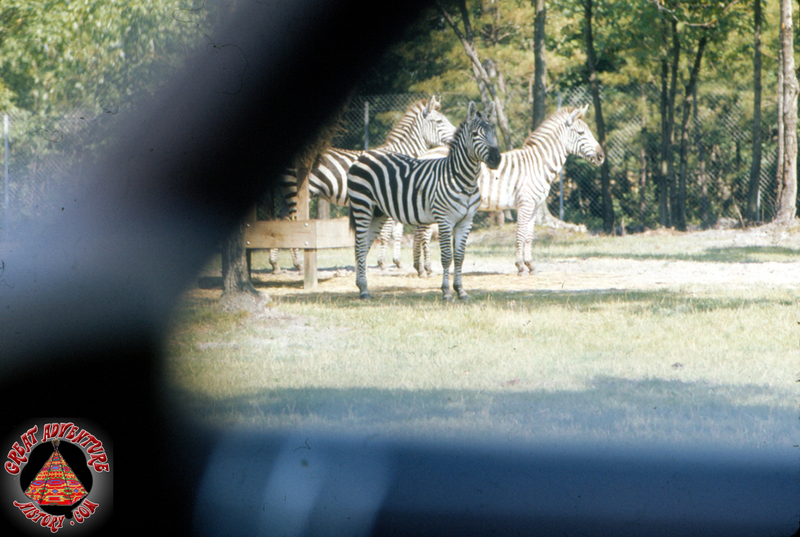 Observant patrons might have also noticed that wardens in the carnivore sections had rifles mounted on the back window of their Safari jeeps. 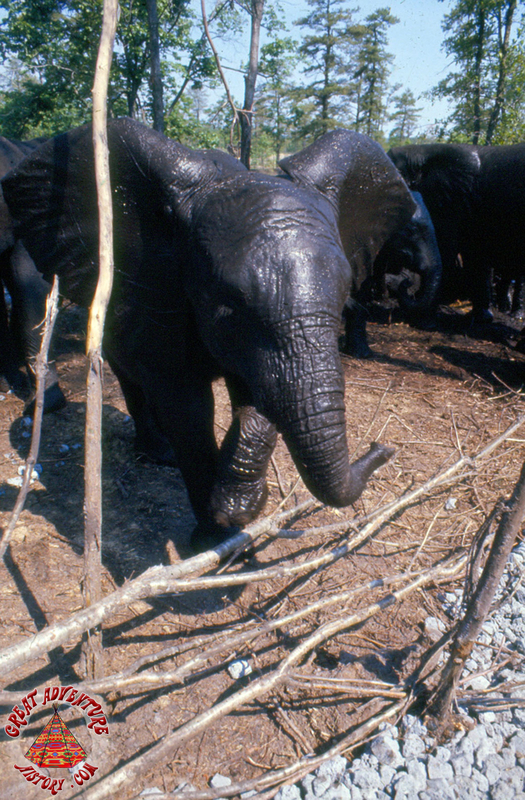 These were meant to serve purely as a last resort measure in a life threatening situation. 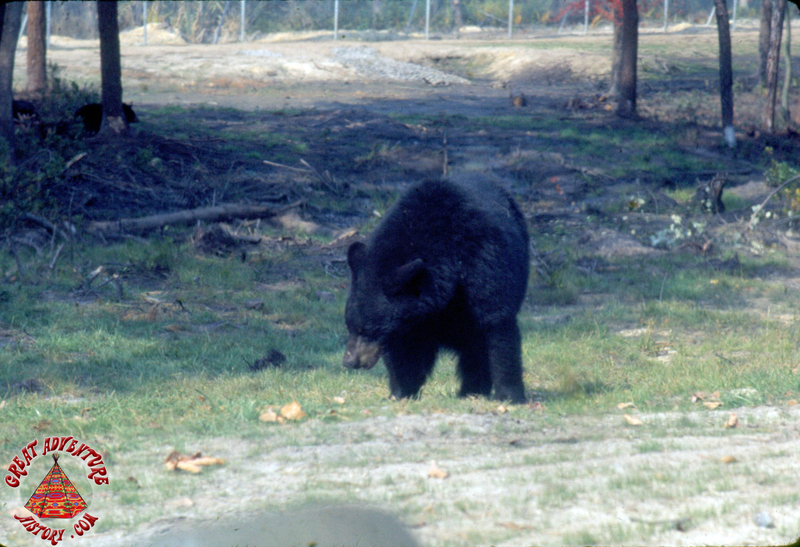 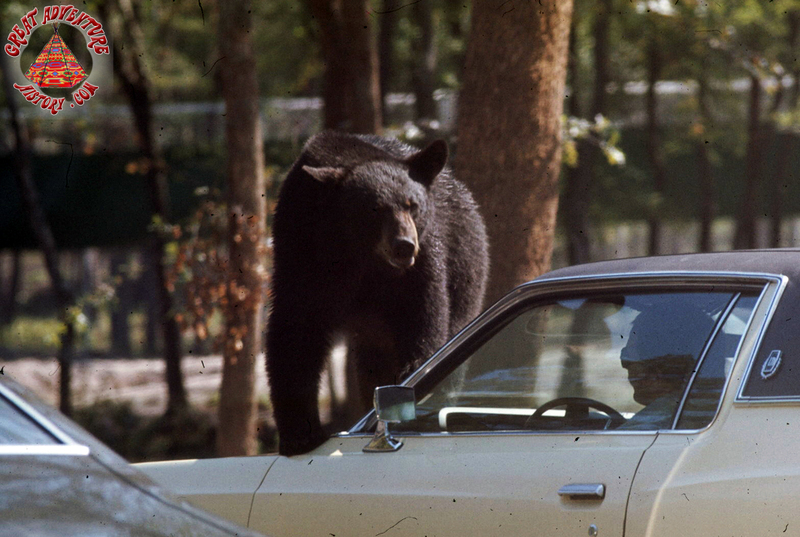 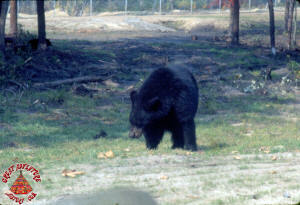 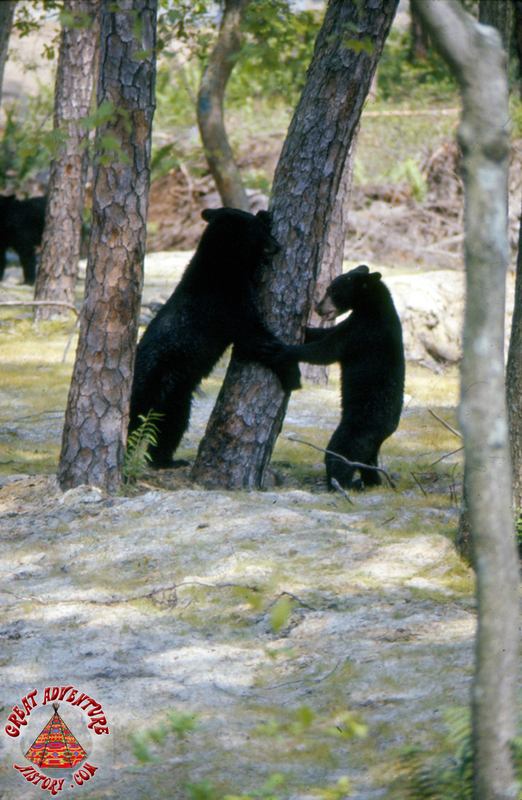 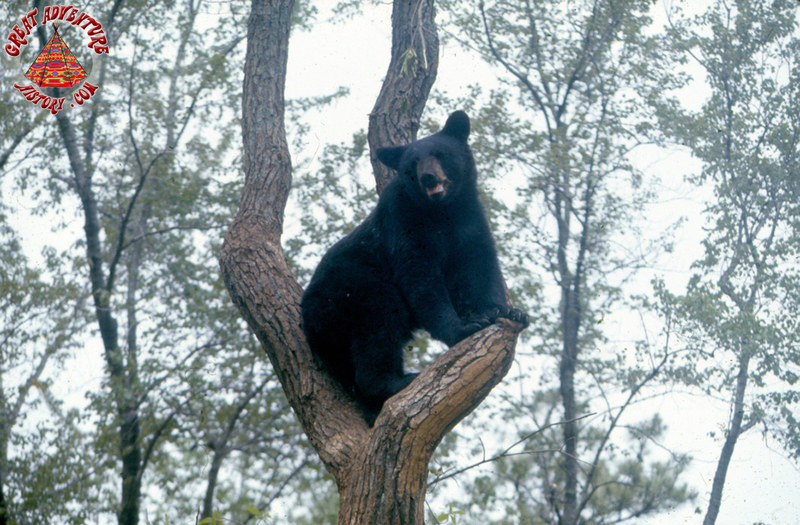 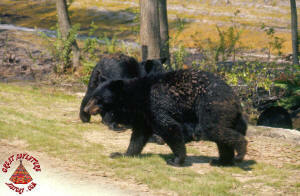 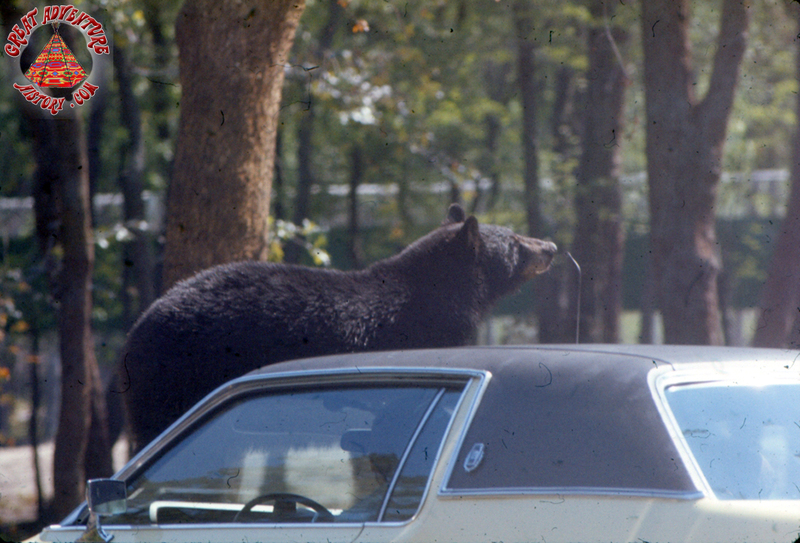 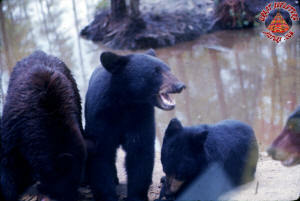 The black bears were the next area of the Safari, with the giant omnivorous animals wandering freely and even sitting on cars. Their keen noses could find any car with food in it and they would often need to be moved away by wardens to allow the vehicles to move on. 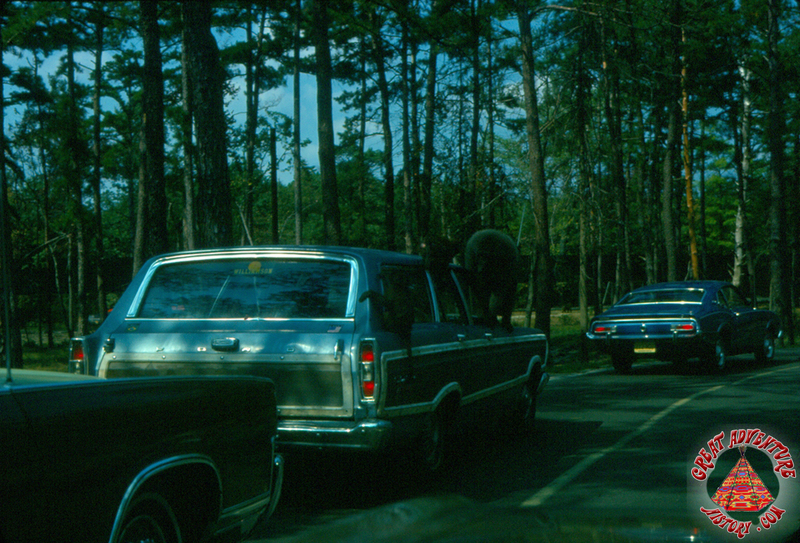 In the Safari's earliest days when the park had bumper to bumper traffic, it was requested that cars stay either in the left or right lanes and only use the center lane to switch sides. 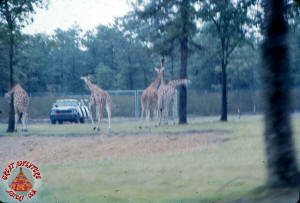 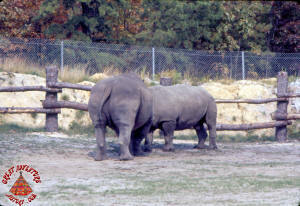 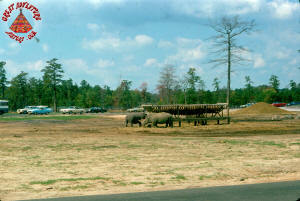 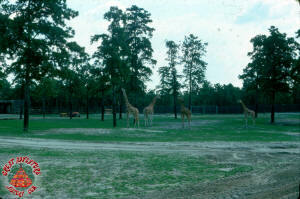 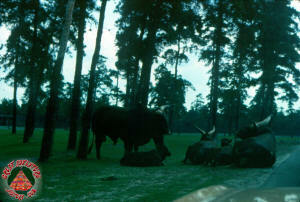 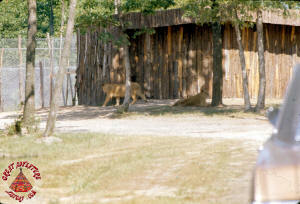 The center lane was to be left open so that the Safari vehicles could patrol the park. 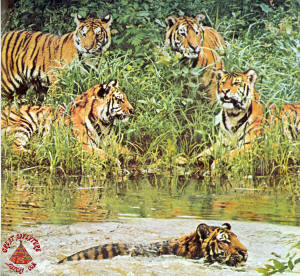 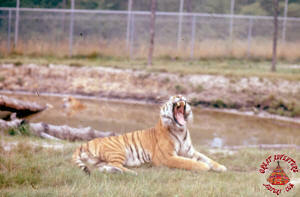 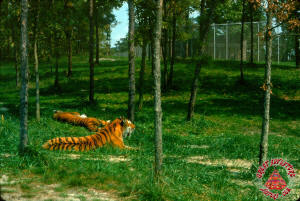 The Bengal tigers, like the lions, had free reign of their area. The giant cats could wander right up to the passing cars, though most of the time they spent their days laying in the shade or the watering hole. 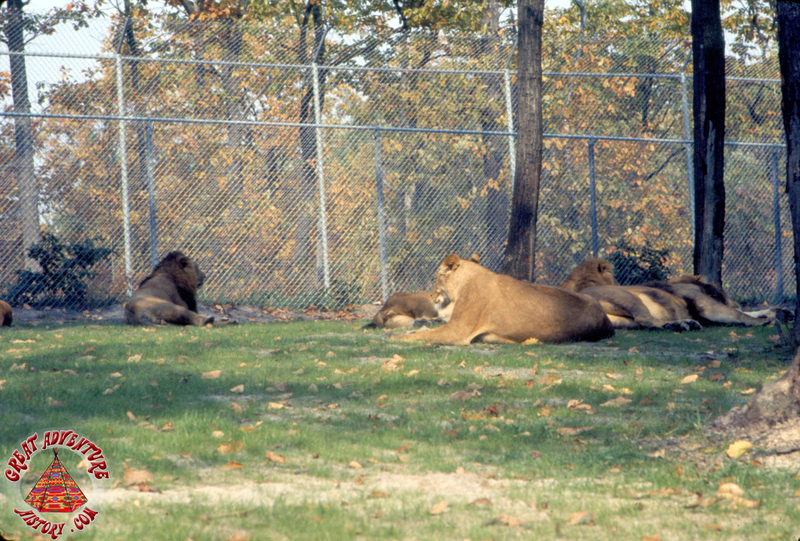 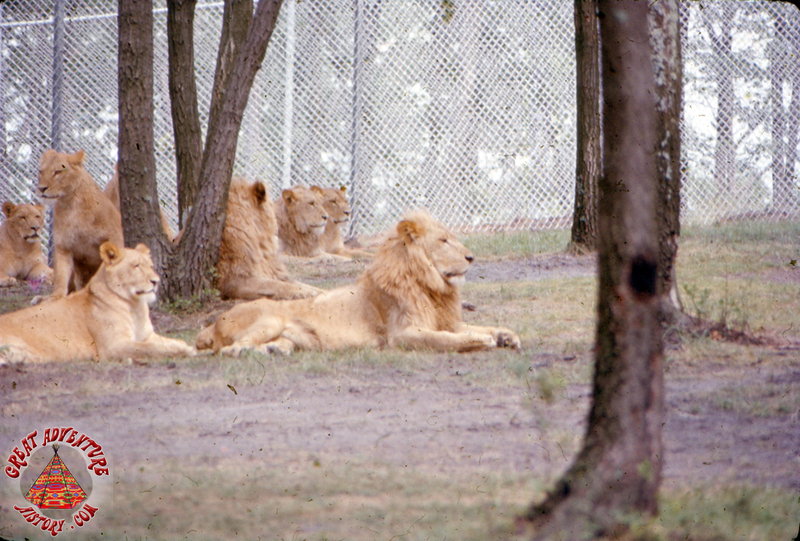 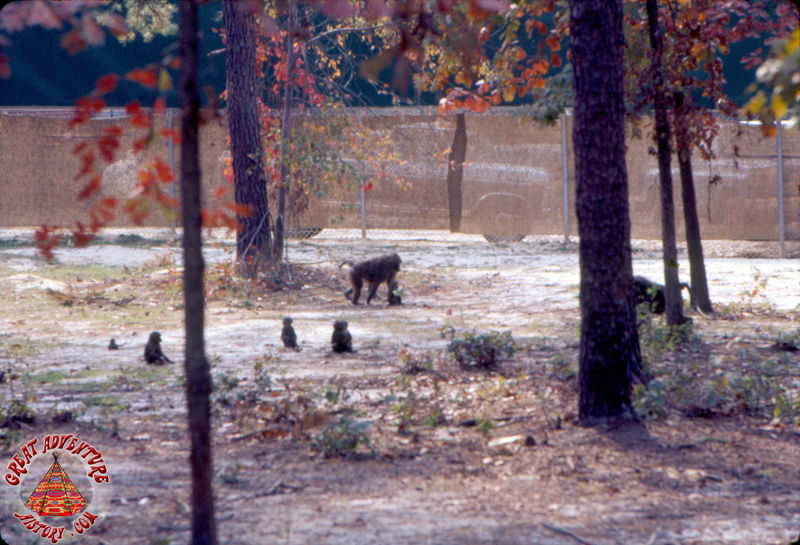 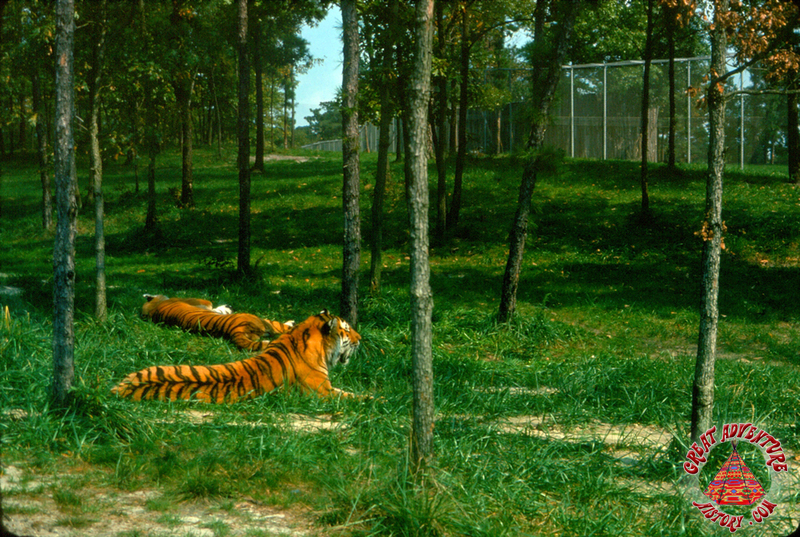 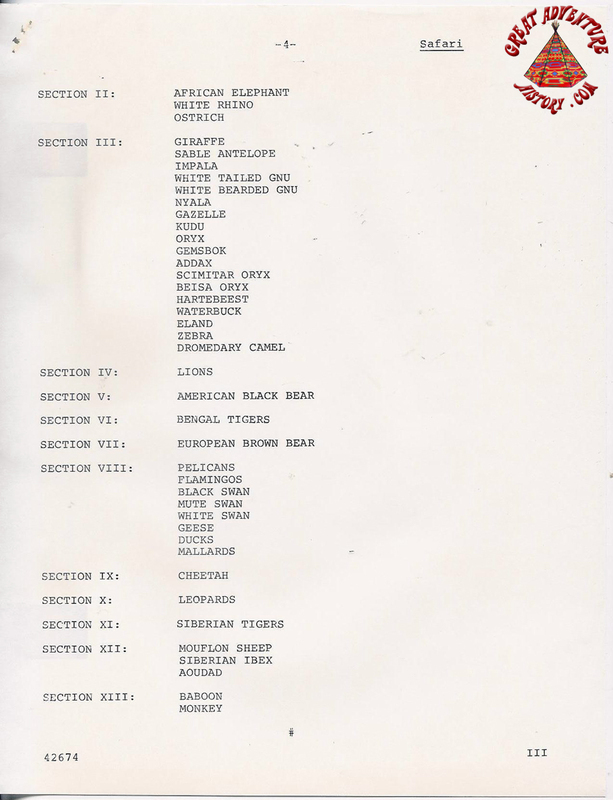 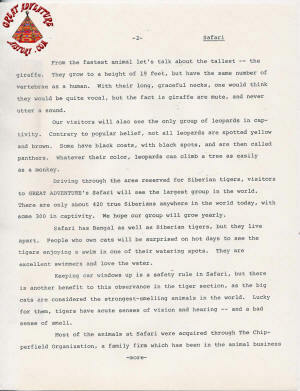 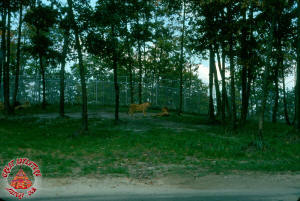 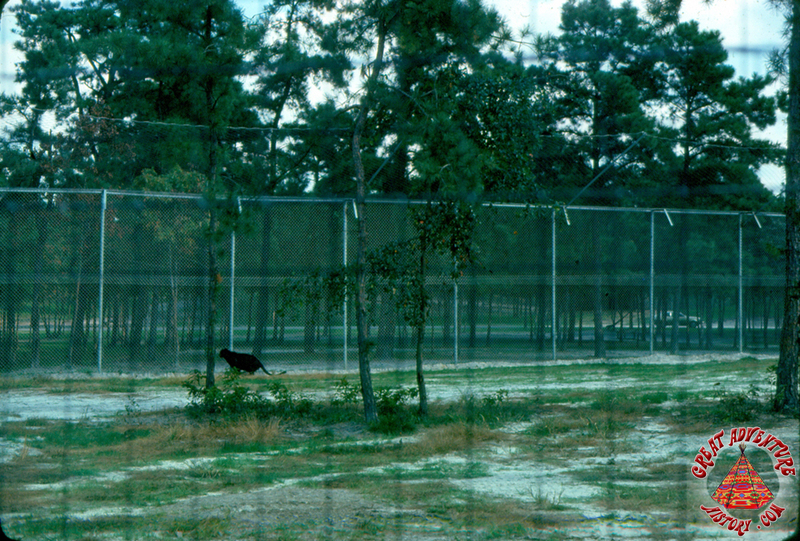 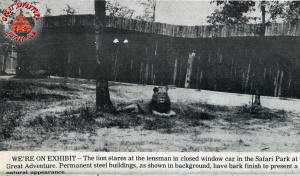 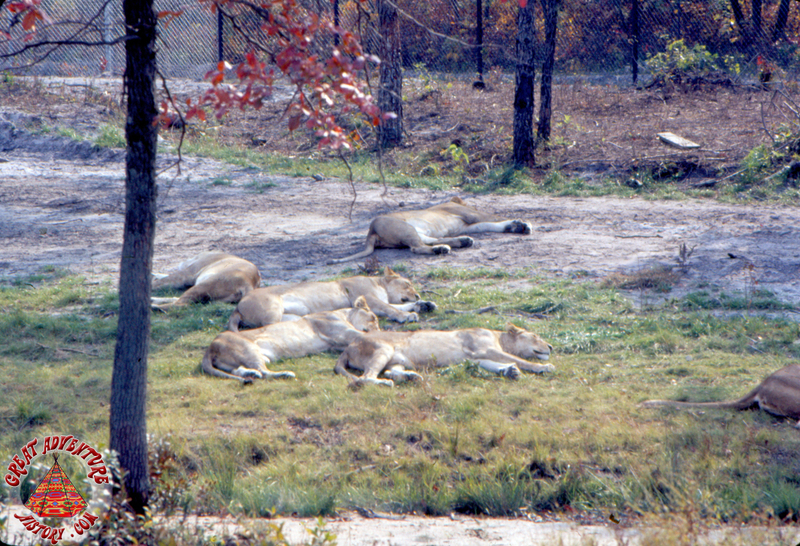 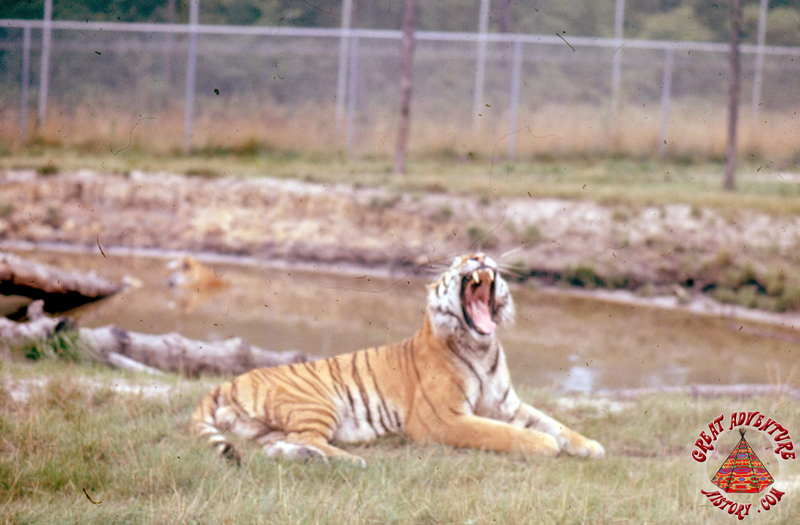 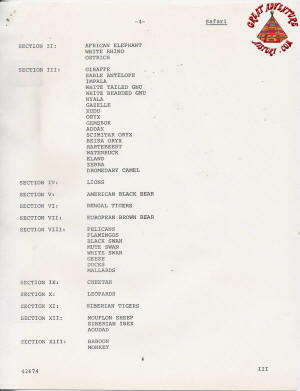 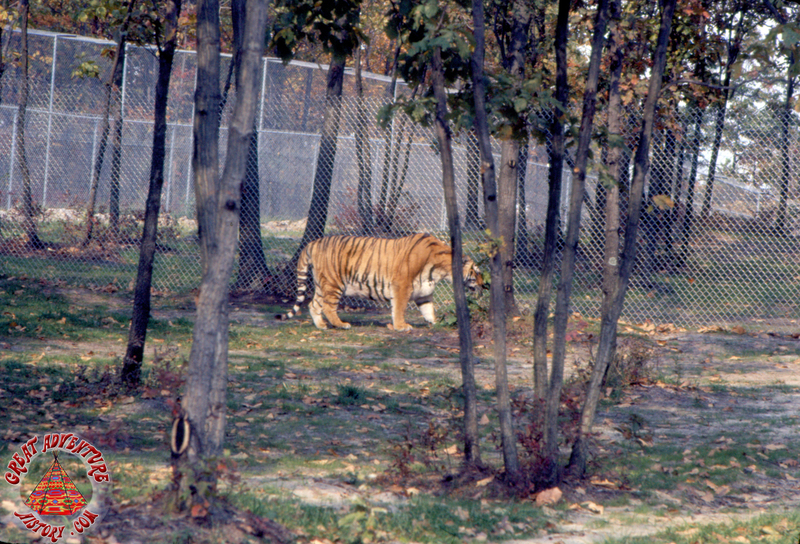 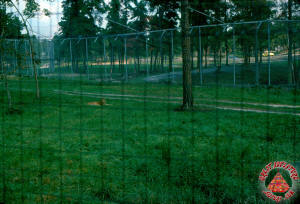 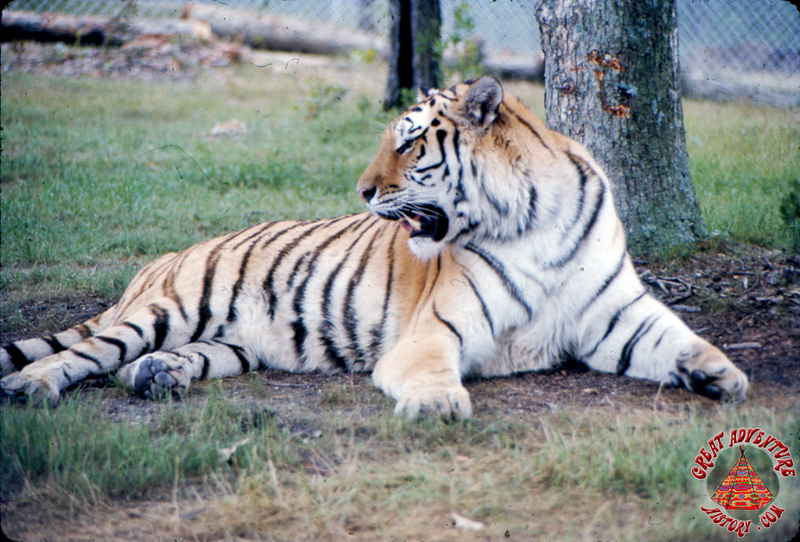 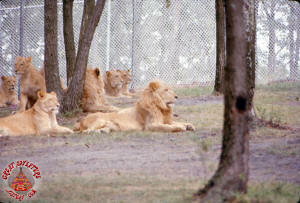 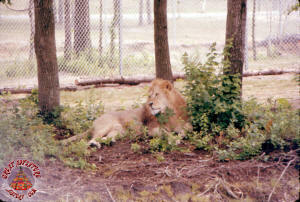 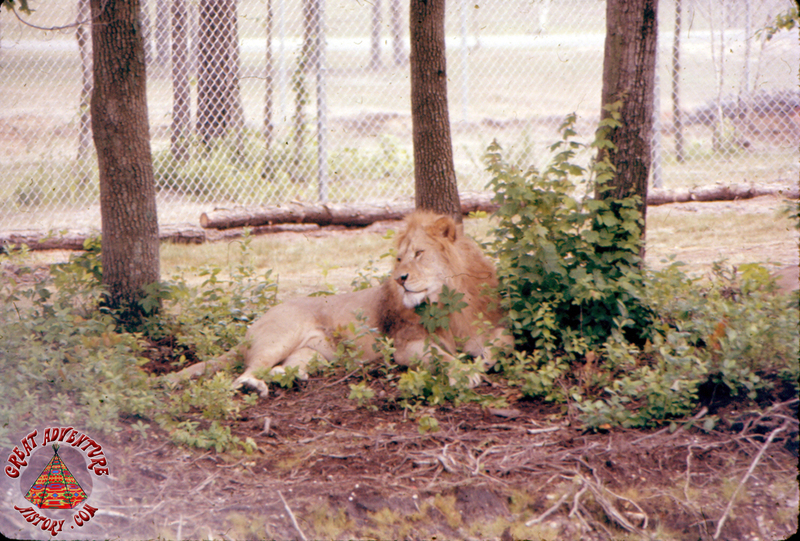 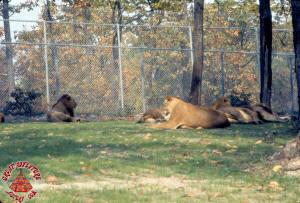 When the Safari opened in 1974 it had several large cat areas. Overtime some of these regions were converted into other realms including a new Australian section which opened in 1979. 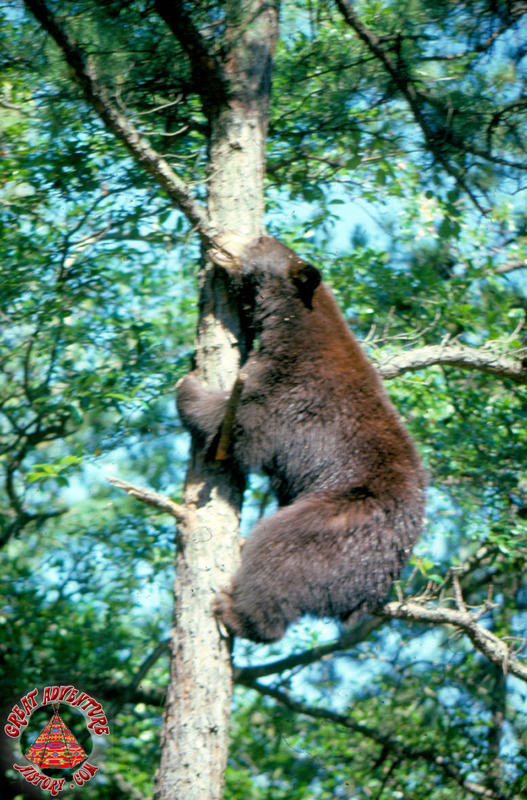 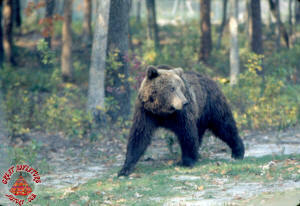 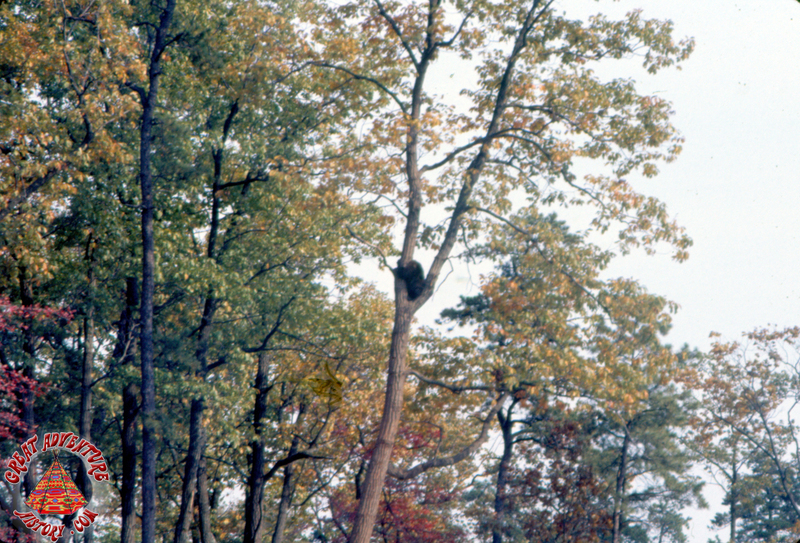 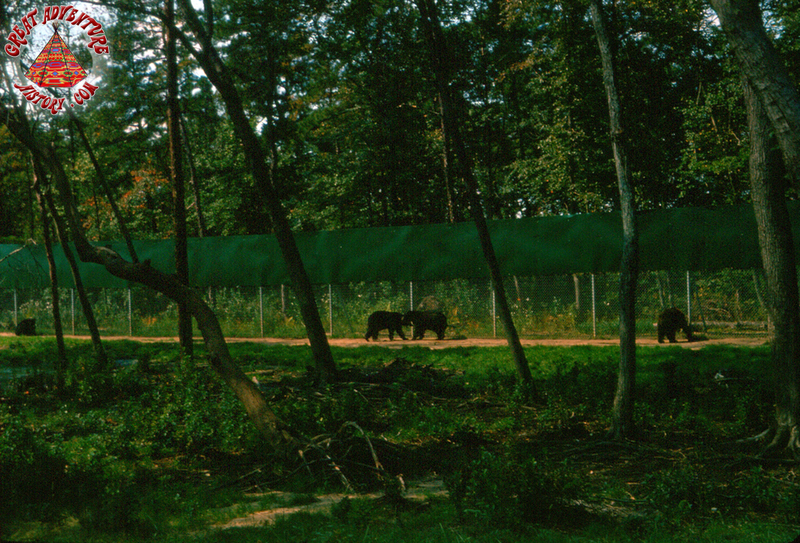 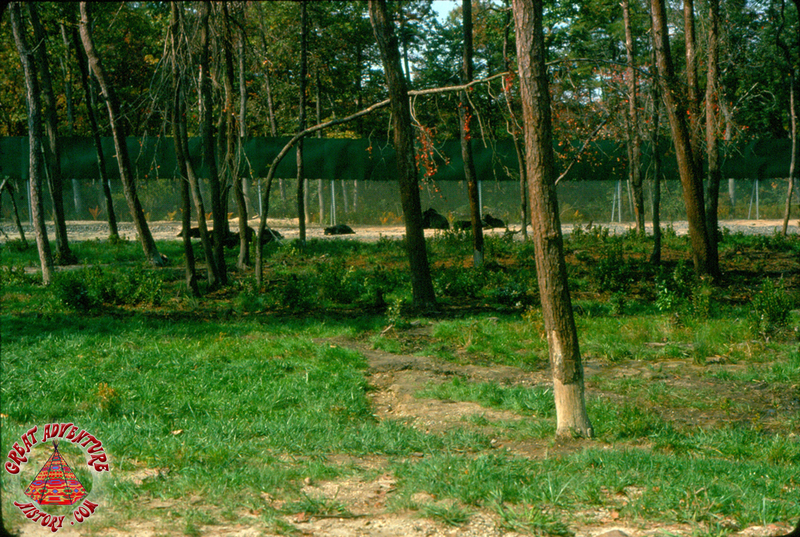 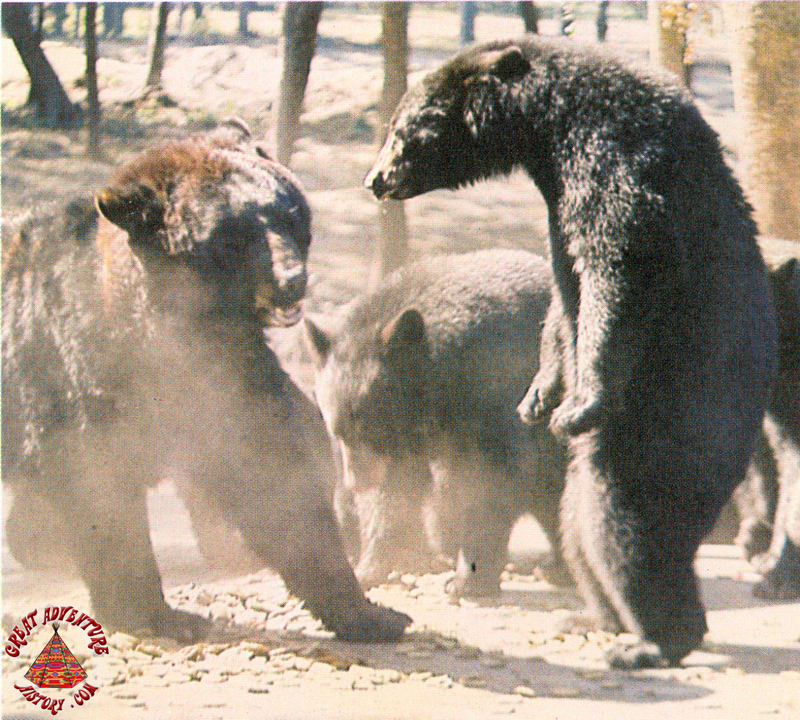 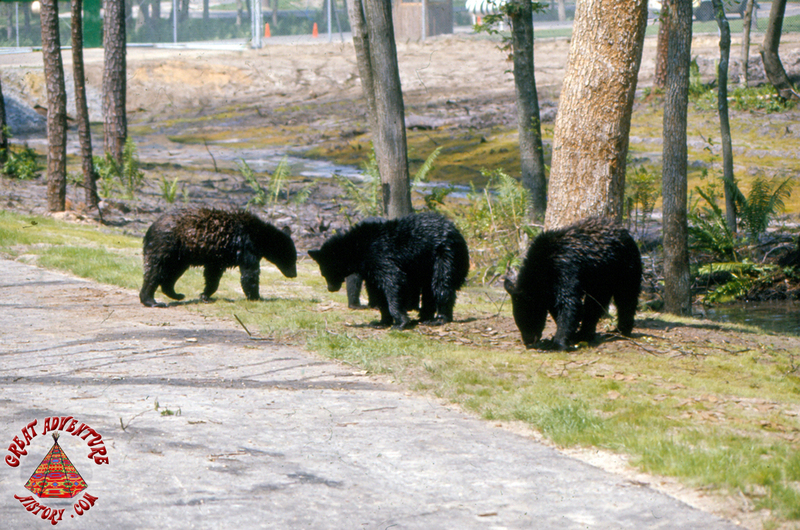 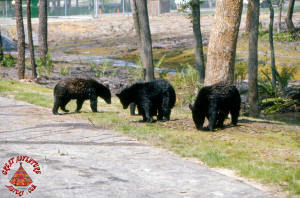 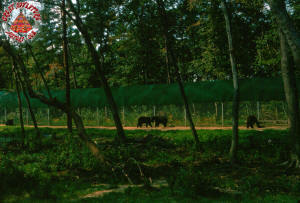 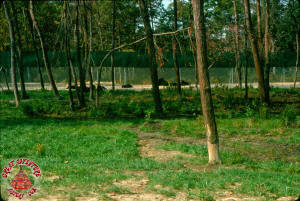 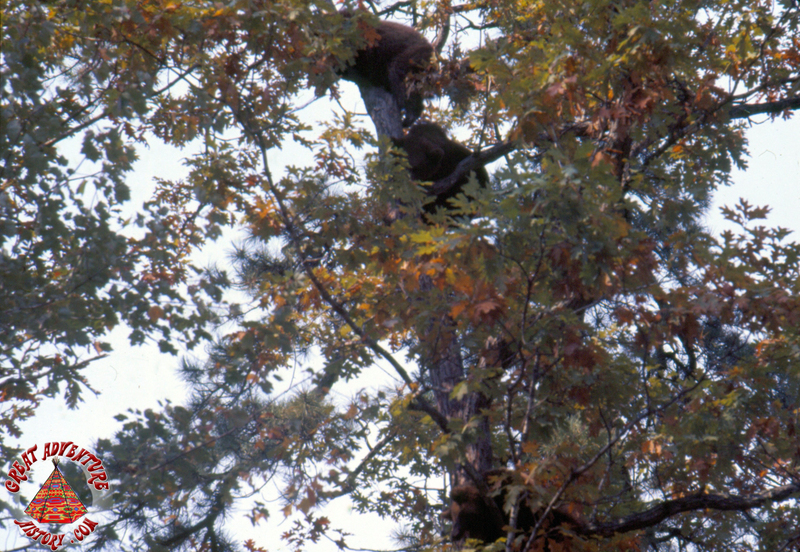 The European brown bears were the next group of animals encountered and their large section was also heavily wooded when the Safari first opened. 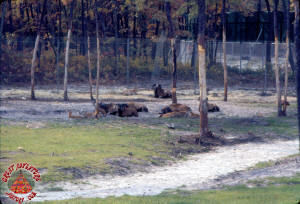 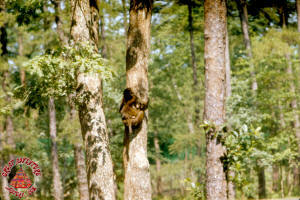 The woods also fell victim to the animals as they scratched, climbed and ate the leaves off the trees. 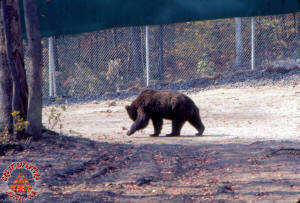 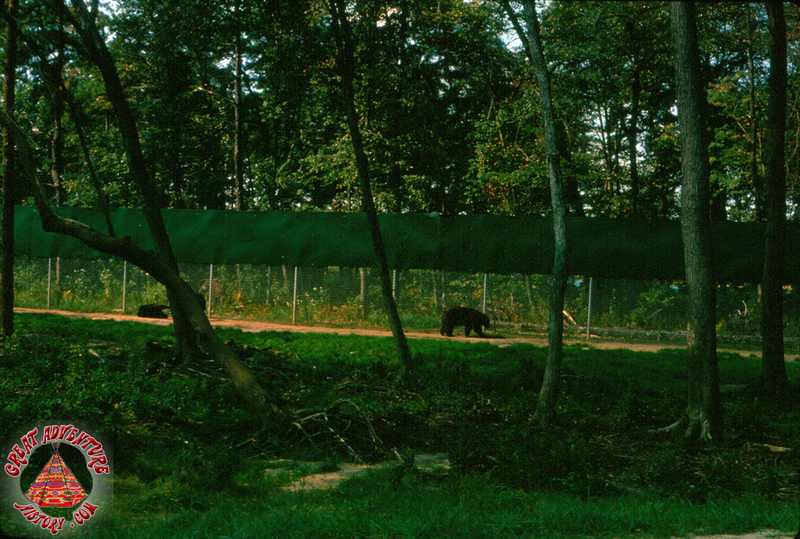 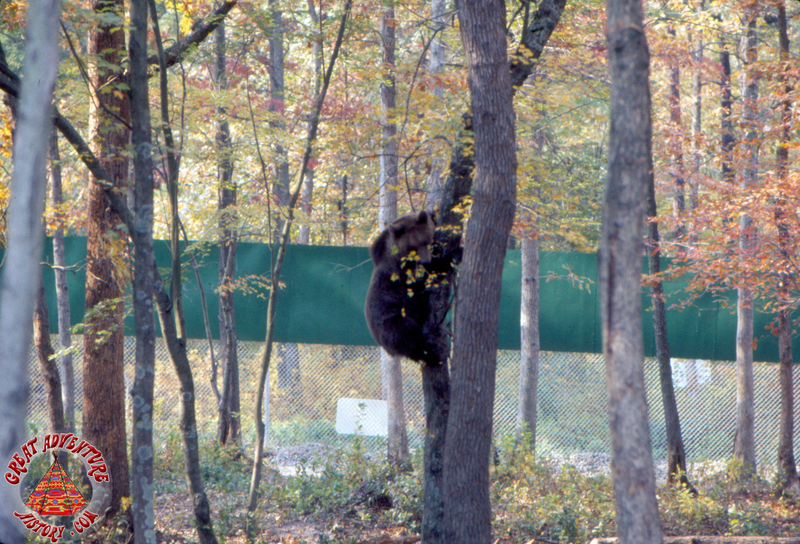 The brown bears also had free reign of their area initially, but for safety they would eventually be contained behind electric barriers. 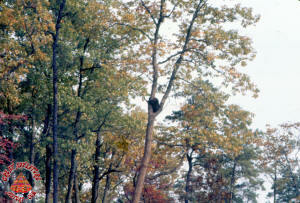 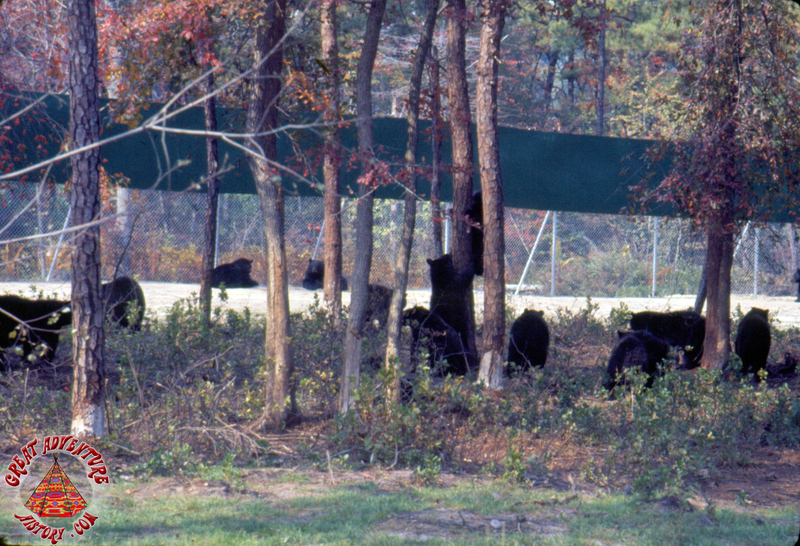 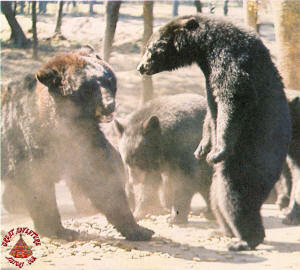 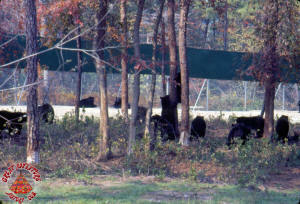 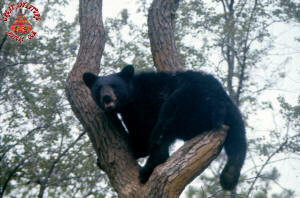 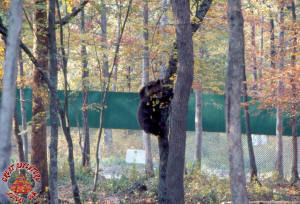 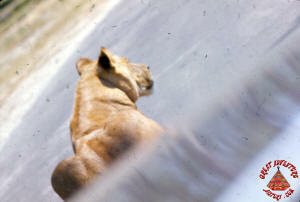 Often the bears would climb under passing cars and try to nap beneath the vehicles. 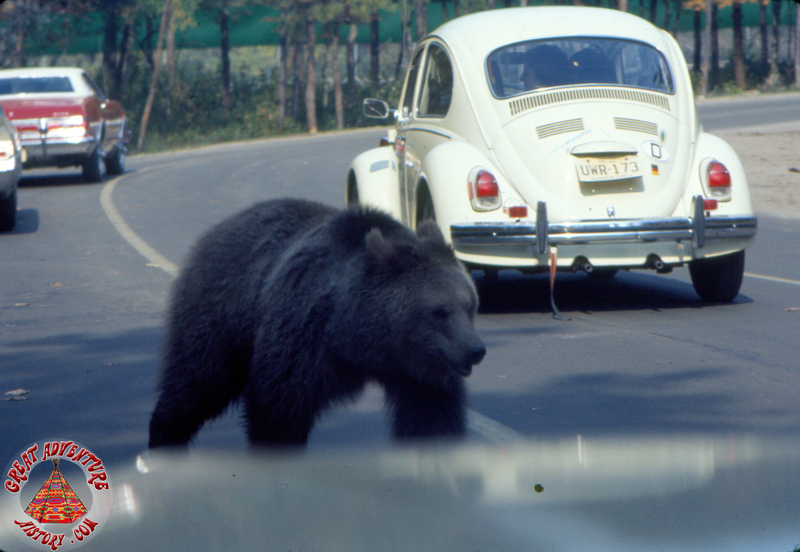 This obviously caused great delays as well as a dangerous situation for the wardens that had to nudge out the sleeping bears. 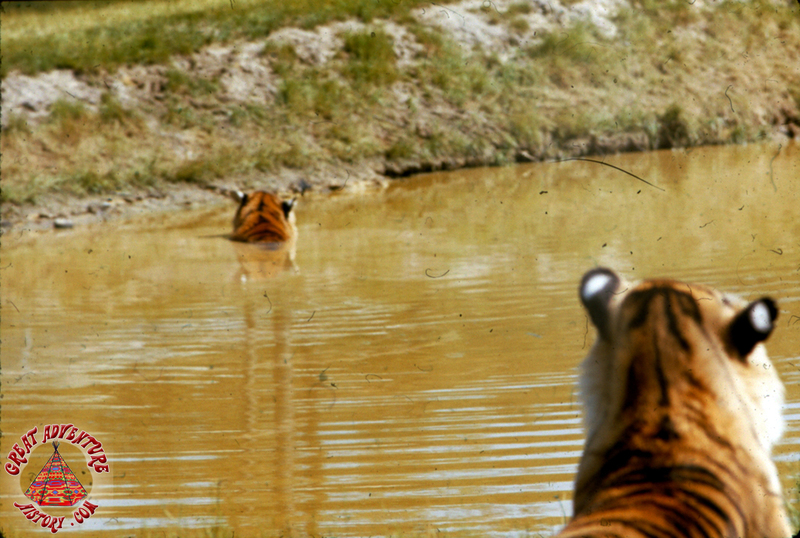 At the lowest point of the Safari, a natural pond formed. 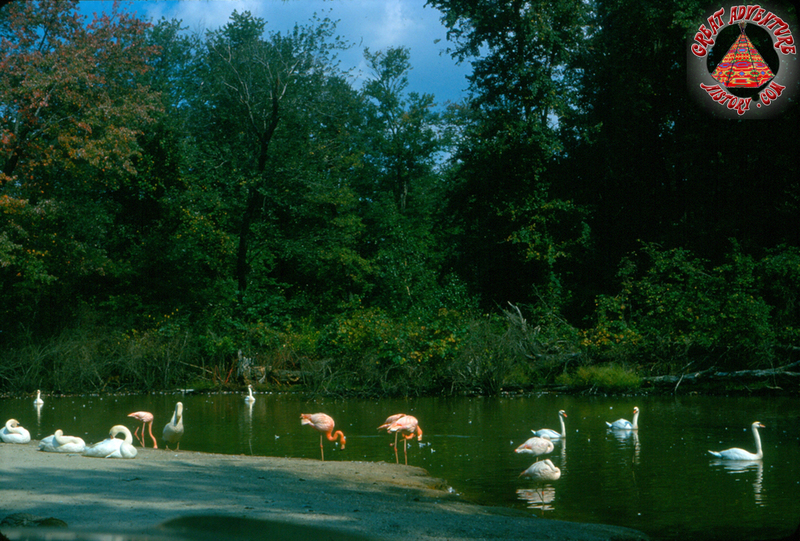 The native woodlands were left undisturbed and this area became the bird sanctuary, with exotic species like flamingos side by side with native species like mallards and Canadian geese. 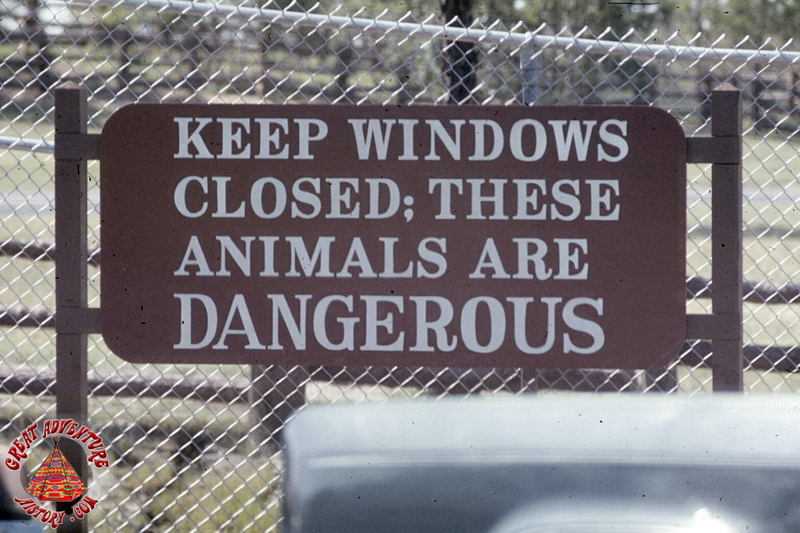 The most dangerous animals in the Safari were the cheetahs, leopards, and Siberian tigers, all of which kept behind fences for safety. 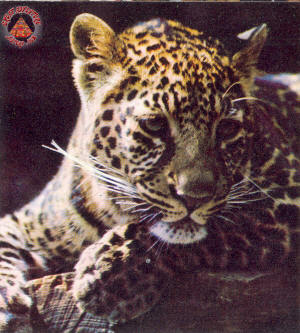 The leopards, which included yellow spotted, brown spotted, and black spotted with black coats (panthers) made up the only group of cats of its kind in captivity at the time. 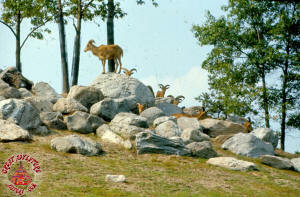 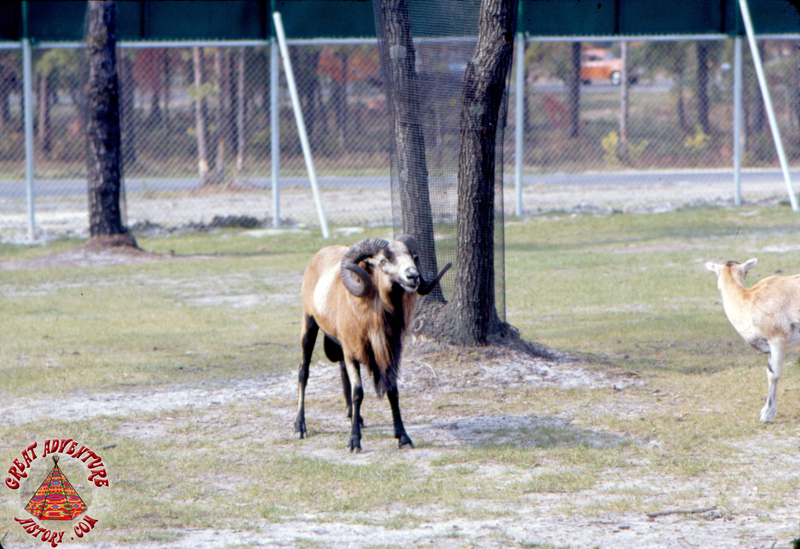 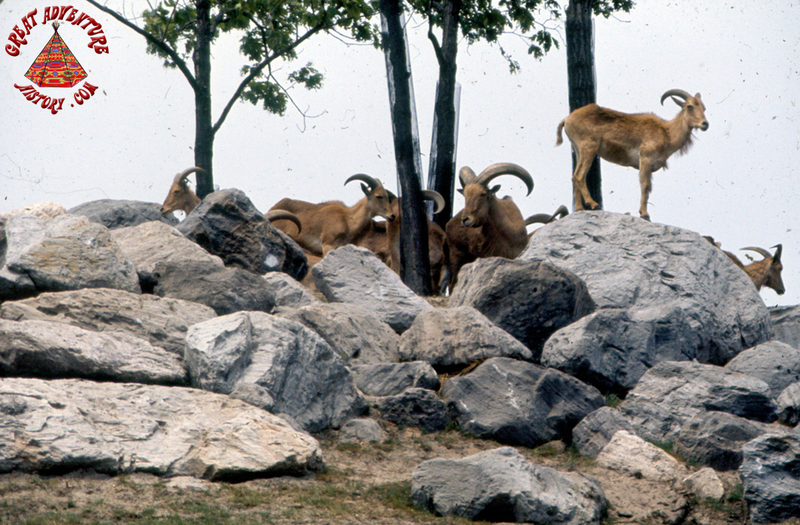 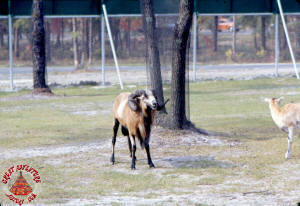 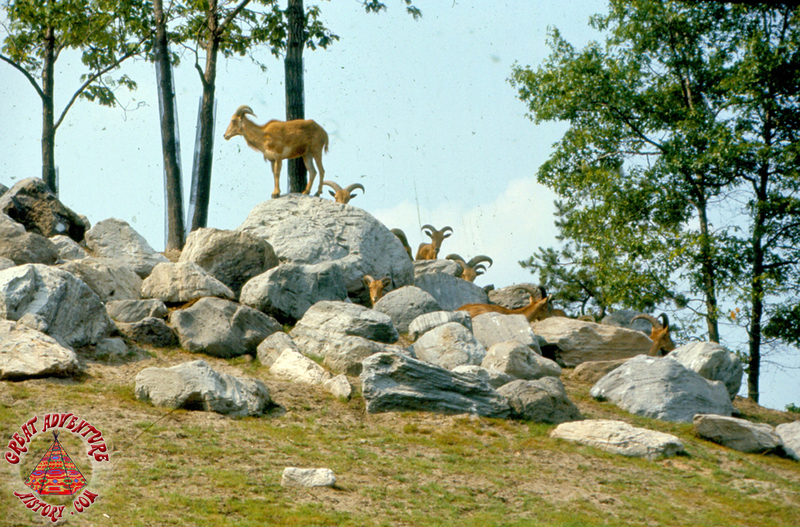 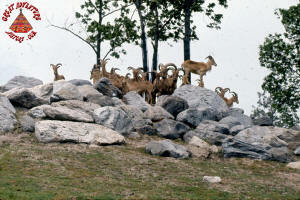 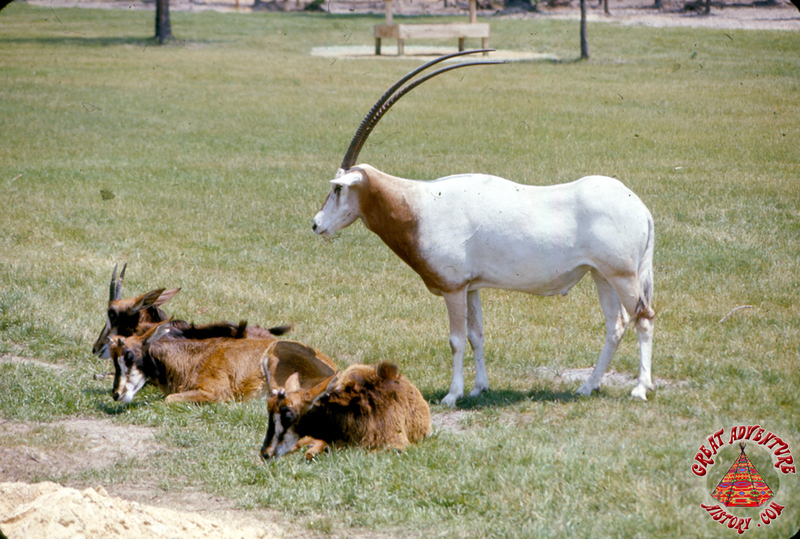 After leaving the predators area gates, guests came to a region of more grassland animals like mountain goats, aoudad, and ibex. 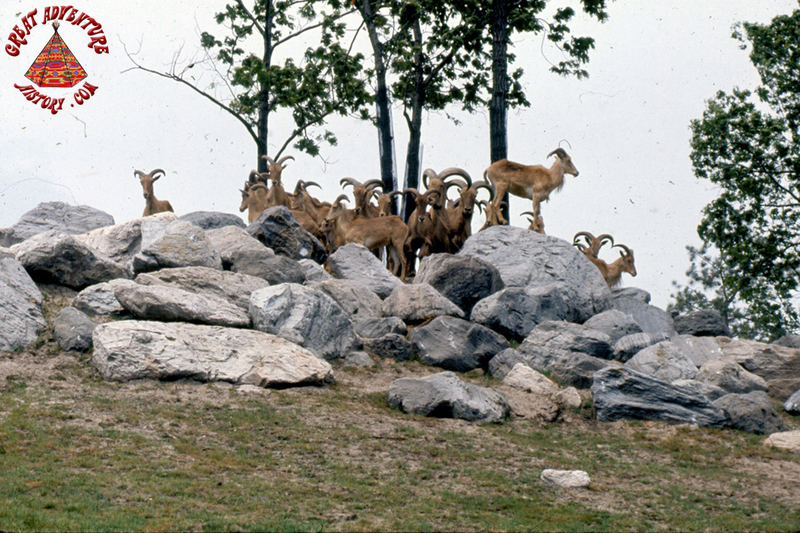 This area contained the largest manmade change in elevation at the park so that some of the species could climb on the abundant rocks. 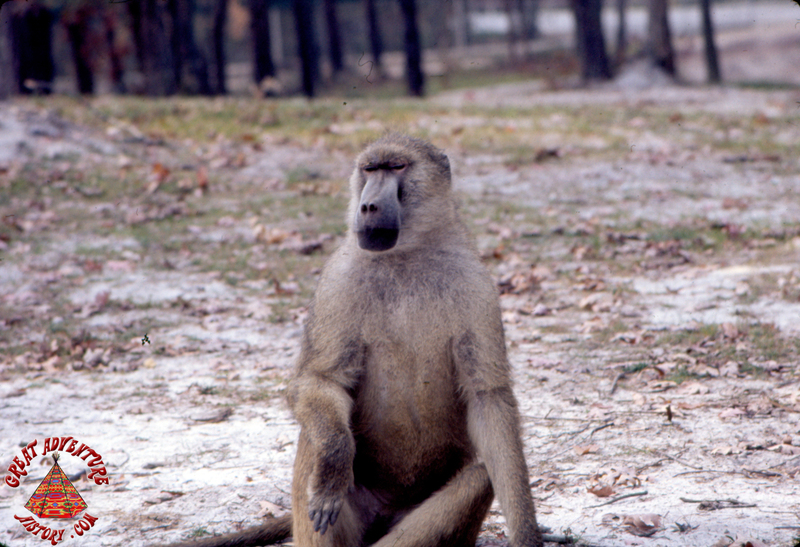 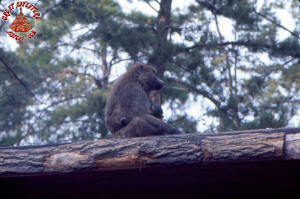 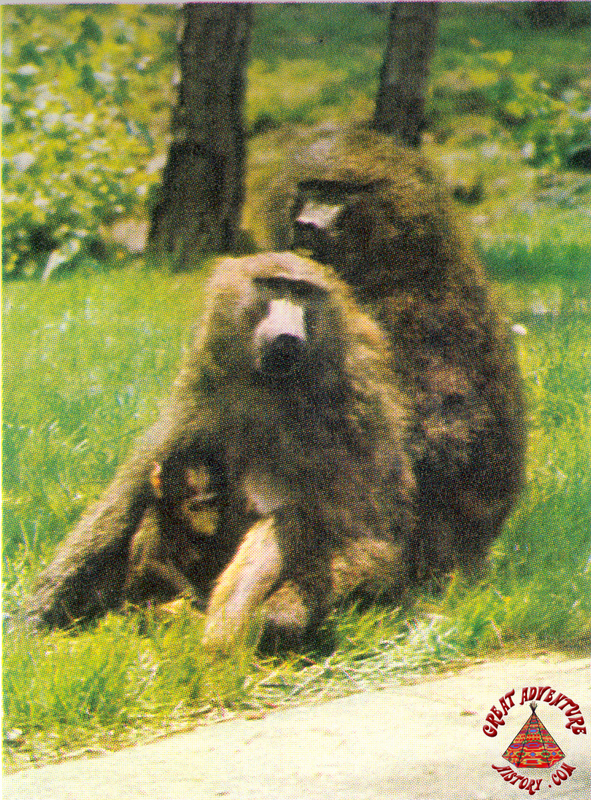 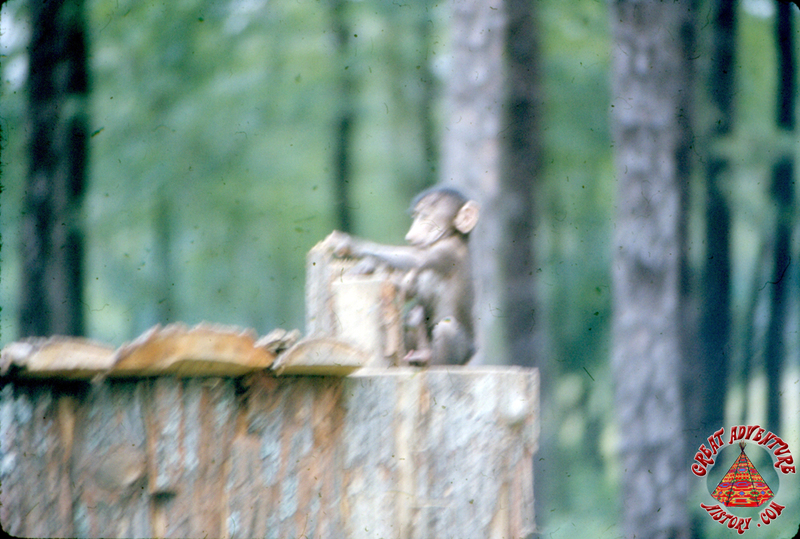 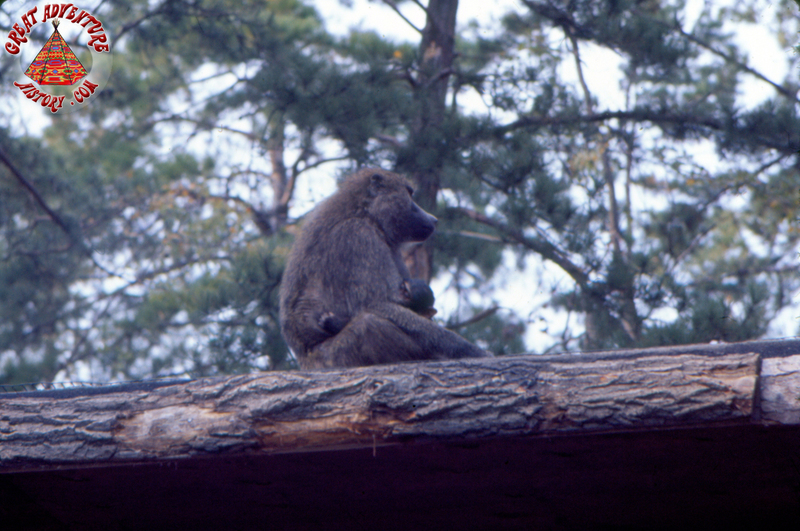 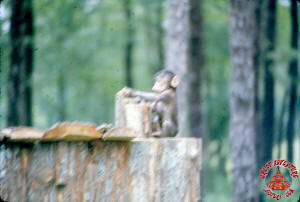 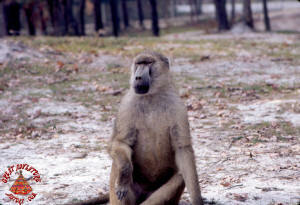 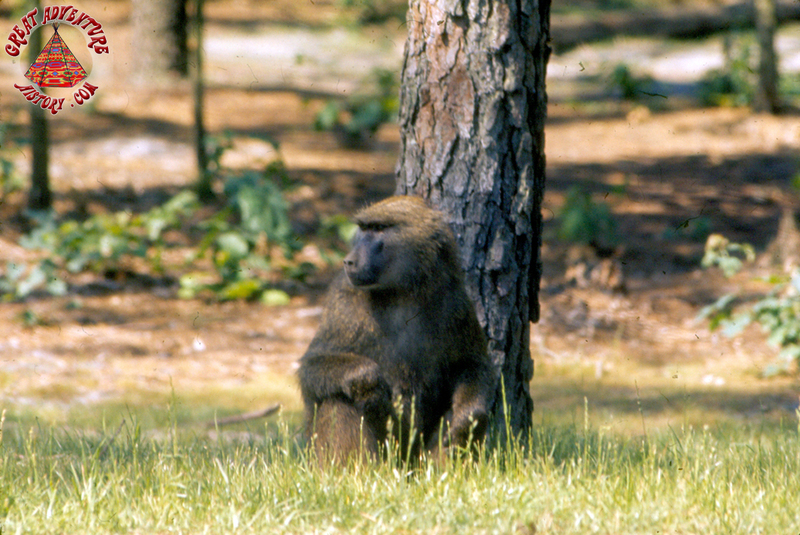 The final, and most memorable section of the Safari for most guests was the monkeys and baboons. 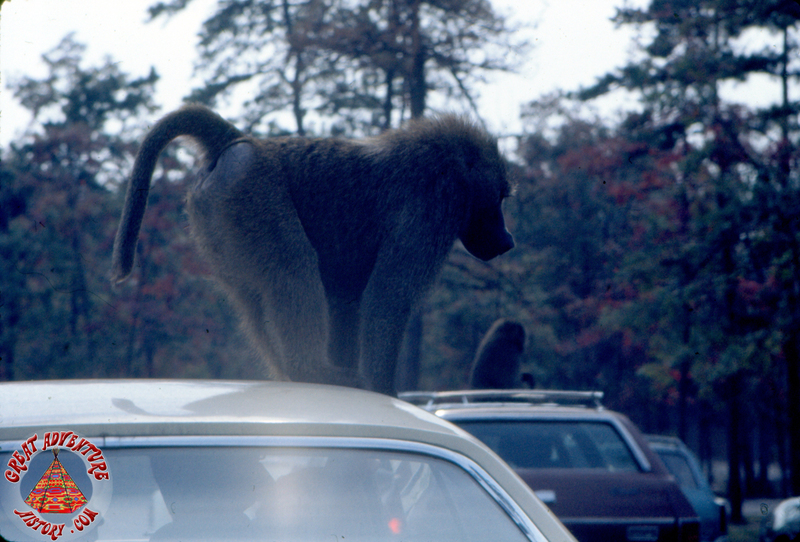 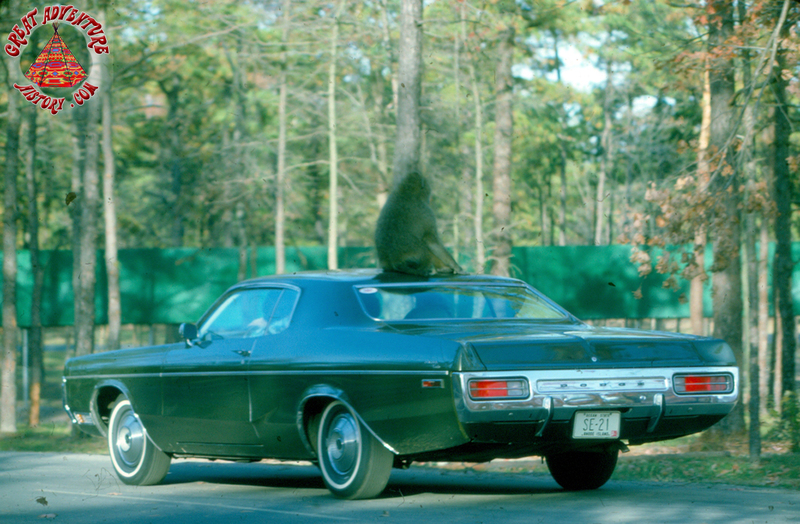 The curious animals had no fear at all with the vehicles and often climbed all over the passing cars. They would sometimes become destructive, tearing off wipers, antennas, lights and anything else they could pull off. 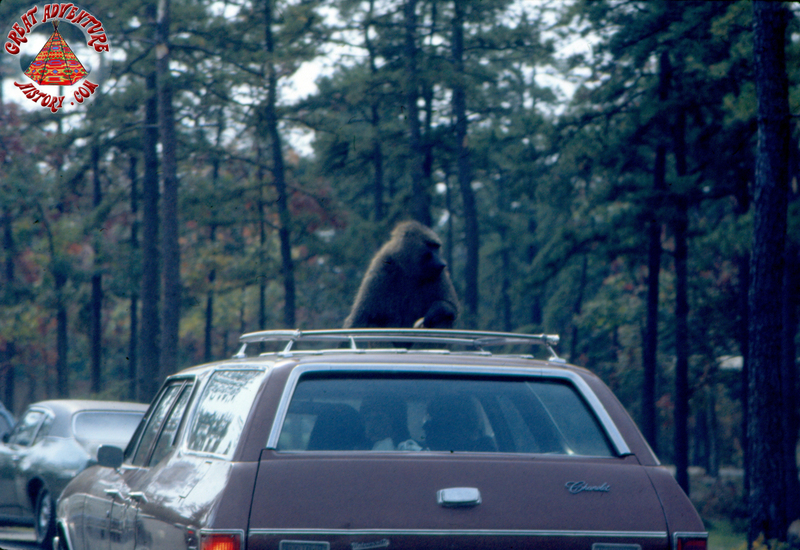 For this reason, canvas tops were not allowed and a bypass road was created in 1975. 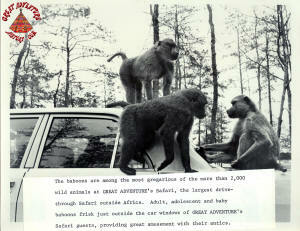 The clever monkeys would also jump into the beds of pickup trucks as they attempted to escape through the exit gate. 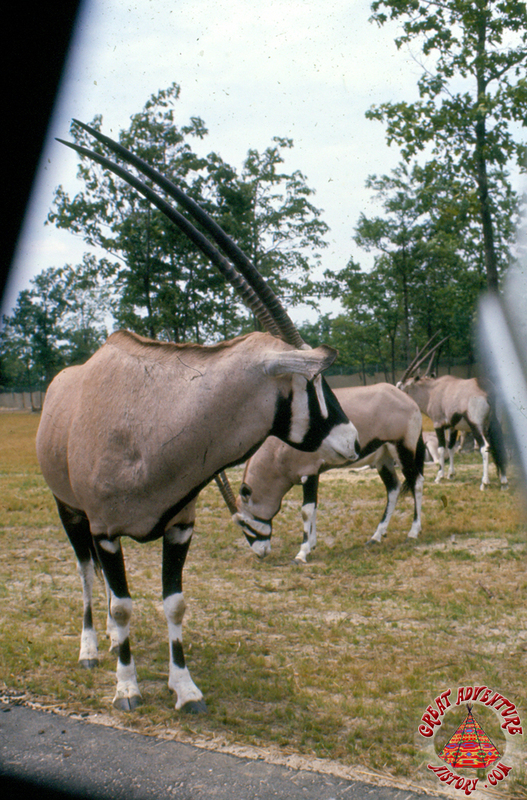 The wardens often had their hands full shooing the animals back into the Safari. 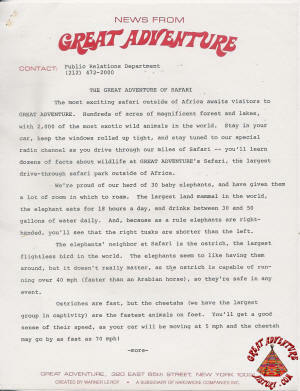 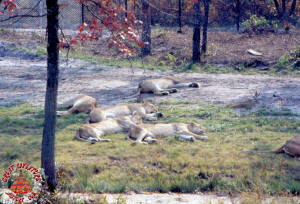 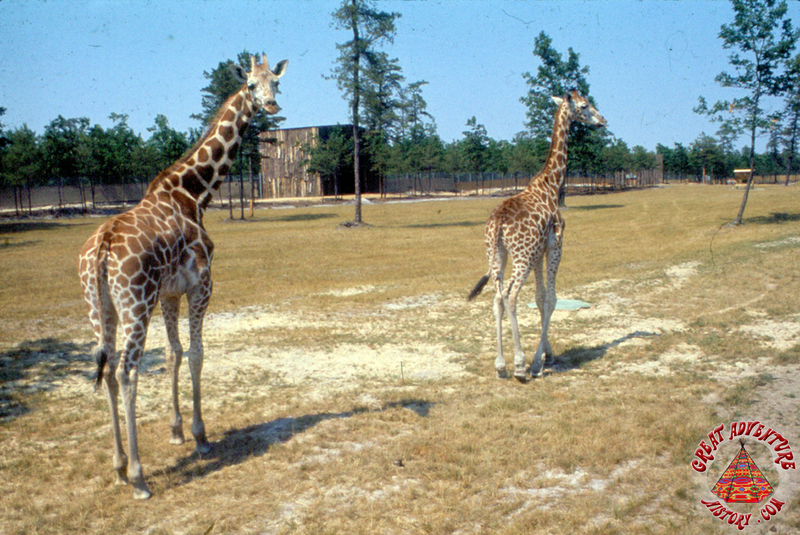 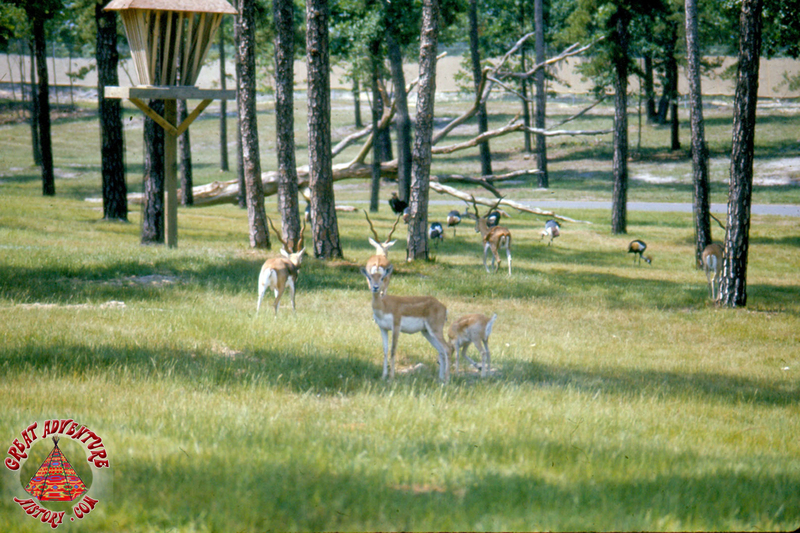 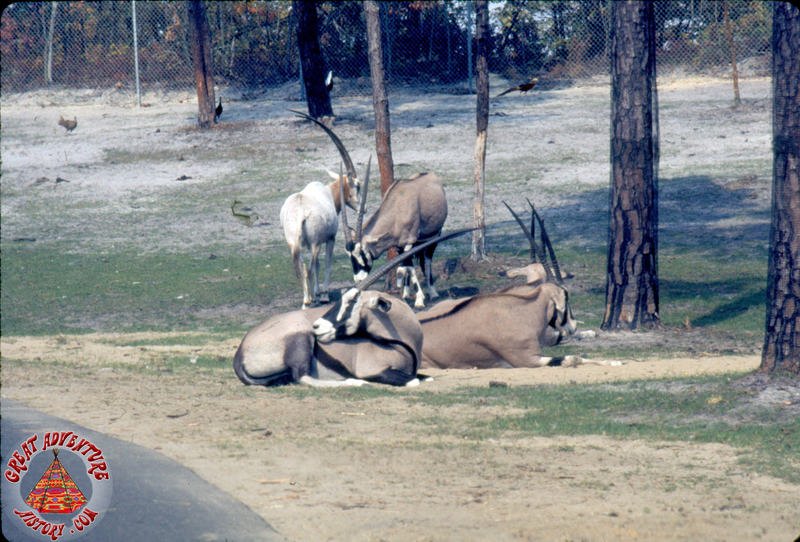 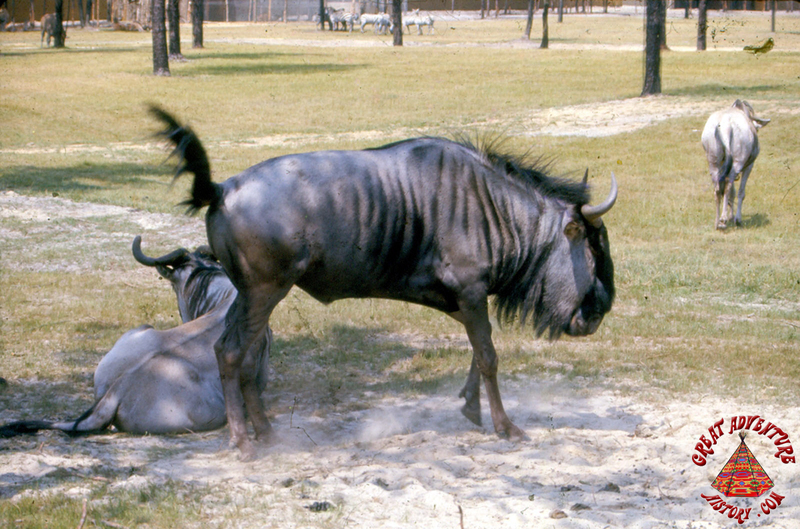 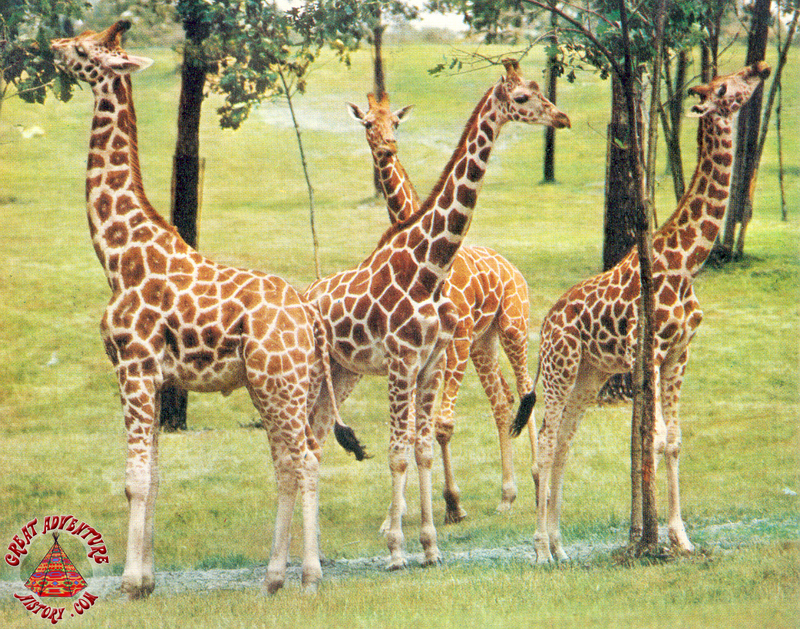 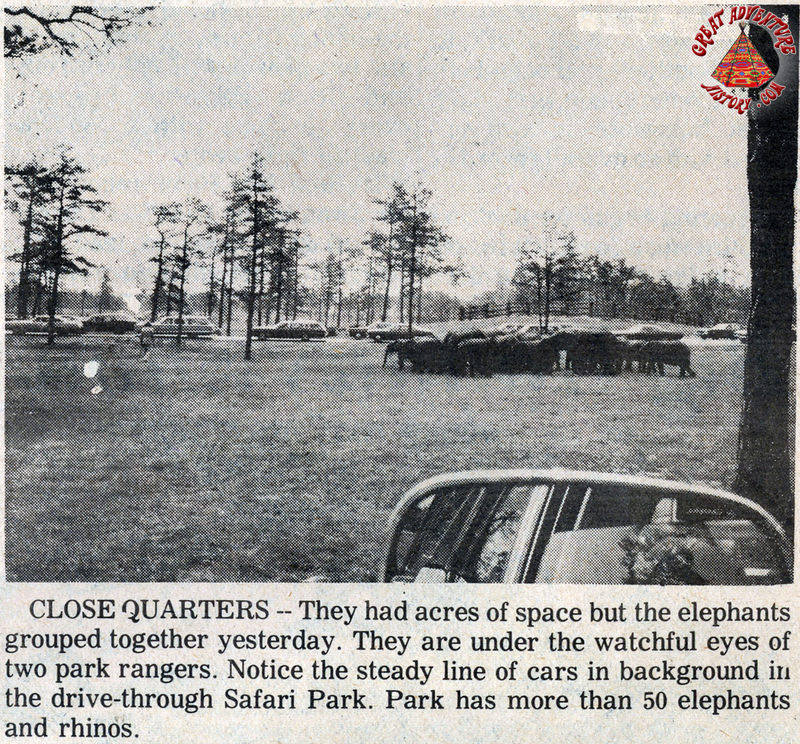 The scale and scope of the Safari was something really unique about Great Adventure, and originally the Safari was as much a draw for Great Adventure as the Enchanted Forest theme park. The huge variety of species and the sheer number of animals that could be seen along the journey was and always has been a unique experience found nowhere else in the world.